Four bases are in Caretaker Status. 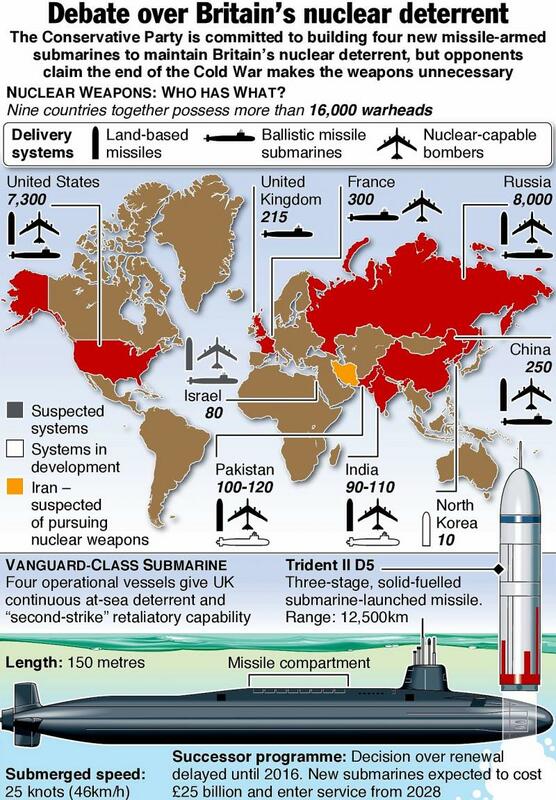 Five non-nuclear countries are assigned nuclear strike mission. ﻿Caretaker status means a non operating condition in which the installations mater- ial and facilities are in care and limited preservation status. 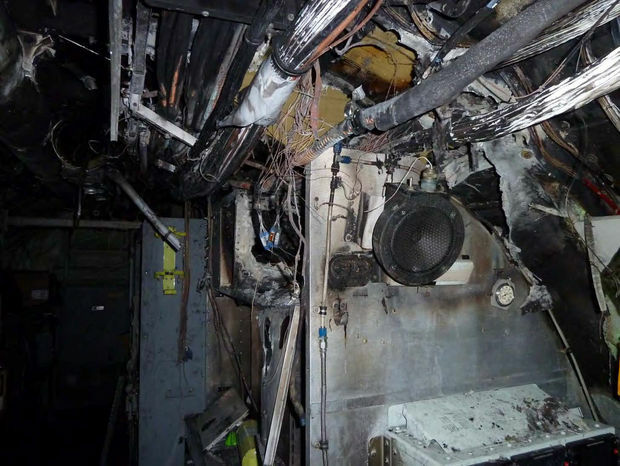 Only a minimum of personnel is required to safeguard against fire, test and damage from the elements. 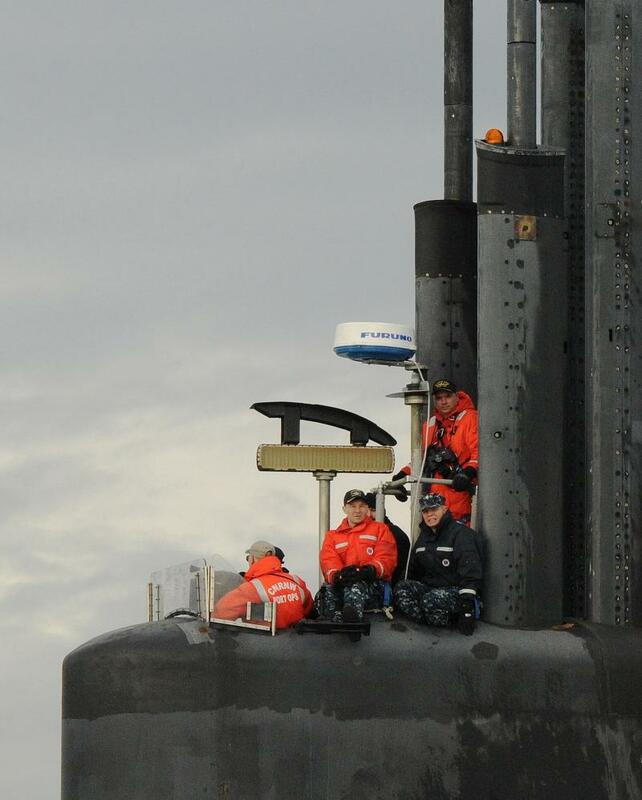 Air force and submarine bases and early warning radars together represent the back-bone of our defence. This is why I think this subject is important. 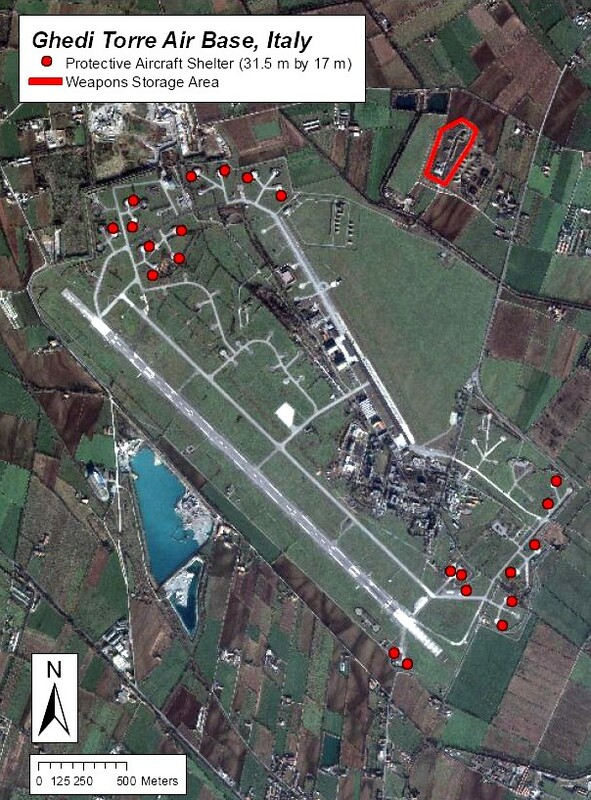 Below, you will find the latest on European nuclear bases, and some of the most important ones in the United States. Be vigi- lant and report suspicious activities. Together we must fight terrorism in all it's cruelty, and defeat ISIS. 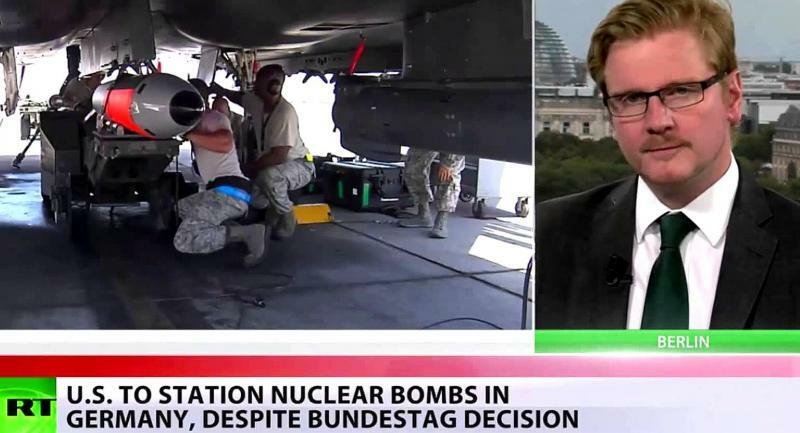 Europe and the U.S must not be the target of a "dirty" nuclear bomb! Stay tuned folks, cheers! 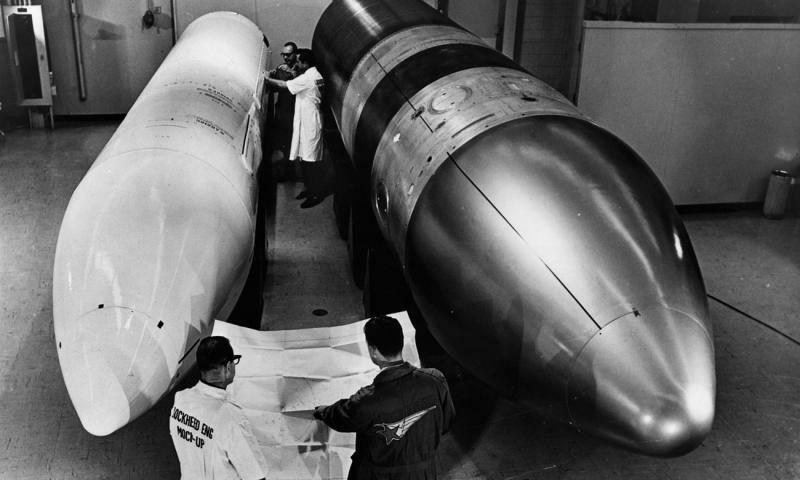 Definitions of deterrence vary, but a popular definition, put forward by the late promi- nent scholar, Kenneth Waltz, is that nuclear weapons dissuade states from going to war more surely than conventional weapons do. 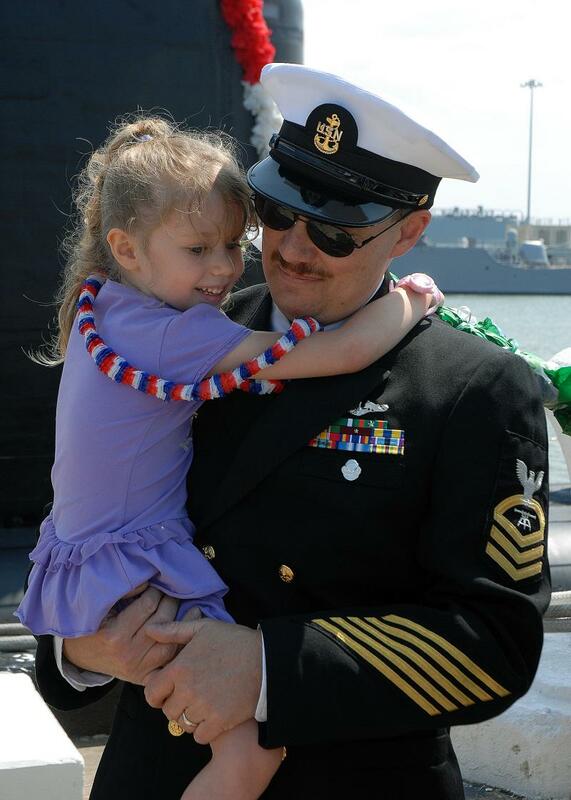 Credibility and capability are central to deterrence because of their influence over severity and surety of punishment. 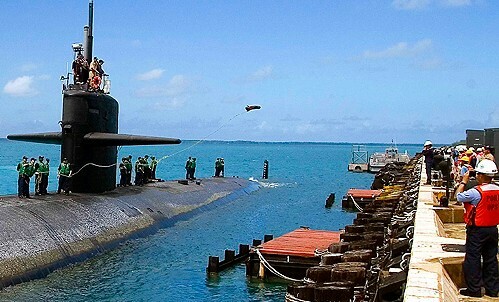 A credible and effective nuclear deterrent is underpinned by five criteria: readiness, reach, resolve, survivability/invulnerability and destructive power. 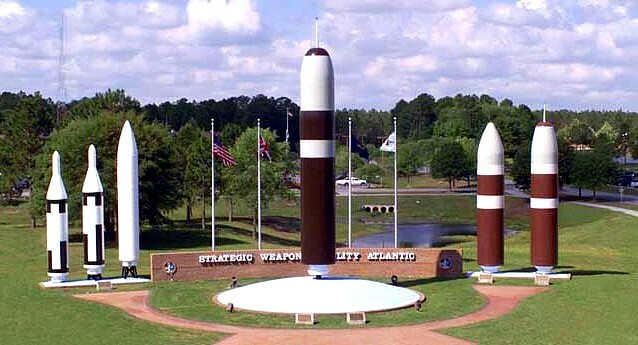 The nuclear arsenal of a state protects first and foremost that very state from external aggression. 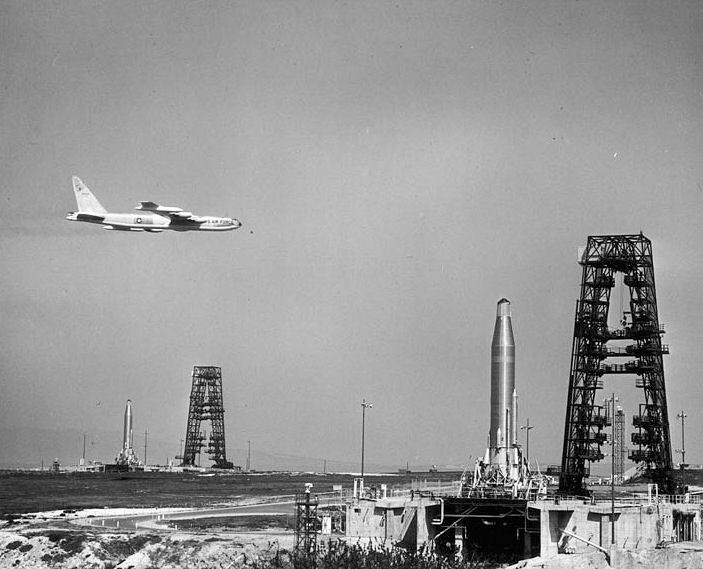 Nuclear weapons are therefore closely tied to notions of national sovereignty. 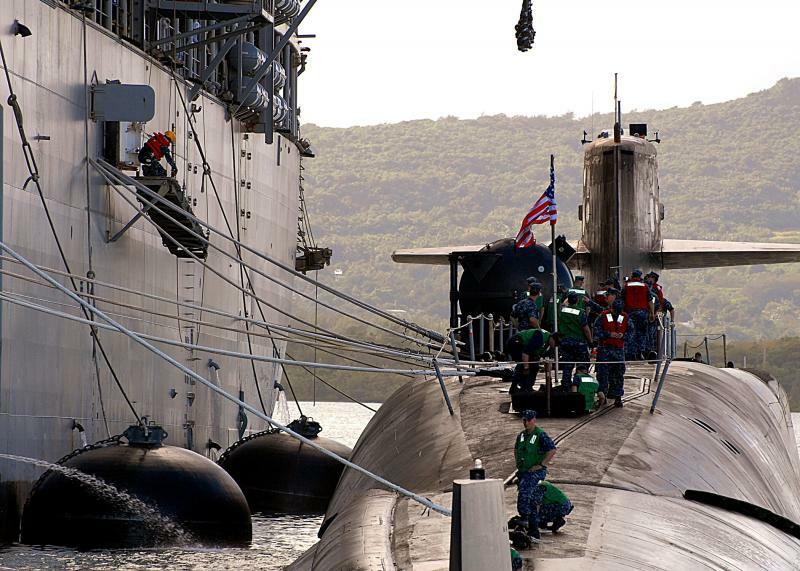 There is widespread agreement, however, that nuclear deterrence can also be extended to non-nuclear allies. 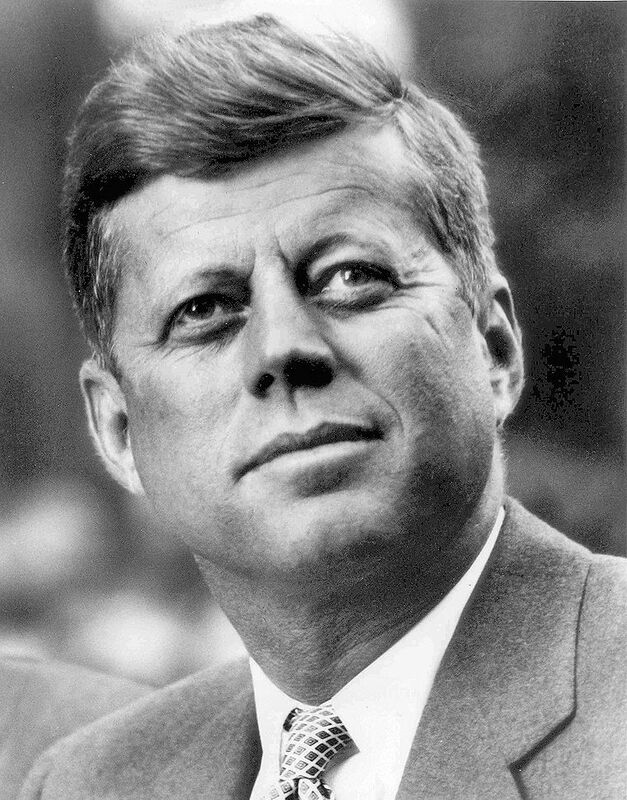 In principle, all that is required is a declaration by the nuclear weapons state that it will retaliate on an attack on its ally with nuclear means. Whether such a promise will be perceived as credible, however, is quite another matter. 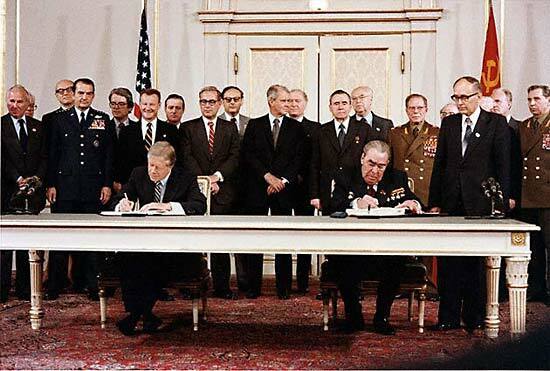 in the planning for the use of nuclear weapons by NATO, and in particular provides for the armed forces of these countries to be involved in delivering these weapons in the event of their use. The main objective of the Norwegian F-35 planes are to be used as low flying bombers each delivering one B61-12 thermonuclear gravity bomb over Russia, plain and simple! 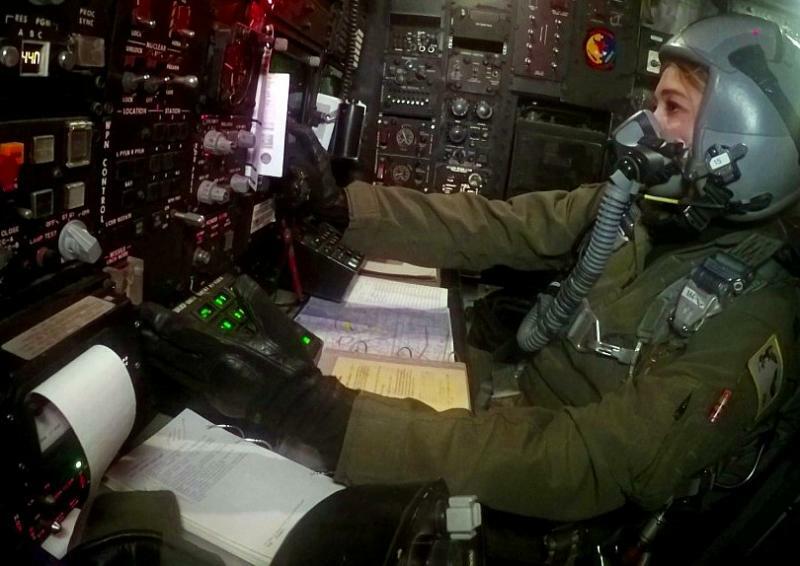 Norway will have forty F-35's available in NATO's Nuclear Sharing program and will deliver a total of forty B61-12 thermonuclear gravity bombs. At least that is the NATO plan, in theory. 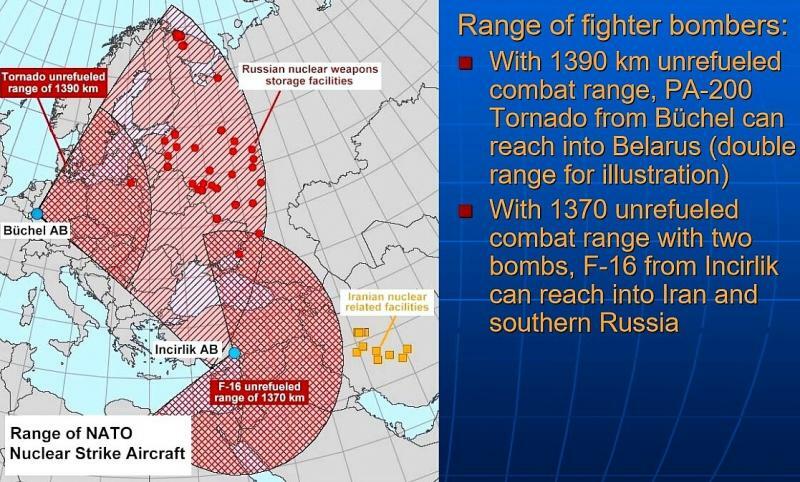 Why would Russia use its fighter planes over Norway when it can use much more advanced, precison-guided missiles that can reach any part of Norway within minutes? 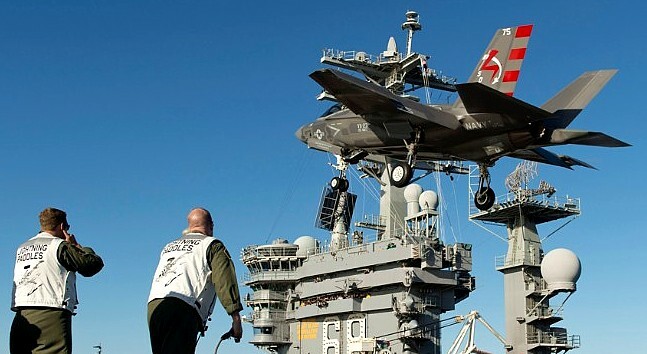 Even the F-35's themselves! There's no business like (the) show business! 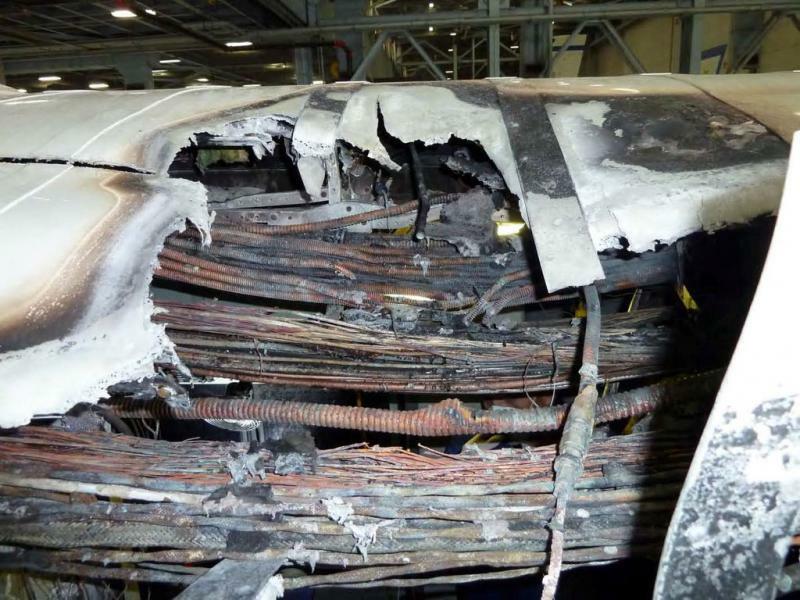 Norwegian F-35's attacking targets inside Russia? Yes, they will come to the border of Russia, up north, and that's it. They will be shot down, one by one. Or they will be targeted at the tarmac before they have a chance to take off! 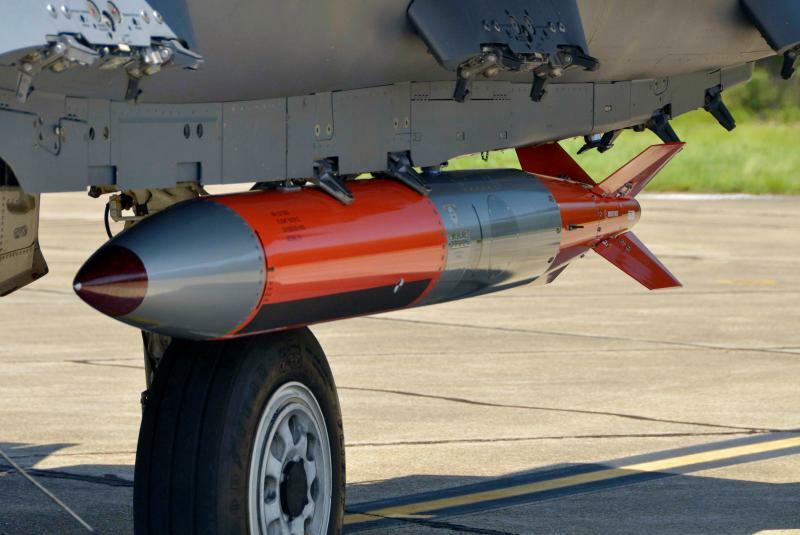 Some of the F-35's delivered to Norway can be equipped to carry B61-12 thermonuclear smart, gravity bombs, which Norway is obliged to do through NATO's "Nuclear Sharing Program". 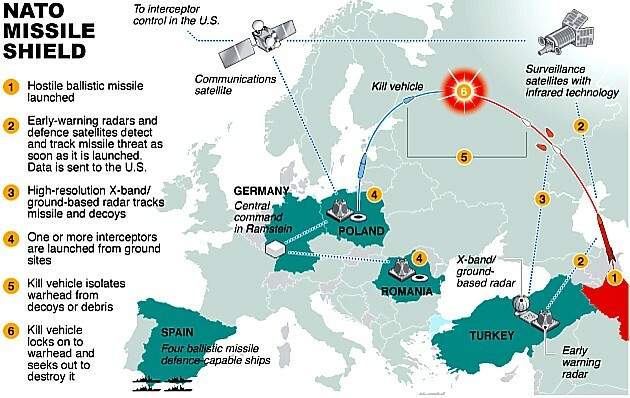 Then Norway will be targeted at once with Iskandder-K GCLM fitted with Kalibr-NK nuclear-tippet, winged, cruice missiles, and my be also targeted with Iskander-M conventional or nuclear missiles. 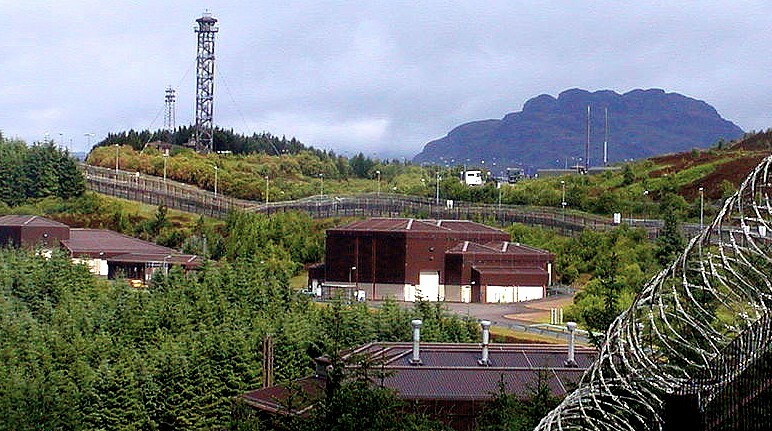 The County of Trondelag, in Mid-Norway, where the US Marine Prepositioning material is stored in eight mountain caves, might be attacket with Russian hypersonic, precition guided nuclear missiles. I really can't see what the F-35's can contribute with, except creating an even more dire situation for Norway﻿ and it's population! This is the missile war! What took weaks to accomplish in WW2, will only take minutes now! For Norway's part, the war will be over before it has really started. 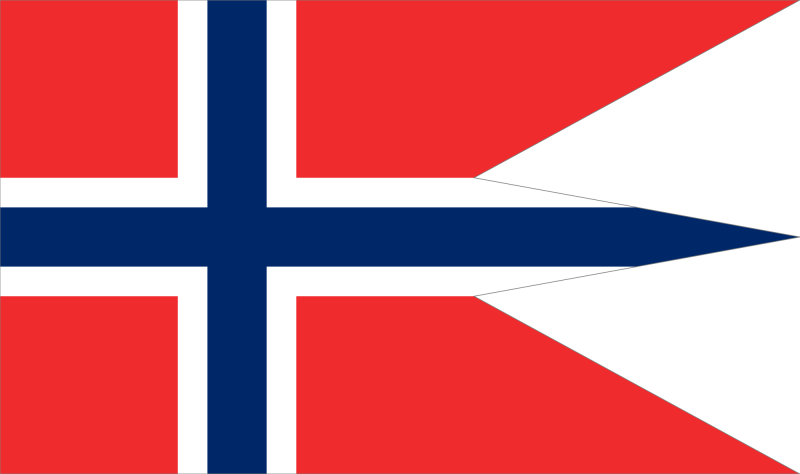 There is zero protection for the population of Norway against a nuclear attack! Zero! Nothing! And this is very serious, off course. The well paid politicians sitting in the Parliament in Oslo does not seem to fathom this! 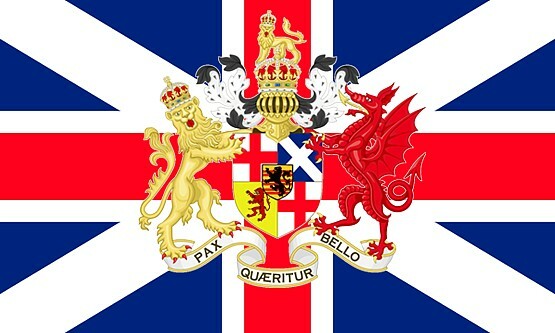 Which in itself amounts to high treason! 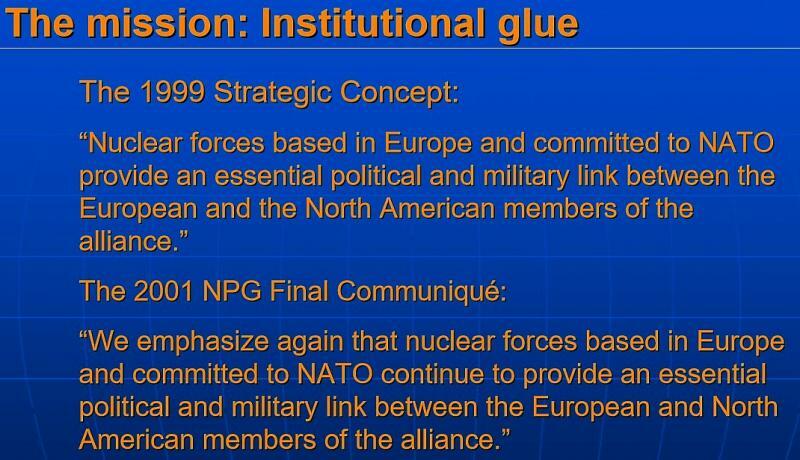 The Strategic Consept of the NATO states is as follows: A credible Alliance Nuclear posture and the demonstration of Alliance solidarity and common comitment to prevention of war and to continue to require widespread participation by the European Allies involved in col- lective defence planning in nuclear roles. 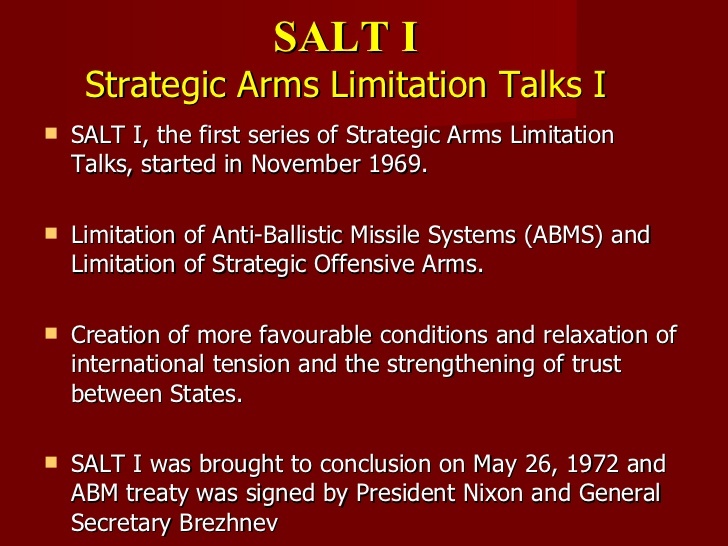 In peacetime basing of nuclear forces on their ter- ritory and in command and consultation arrangements. 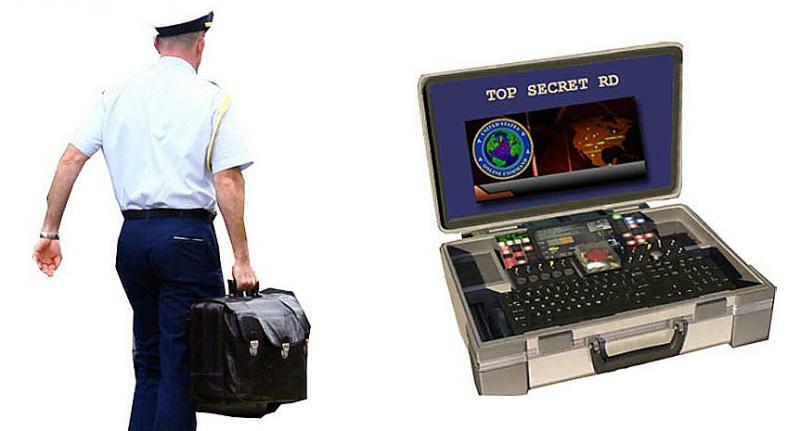 "A device included in or attached to a nuclear weapon system to preclude arming and/or launching until the insertion of a prescribed discrete code or combination. 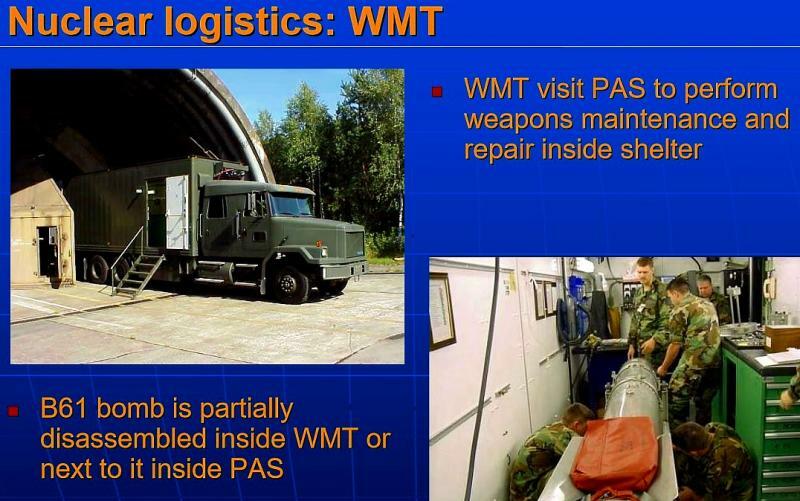 It may include equipment and cabling external to the weapon or weapon system to activate components within the weapon or weapon system.﻿"
"I have decided we should now make the commitment to procure appropriate (PAL) devices for all nuclear weapons, now dispersed and to be dispersed to NATO commands, for both non-U.S. and U.S. forces." "At the earliest feaseble time, the Secretary of Defence will submit for my approval a schedule for installation of these devices in NATO weapons. In making this schedule, the Secretary should consult with the Secretary of State on the political problems arising from the excistenc of weapons assigned to U.S. forces and weapons assigned to our Allies. " "...carry out a reserach program on an urgent basis directed toward an examination of the feasibility and desirability of more advanced permissive link devices with a wider range of capabilities." All of the new F-35 Lightning II will be modified to carry 2 B61-12 thermonuclear bombs, and the F-16 above, will eventually be laid off. 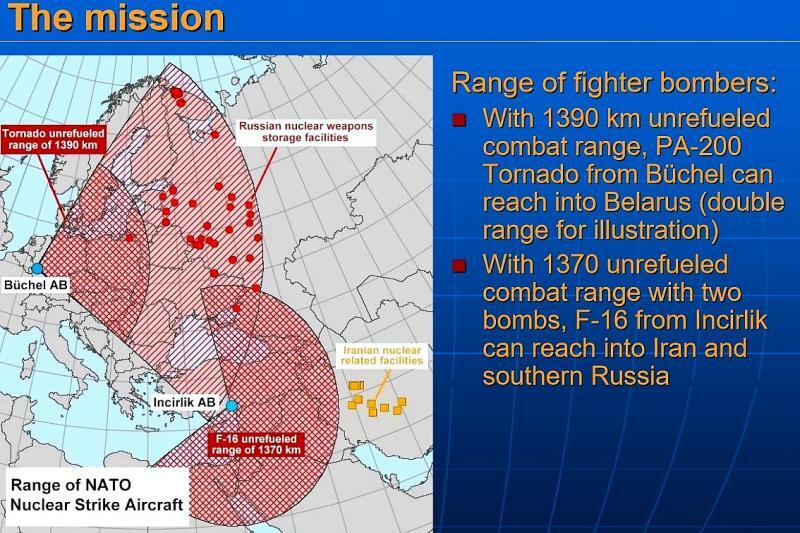 US tactical B61 plane bombs, 480 bombs in the Netherlands Belgium, Germany, Italy, and Turkey. 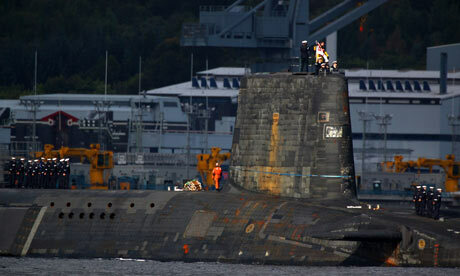 Nuclear missiles on the 4 UK Trident submarines, each with a maximum of 48 nuclear warheads on board. 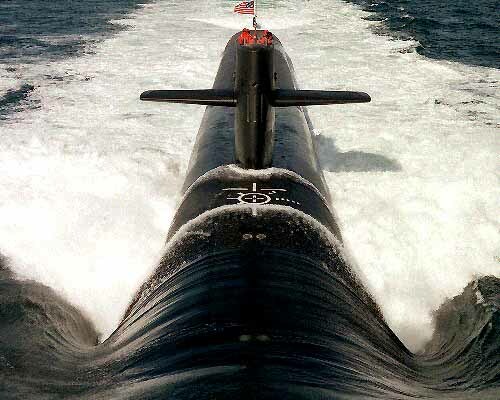 Nuclear missiles on US Trident submarines: 4 of 15 are assigned to NATO with 24 missiles on each submarine. 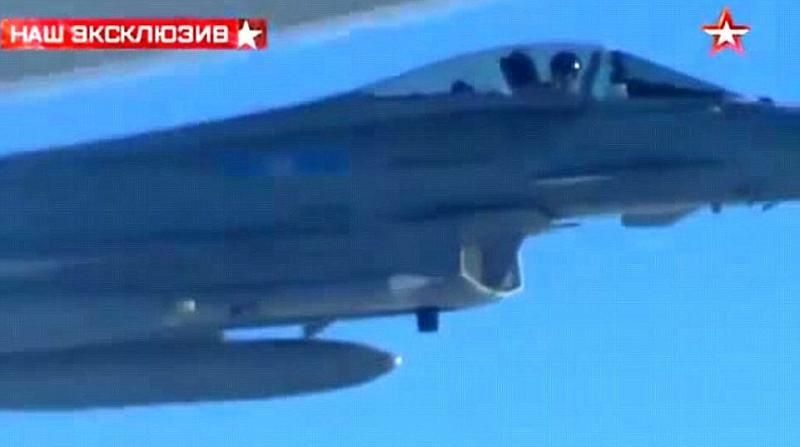 Close call 1: An "Eurofighter Typhoon" interceptor photographed from a Russian "Bear"
Under US pressure, NATO has since 2000 allowed a new strategy which permits the use of nuclear wapons against states who do not posess nuclear veapons them selves. 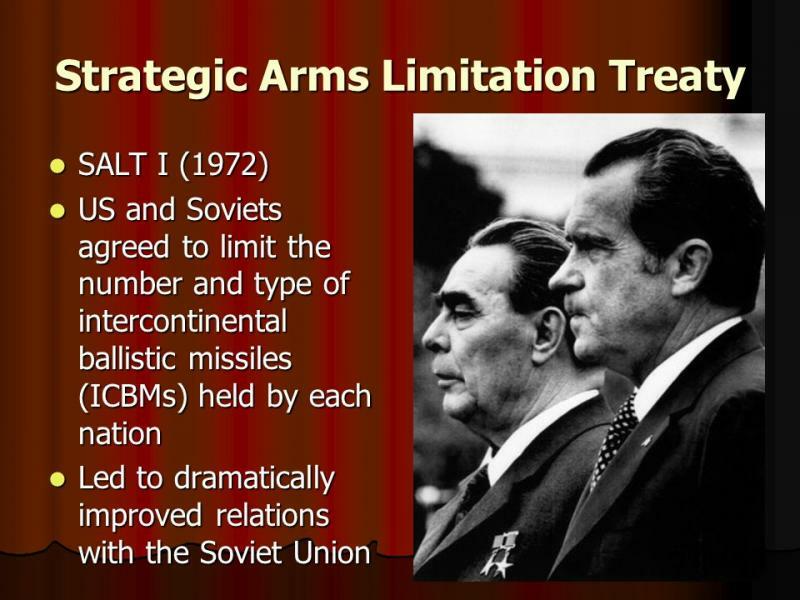 After the Cold War the US changed it's nuclear stategy. 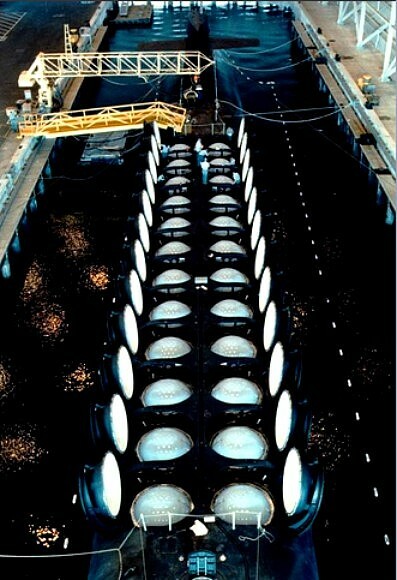 Originally nuclear veapons were used to deter other nuclear weapon states. 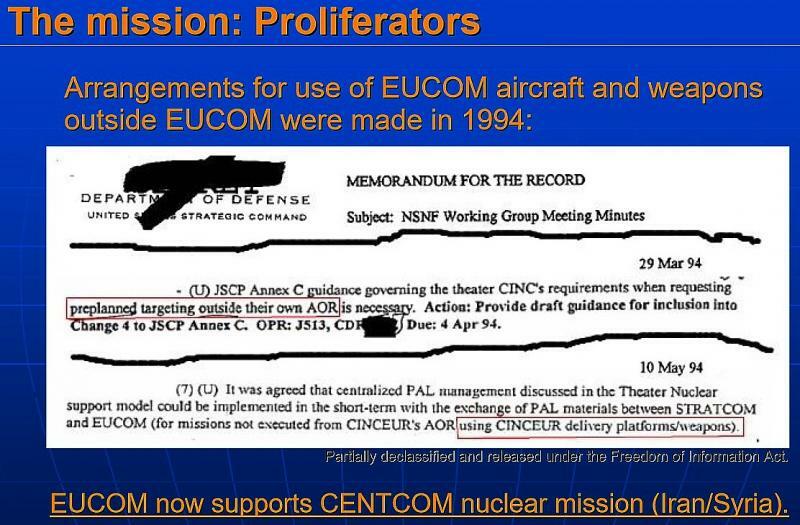 Countries that did not posses nuclear veapons were not threatened by them. 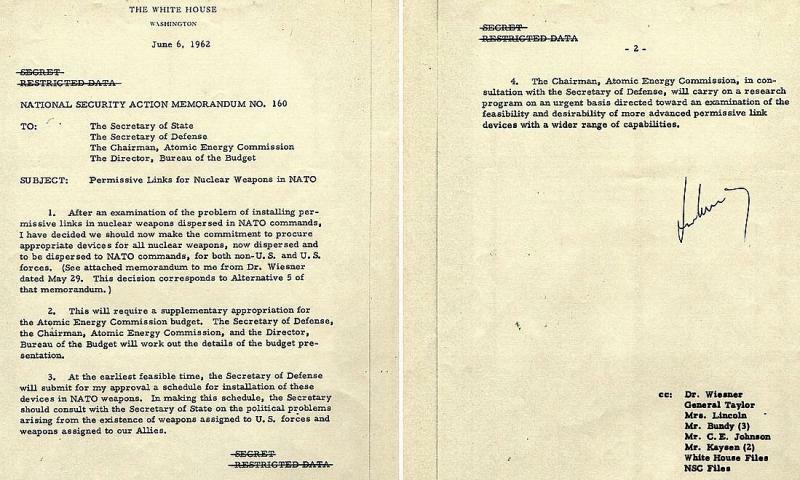 Since the 90'ies the US broadened the role of nuclear weapons. Also countries which the US suppos- ed to posess weapons of mass destruction, like chemical or biological weapons, are now threatened with nuclear weapons. Because many more countries have the potential today to posses chemical or biological we- apons than nuclear weapons, many more countries are now the target of US nuclear weap- ons. 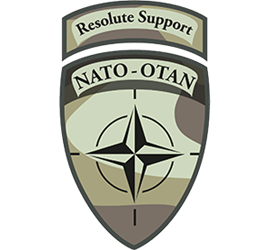 NATO accepted a similar doctrine in June 2000 by adopting a revision of her military strategy in the secret document MC 400/2. 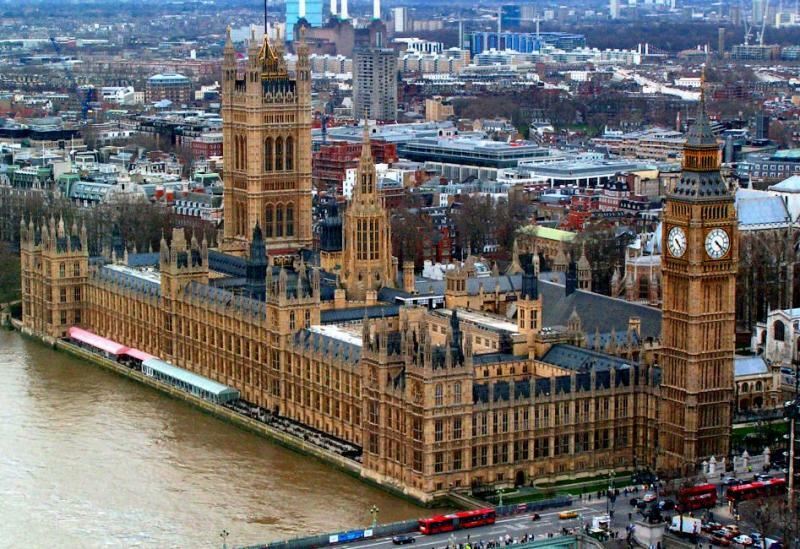 NUCLEAR WEAPONS NOW TO BE USED AS "PREVENTIVE DEFENCE"
The first use of nuclear weapons are now possible against an enemy that is supposed to posses any sort of weapon of mass destruction. This new, nuclear stategy, combined with an active policy of military intervention and concepts like "preventive defence" make nuclear weapons much more threatening to a whole new range of countries and pulls them in a new arms race. 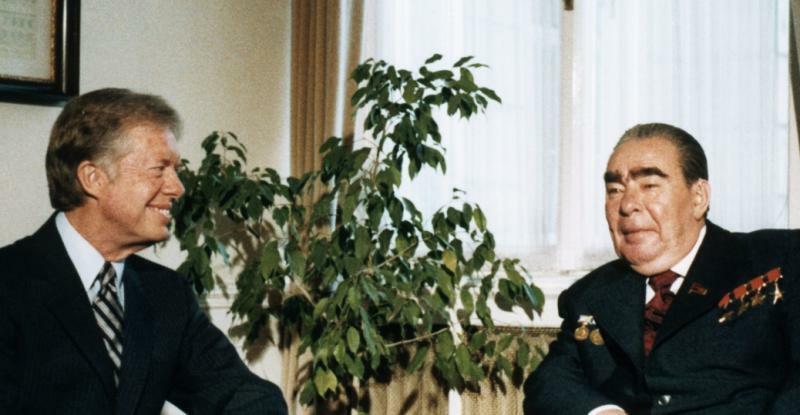 ﻿During negotiations over German reunification in 1990, did the United States promise the Soviet Union that NATO would not expand into eastern Europe? The answer remains subject to heated debate. Today, Moscow defends its invasion of Ukraine by claiming that NATO regened on a promise to stay out of Russia's backyard. 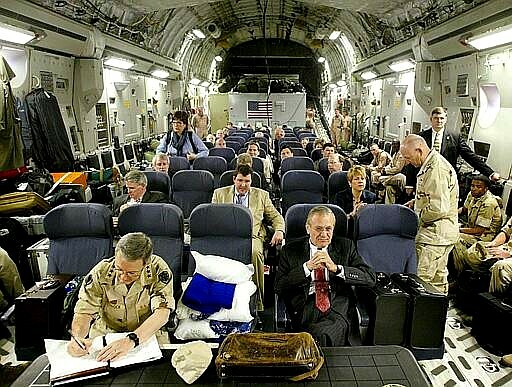 Sceptics, meanwhile, counter that Russian claims are a pretexts for aggression; in their view, Washington and its allies never formally committed to forego NATO expansion. 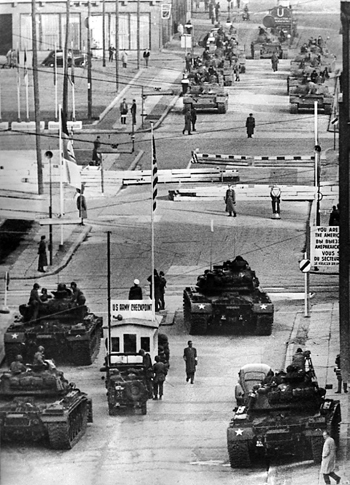 Dramatic footage from hight of the October 1961 US-Soviet Berlin standoff, Friedrichstrasse. 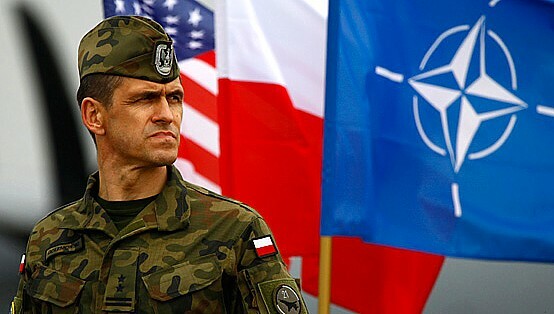 The skeptics are correct that the two sides never codified a deal on NATO’s future presence in the east. 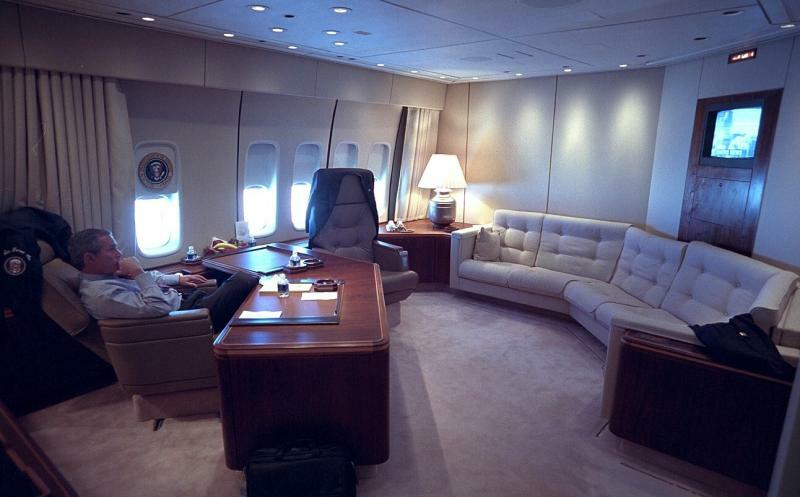 But they misinterpret the precise implications of negotiations that took place throughout 1990. After all, scholars and practitioners have long recognized that informal commitments count in world politics. 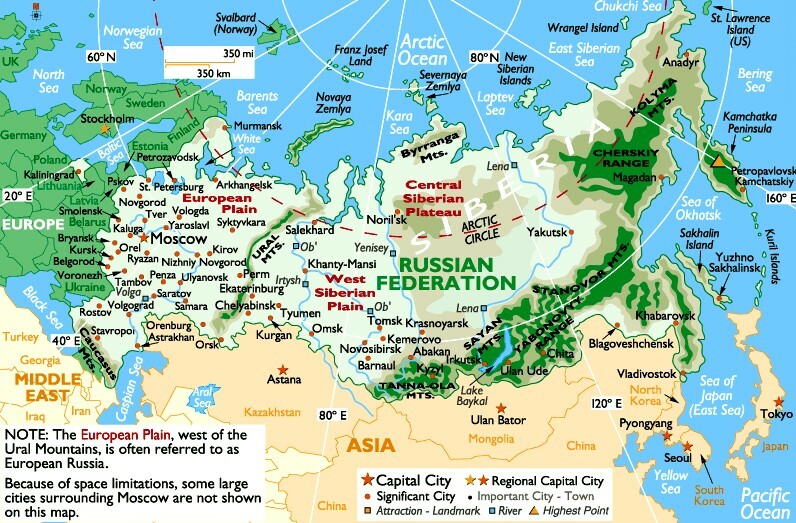 This was particularly true during the Cold War: as the historian Marc Trachtenberg has shown, the Cold War settlement itself emerged from European, Soviet, and U.S. diplomatic initiatives in the late 1950s and 1960s that were not formalized until nearly a decade later. 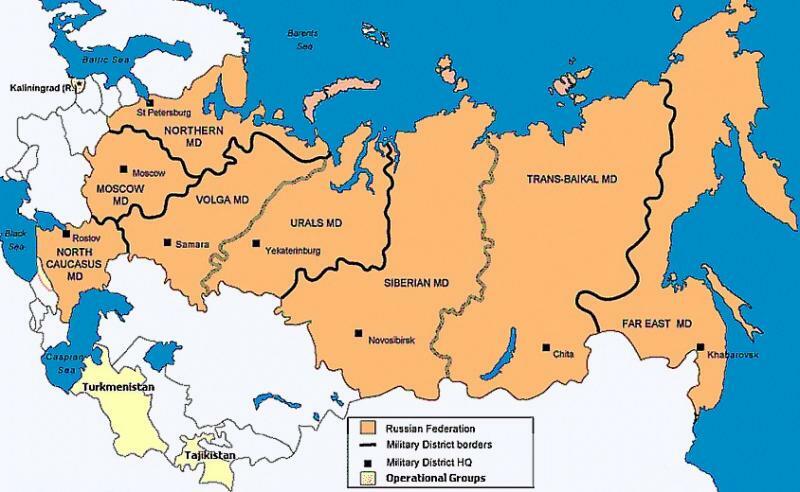 ﻿ The Russian Federation the largest landmassed country, here with it's military districts. 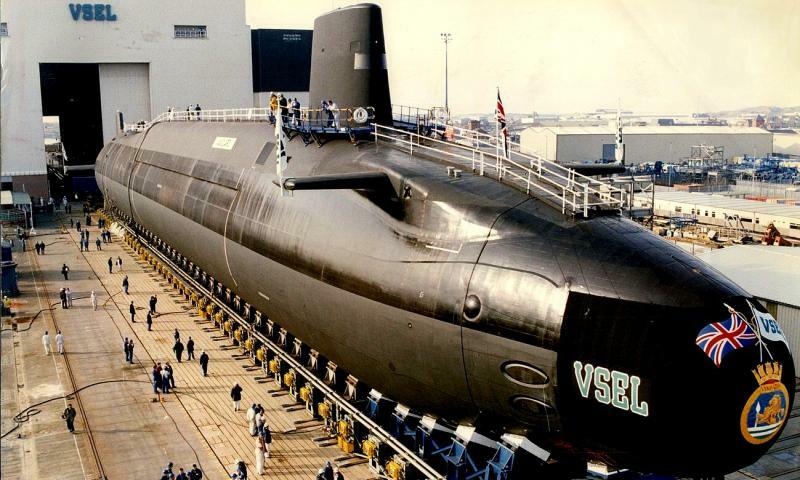 The Vanguard-class is a British class of nuclear powered ballistic submarines in service of the Royal Navy. 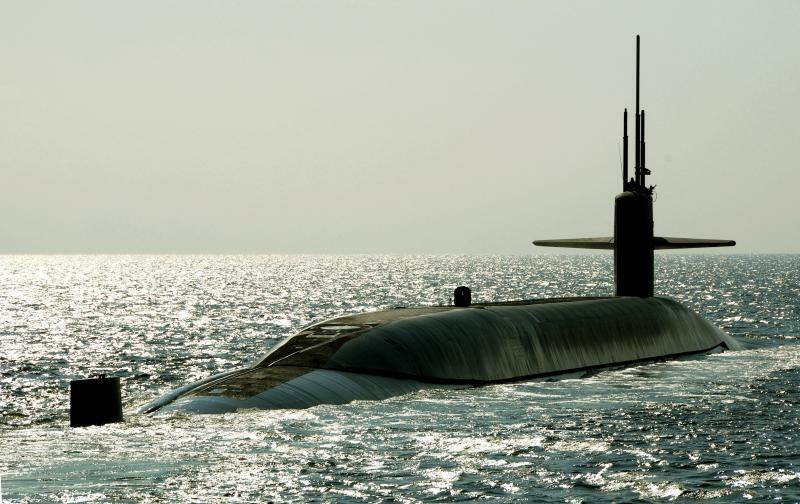 Each submarine is armed with up to 16 UGM-133 Trident II missiles. 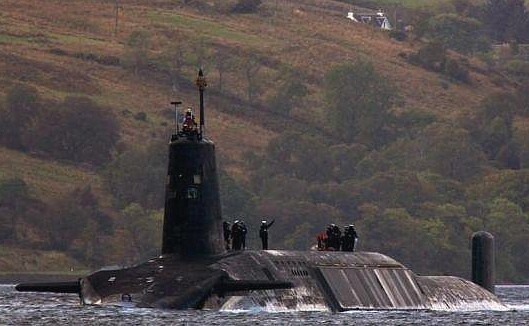 The class was introduced in 1994 as part of the Trident nuclear programme. 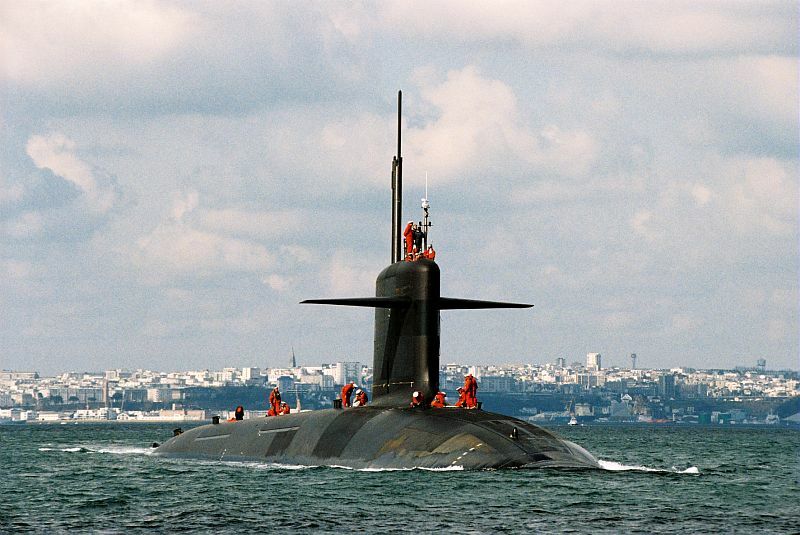 The class includes four submarines: Vanguard, Victorius, Vigilant and Vengeance. They were built at Barrow-Fur- ness by Vickers Shipbuilding and Engineering between 1986 and 1999, which is now owned by BAE Systems. 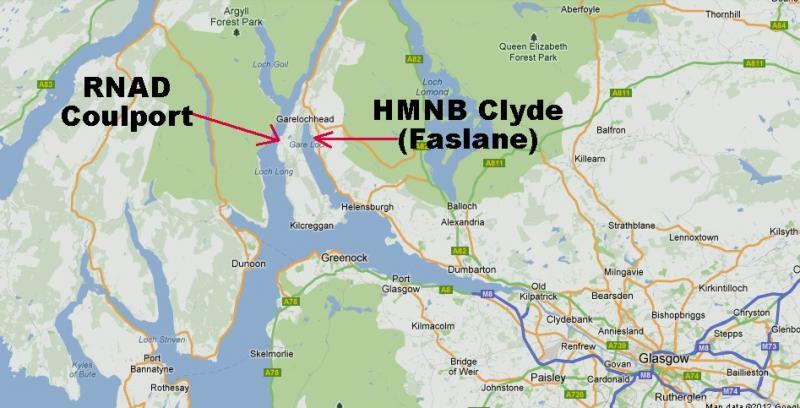 The subs are based at HM Naval Base Clyde, west of Glasgow, Scotland. 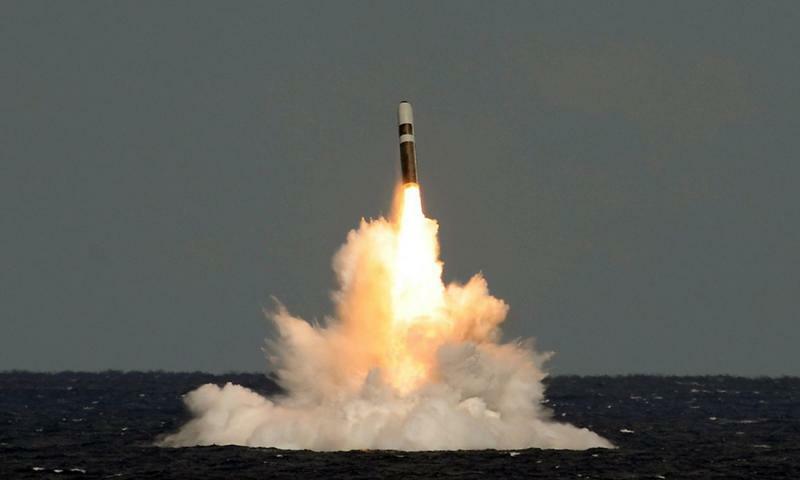 Although it has reduced its nuclear stockpile since the end of the Cold War, the UK main- tains a continuous at-sea nuclear deterrent, now based solely on the submarine-launched Trident system, which consists of four Vanguard-class submarines, Trident II D5 missiles and associated warhead. 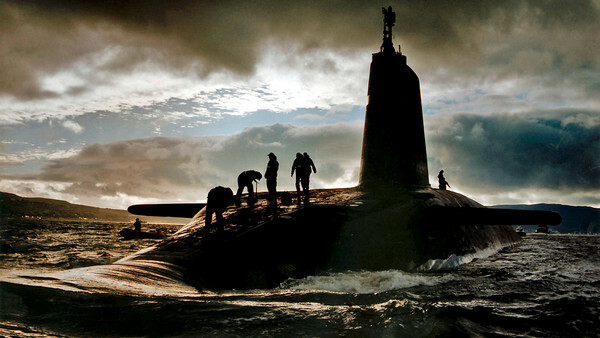 The Labour Government committed in 2006 to renewing the UK’s nu- clear deterrent, and this position was endorsed by the next Government’s Strategic Defense and Security Review in 2010. 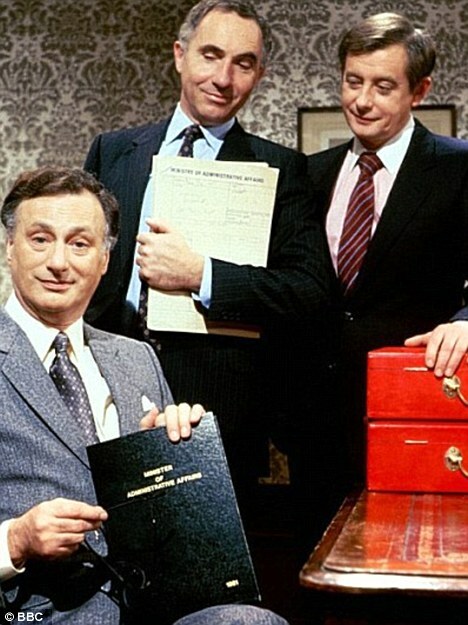 “I’ve decided to cancel Trident,” Hacker tells an astonished Sir Humphrey. He intends to divert some of the savings into conventional forces and reintroduce conscription, and “at one stroke” solve Britain’s balance of payments, educational and unemployment problems. 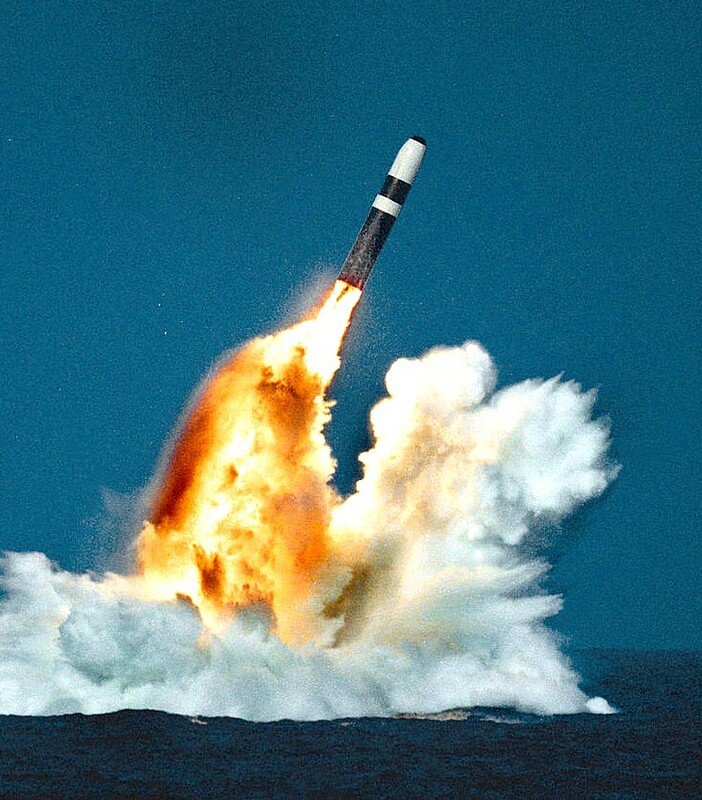 Sir Humphrey [scandalised] : With Trident we could obliterate the whole of eastern Europe. Hacker: I don’t want to obliterate the whole of eastern Europe. Sir Humphrey: But it’s a deterrent. Hacker: It’s a bluff. I probably wouldn’t use it. Sir Humphrey: Yes, but they don’t know that you probably wouldn’t. Sir Humphrey: Yes, they probably know that you probably wouldn’t. But they can’t certainly know. Hacker: They probably certainly know that I probably wouldn’t. Sir Humphrey: Yes, but even though they probably certainly know that you probably wouldn’t, they don’t certainly know that, although you probably wouldn’t, there is no probability that you certainly would. 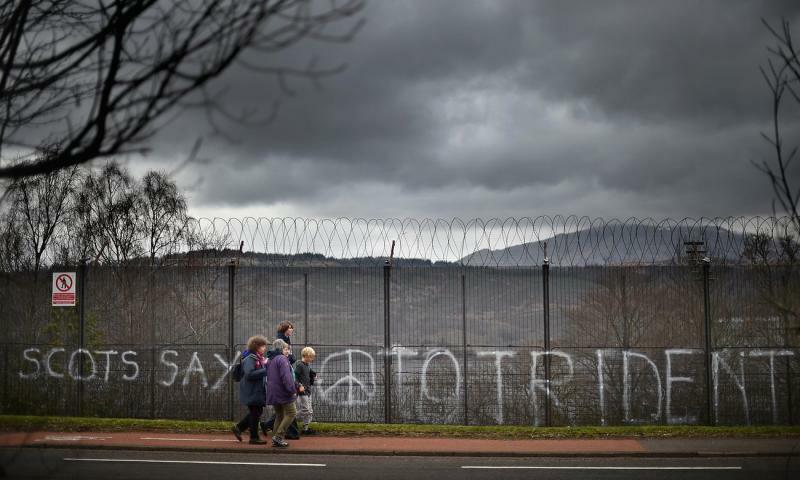 ﻿It is the storage and loading facility for the nuclear warheads of the United Kingdom's Trid- ent Programme. The base, near the village of Coulport, has up to 16 reinforced concrete bunkers built into the hillside on the eastern shore of Loch Long. 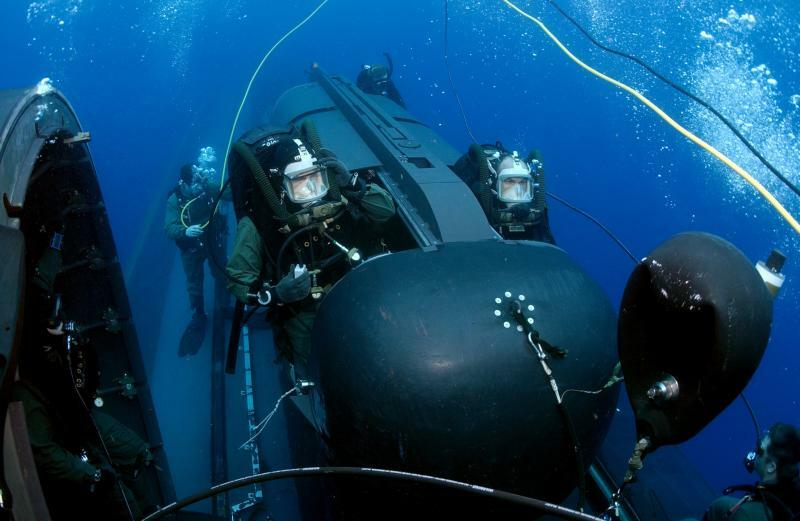 It is the last depot in the UK to retain the "RNAD" designation, indicating a Royal Navy Armament Depot. 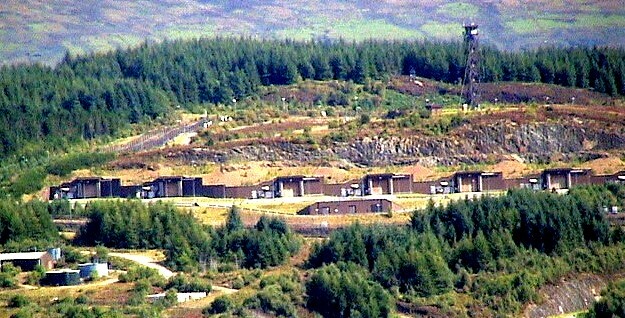 The Royal Naval Armaments Depot (RNAD) at Coulport, Loch Long is the other major part of HMNB Clyde. RNAD Coulport stores conventional armaments for Royal Navy vessels but is best known for its role in the Trident missile system. 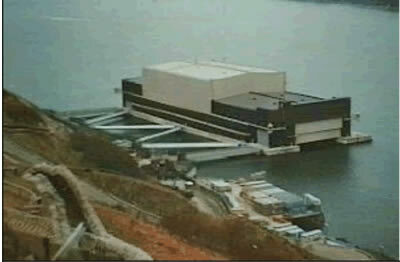 Two docks are located on the shoreline at the foot of the hill. 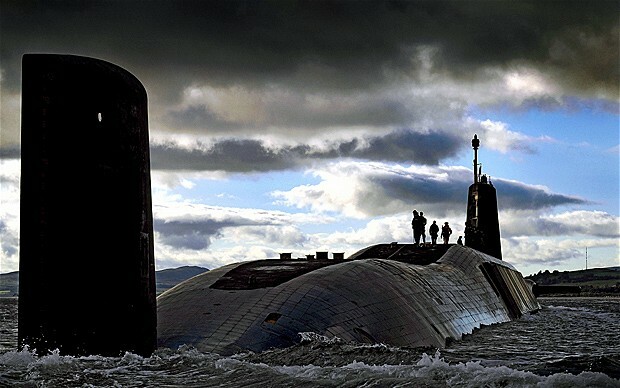 There, weapons are loaded onto Vanguard nuclear submarines before they go on patrol and unloaded before they return to base at nearby Faslane. 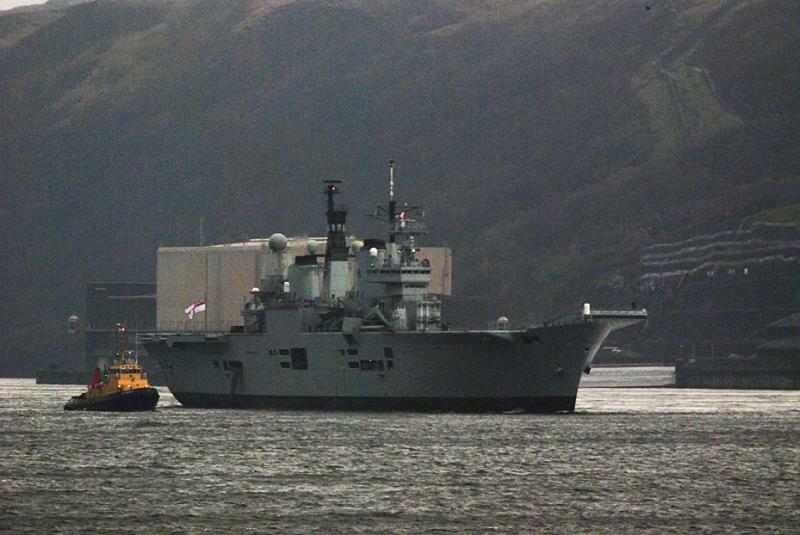 Below, the Faslane Marine and Submarine Doc. 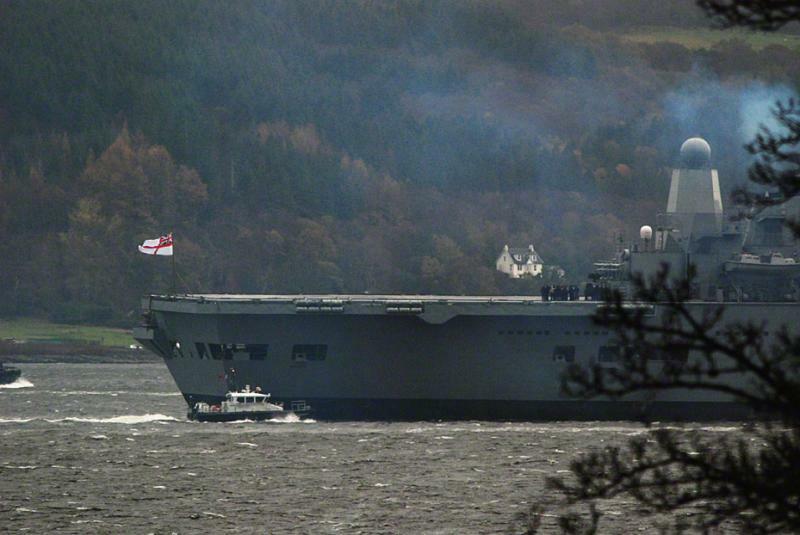 Faslane, officialle called "Her Majesty's Naval Base (HMNB) Clyde (HMS Neptune)" is one of three operating bases in the United Kingdom for the Royal Navy the others being HMNB De- venport and HMNB Portsmouth. 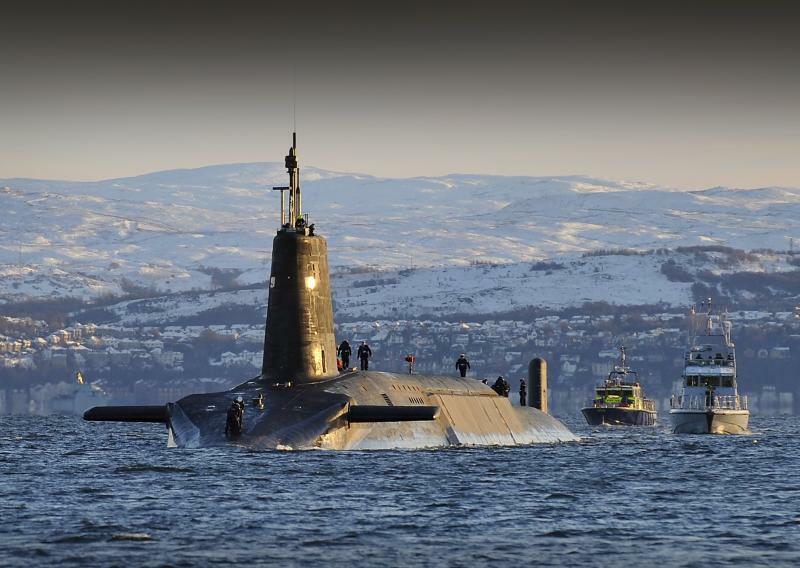 It is the service's headquarters in Scotland and is best known as the home of the United Kingdom's strategic nuclear deterrent, in the form of nuc- lear submarines armed with Trident missiles. 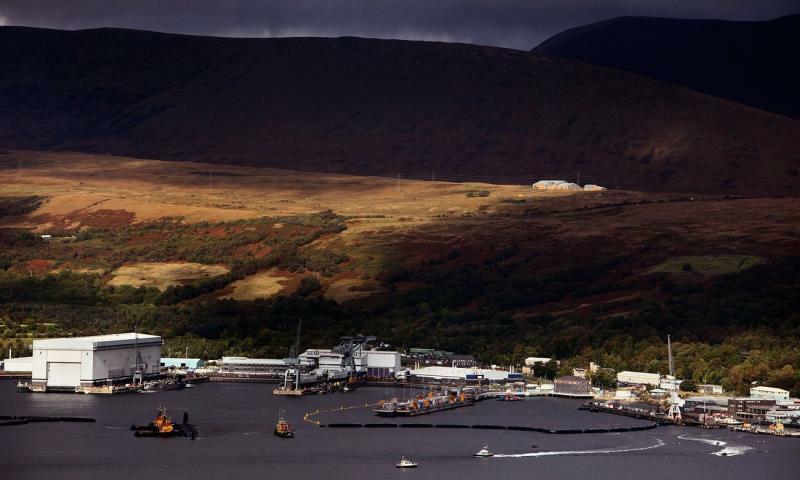 The Trident Works Programme at Coulport and Faslane co-ordinated by the Property Service Agency, took 13 years to complete. 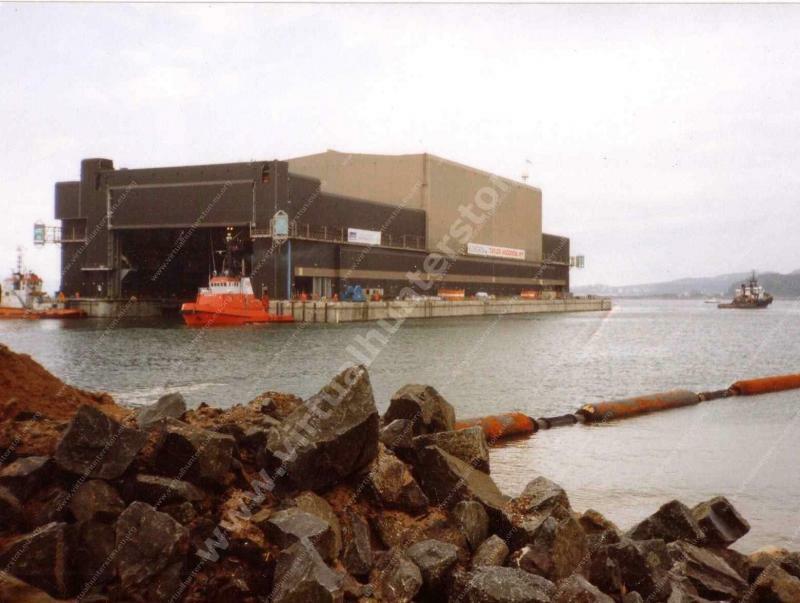 Planning work at Coulport began in 1982 and the esti- mated final cost for the entire programme, at 1994 prices, was approximately £1.9 billion. This made it the second most expensive procurement project in the UK after the Channel Tunnel project﻿. 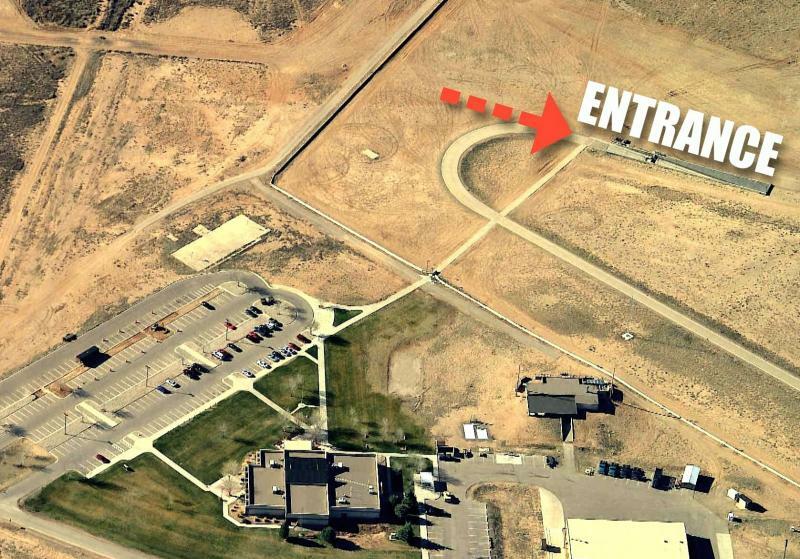 Below, Naval Armaments Depot entrances to deep, reinforced concret stor- age vaults. Bases are close to Scotlands most populated city, Glasgow with 596.000 inhabitants. 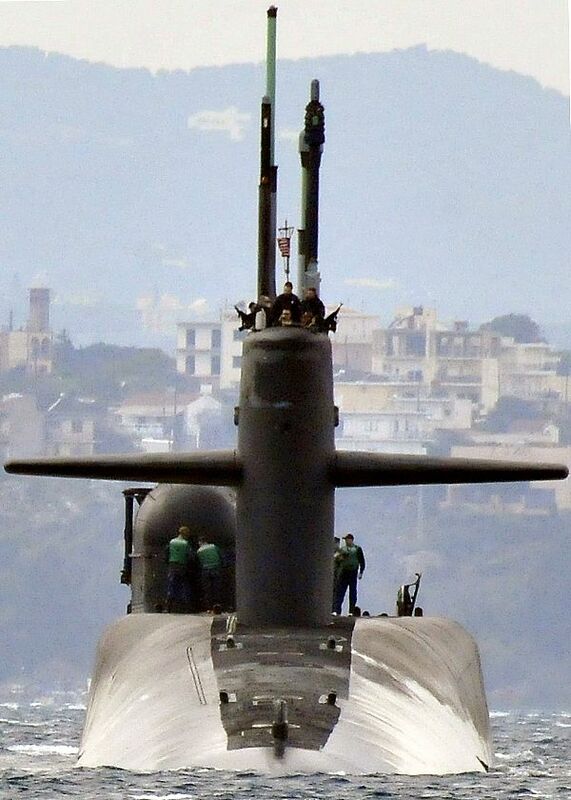 'Trident' is an operational system of four Vanguard Class submarines armed with Trident II D-5 Ballistic missiles, able to deliver thermonuclear warheads from multiple independently targetable re-entry vehicles (MIRV). 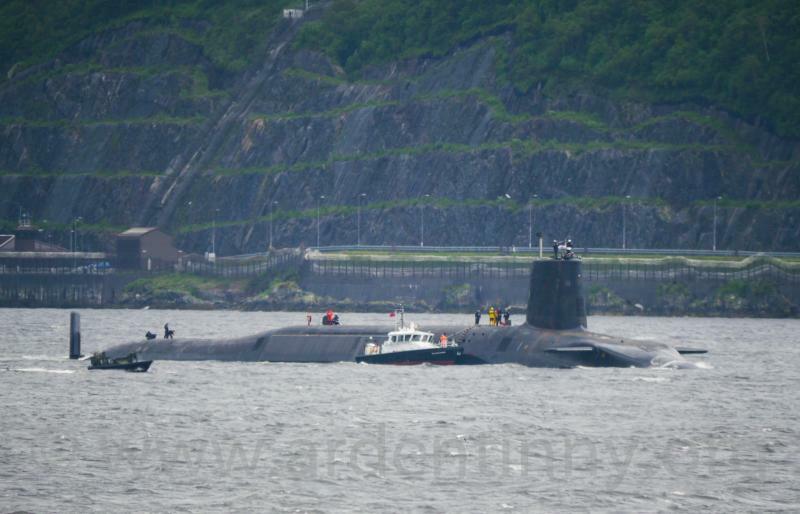 Below, a Vanguard sub has returned to Coulport base. 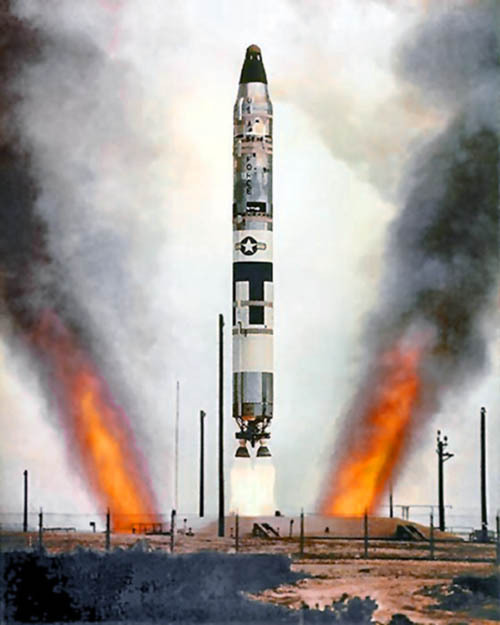 The UGM-27 Polaris missile was a two-stage solid-fueled nuclear-armed submarine-launch- ed ballistic missile (SLBM) built during the Cold War by Locheed Corporation for the United States Navy. It was designed to be used for second strike countervalue, not good enough for first strike counterforce. 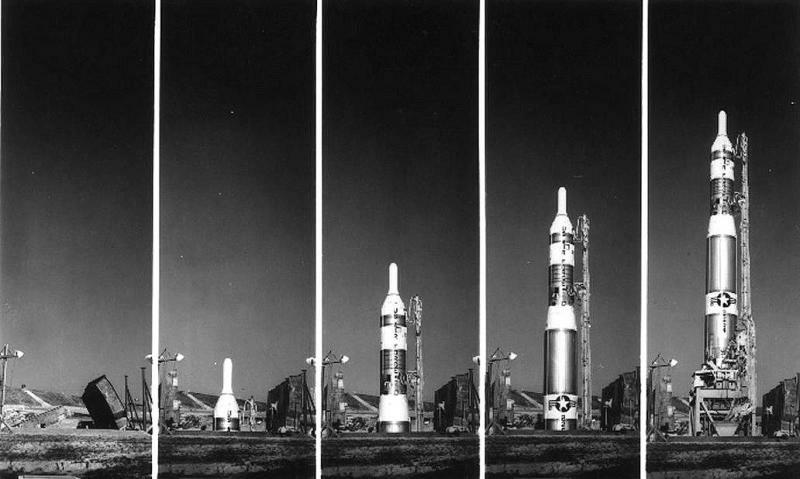 The Polaris was first launched from the Cape Canaveral Florida mis- sile test bas on January 7, 1960. 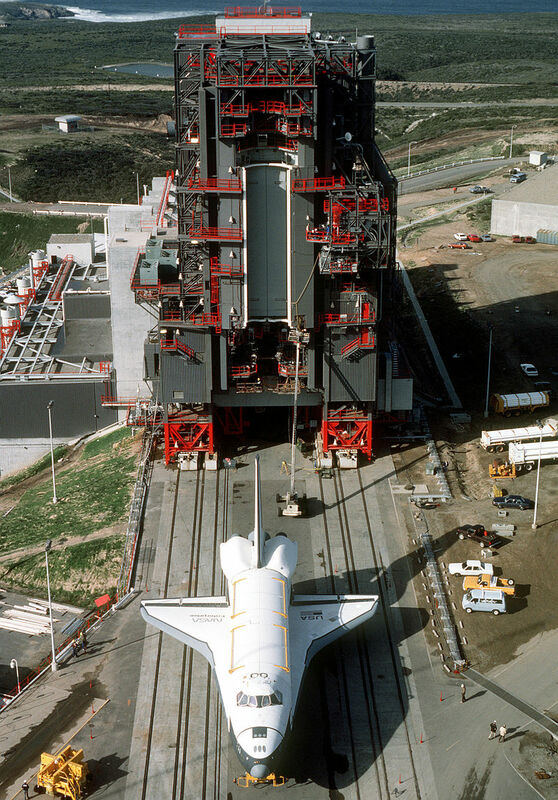 The D5 missile has three rocket motor stages powered by solid-fuel propellant and weighs more than 130,000 pounds. 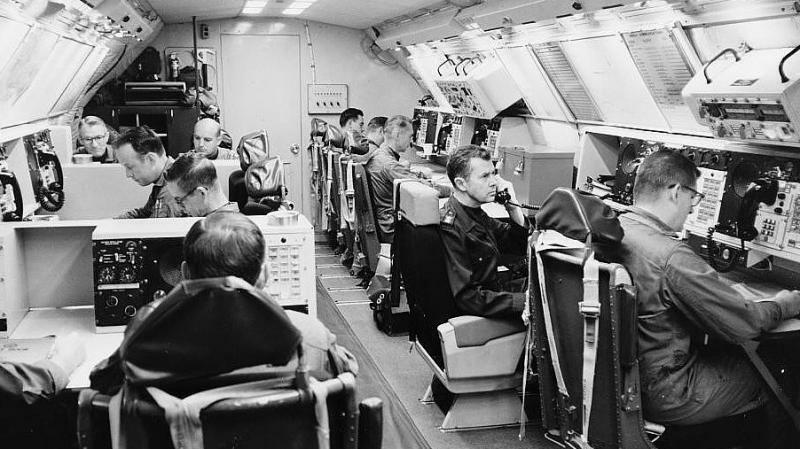 The D5 is the latest in a line of fleet ballistic missiles, which began with the Polaris A-1 in 1960. 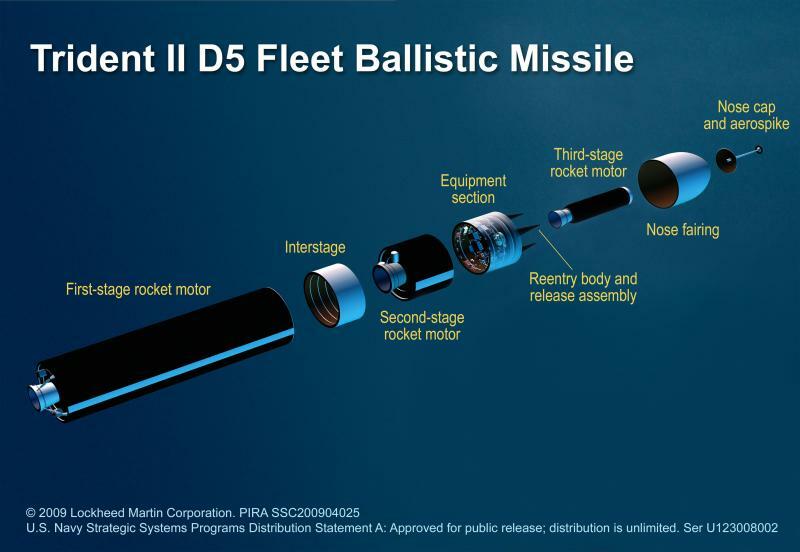 The D5 has a greater range, payload, and accuracy than its predecessors, since it incorporates many state-of-the-art technological advances in elec- tronics and rocketry. 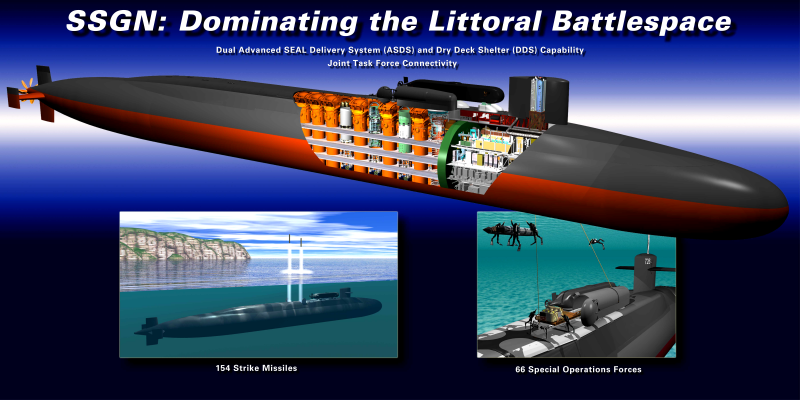 The D5 is the heart of the Trident weapons system, which also includes the submarine, sup- port equipment, and shore facilities. 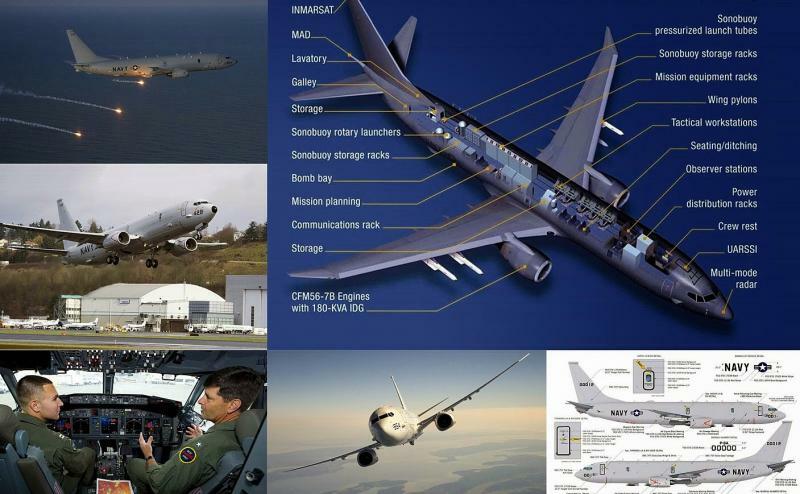 The system is designed to be America's sea borne det- errent to strategic war. 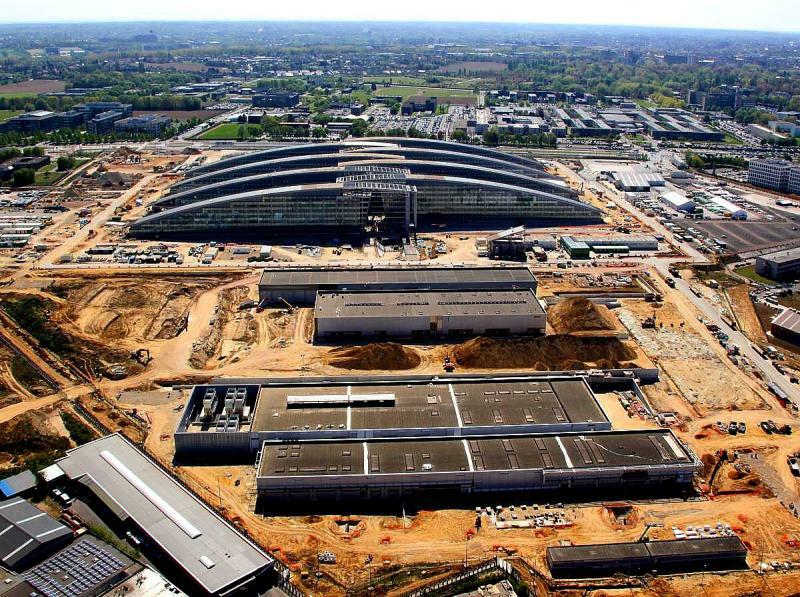 The Pentagon announced its plans to consolidate its bases in Europe, including restructuring that would replace F-15 fighter jets with the F-35 Lightning II aircraft. 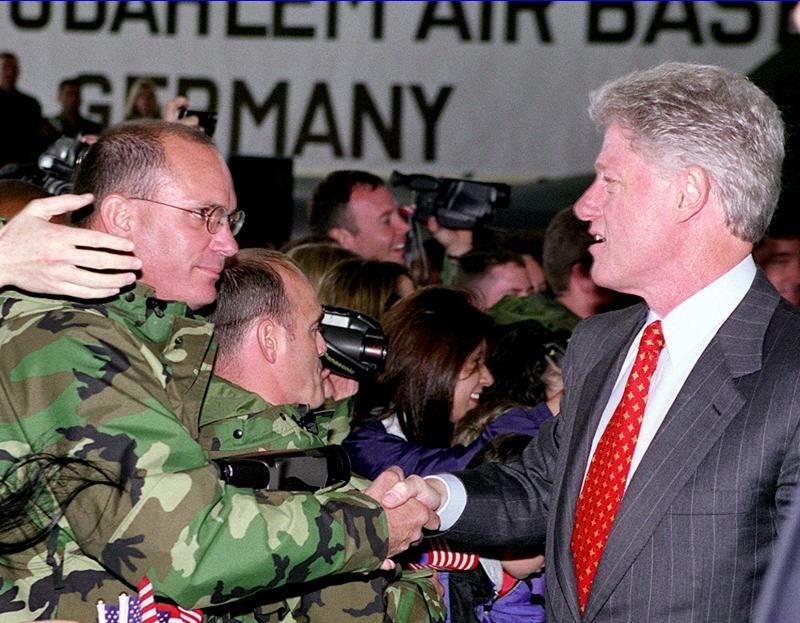 ﻿The withdrawal, which has not been officially announced but confirmed by several sources, follows the withdrawal of nuclear weapons from Ramstein Air Base in Germany in 2005 and Greece in 2001. 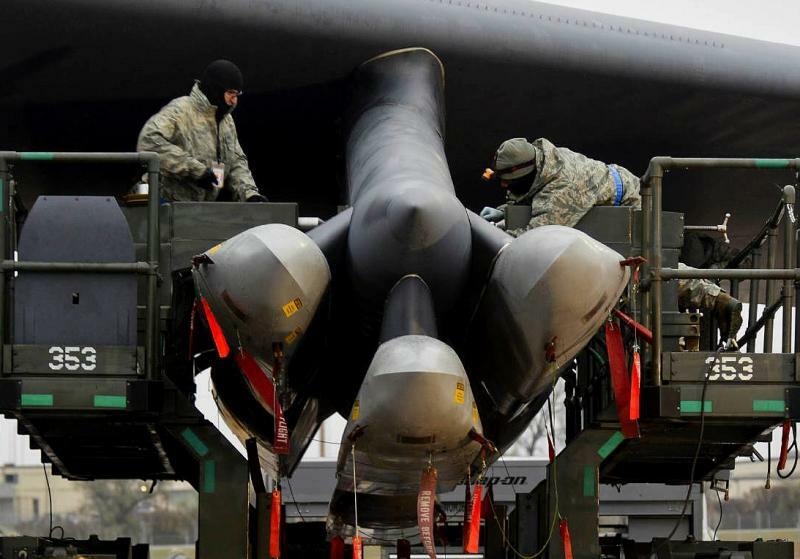 The removal of nuclear weapons from three bases in two NATO countries in less than a decade undercuts the argument for continuing deployment in other European countries. 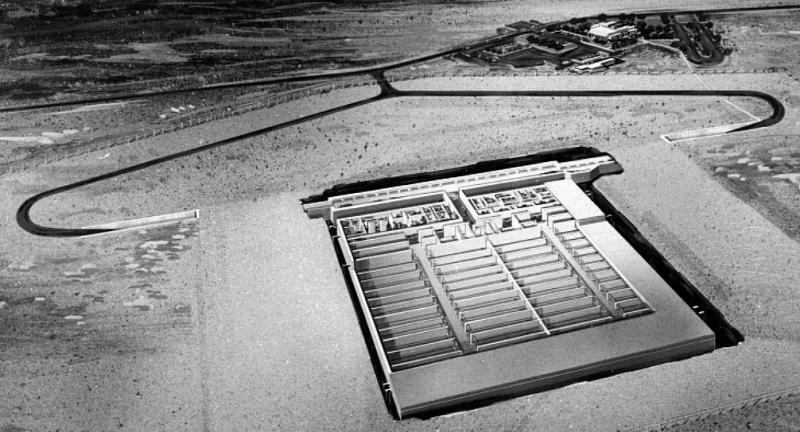 Ready made bases: Bases that have all the necessary installation and preparedness to handle nuclear bombs in case of a deep crisis. 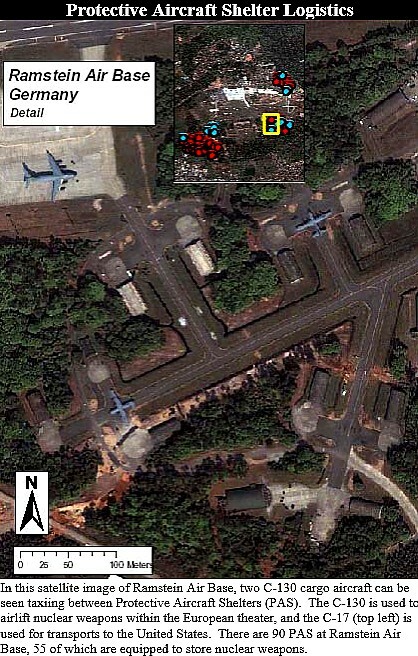 RAF Lakenheath, is a Royal Air Force military airbase near Lakenheath in Suffolk, England. 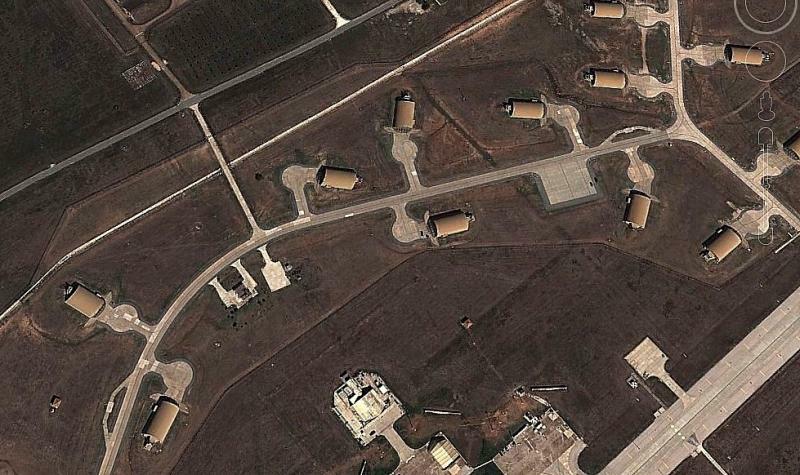 Although an RAF station, it hosts United States Air Force units and personnel. The host wing is the 48th Fighter Wing, also known as the Liberty Wing, assigned to United States Air For- ces in Europe (USAFE). 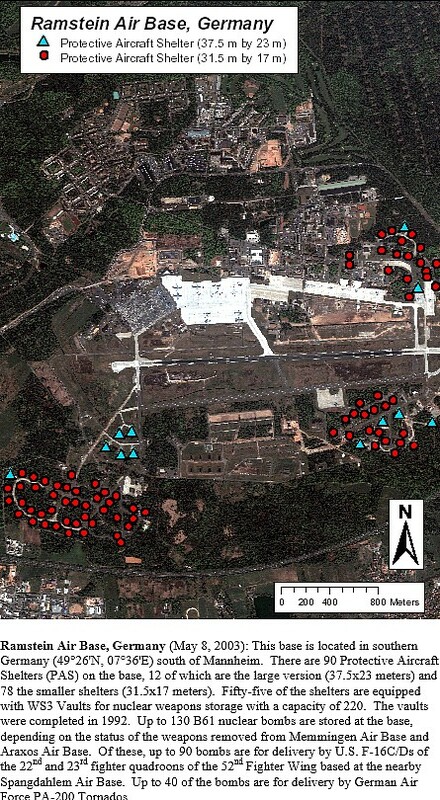 The U.S. Air Force maintains five PAVE Phased Array Warning System (PAWS) Early Warning Radars (EWR). These radars are capable of detecting ballistic missile attacks and conducting general space surveillance and satellite tracking. 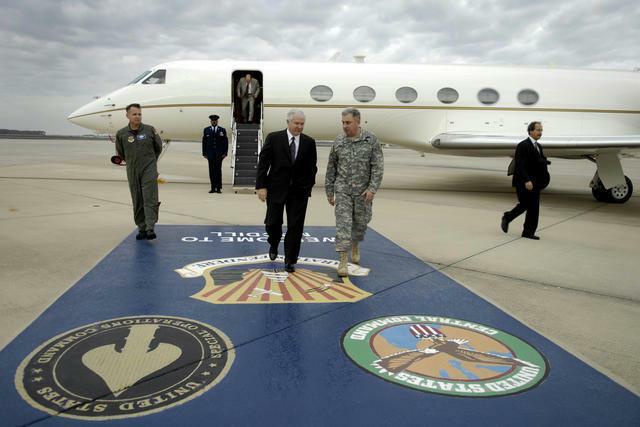 The acronym PAVE is a military program id- entification code. 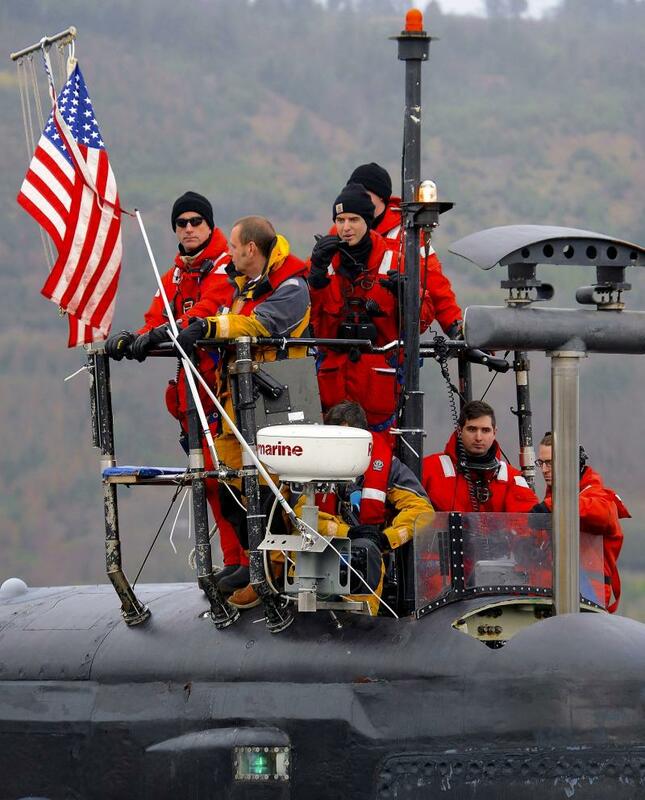 They are able to detect and track both intercontinental and sea-launched missile threats. 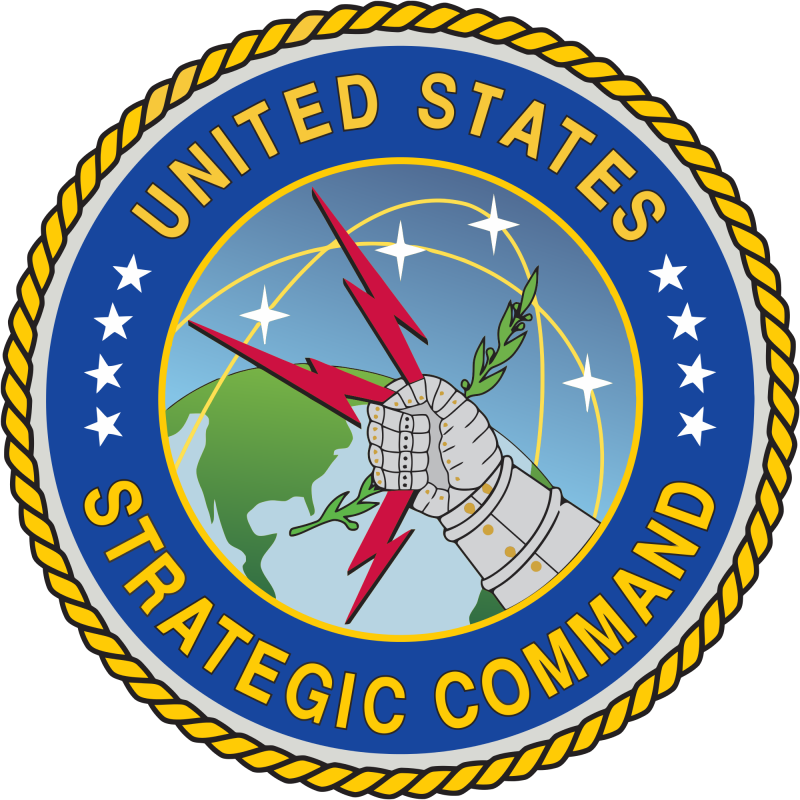 Early warning and attack characterization data is sent to the United States' Missile Warning and Space Control Centers, the U.S. National Military Command Center and U.S. Strategic Command. Satellite tracking data is sent to the Joint Space Operations Center (JSpOC) for processing. Three systems have been modified to Upgraded Early Warning Radar (UEWR) status. 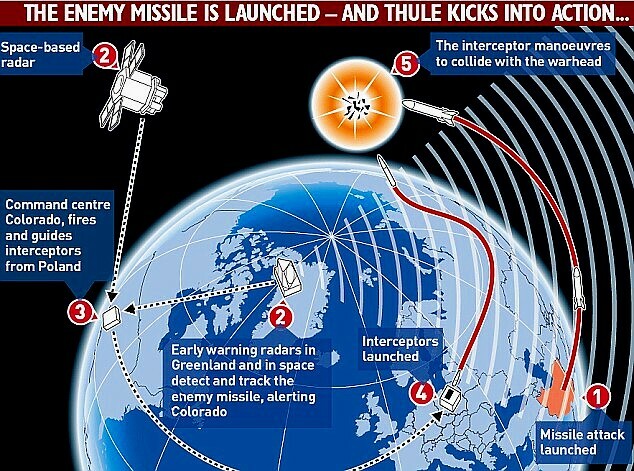 They are located at Beale Air Force Base, Calif., Thule Air Force Base, Greenland and Fylingdales, England. 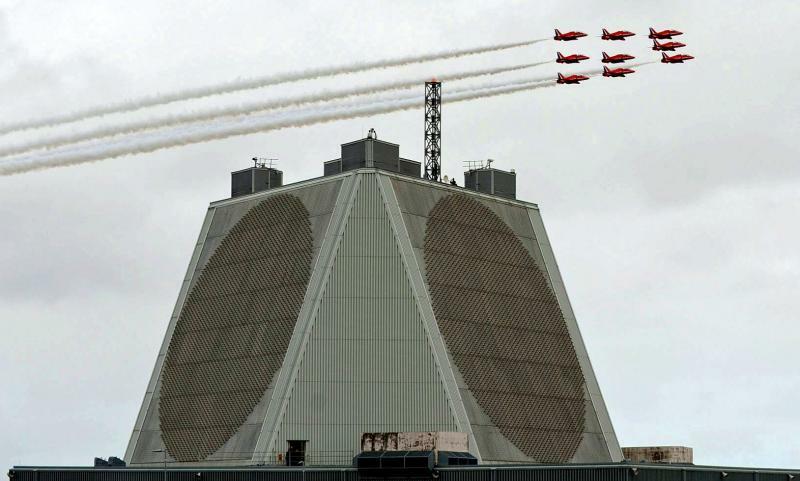 The Fylingdales system is operated by the British Royal Air Force. 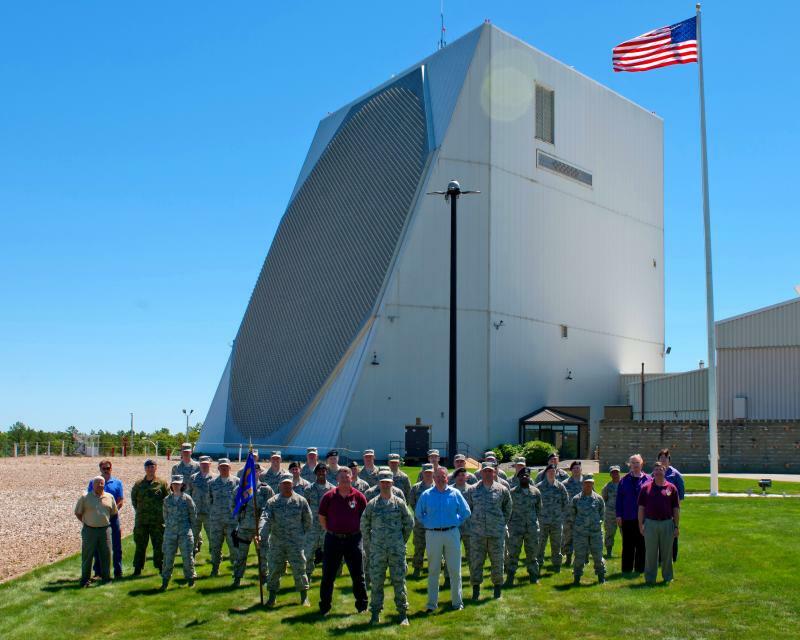 The UEWR syst- ems have a co-primary mission to provide missile tracking data to the U.S. Missile Defense Agency Fire Control Center. 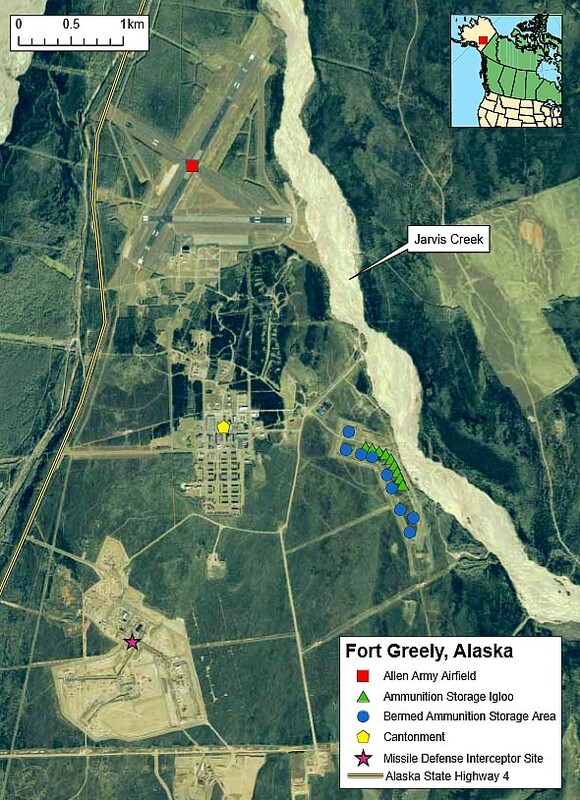 The other two systems are located at Cape Cod Air Force Station, Mass., and Clear Air Force Base, Alaska. 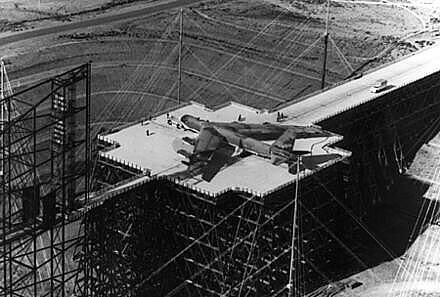 RAF Fylingdales is a Royal Air Force station on Snod Hill in the North York Moors, England. 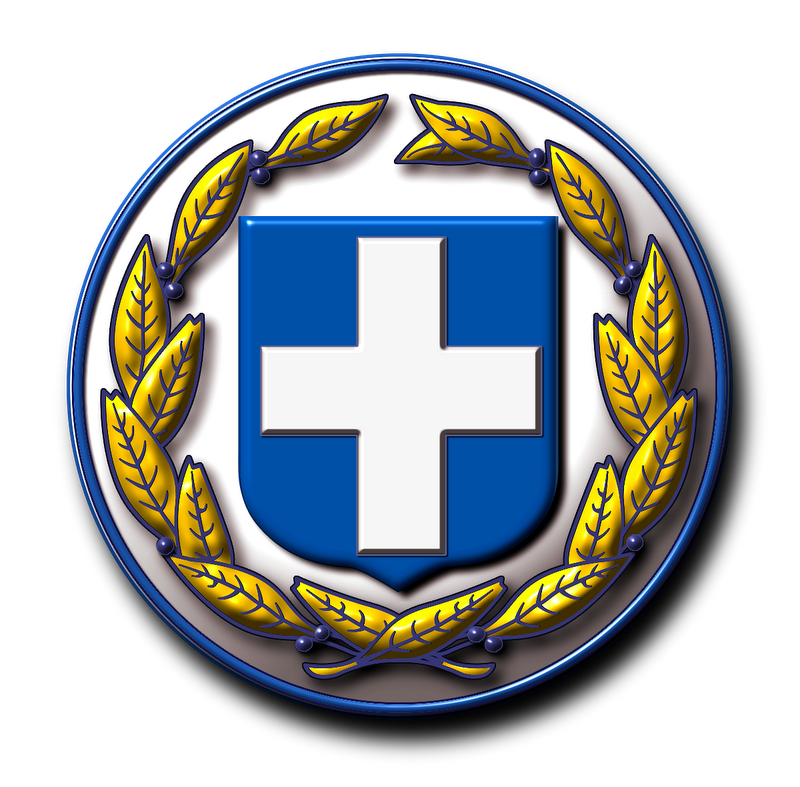 Its motto is "Vigilamus," meaning that "We are watching". 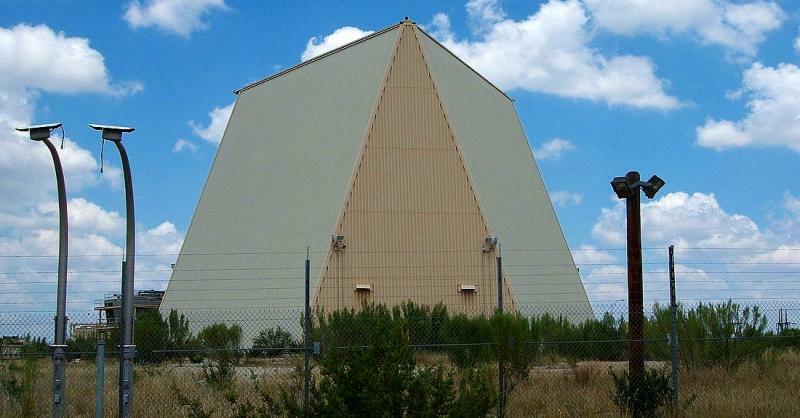 It is a radar base and part of the United States-controlled Ballistic Missile Early Warning System. 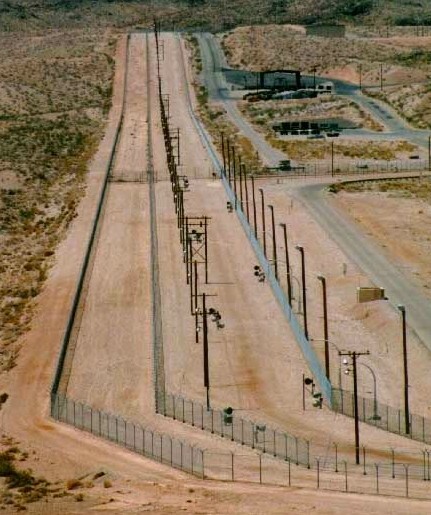 As part of intelligence shar- ing arrangements between the United States and United Kingdom, data collected at RAF Fylingdales are shared between the two countries. A phased array antenna, as with any other directional antenna, will receive signals from space only in the direction in which the beam is aimed. The maximum practical deflection on either side of antenna center of the phased array beam is 60 degrees. This limits the coverage from a single antenna face to 120 degrees. 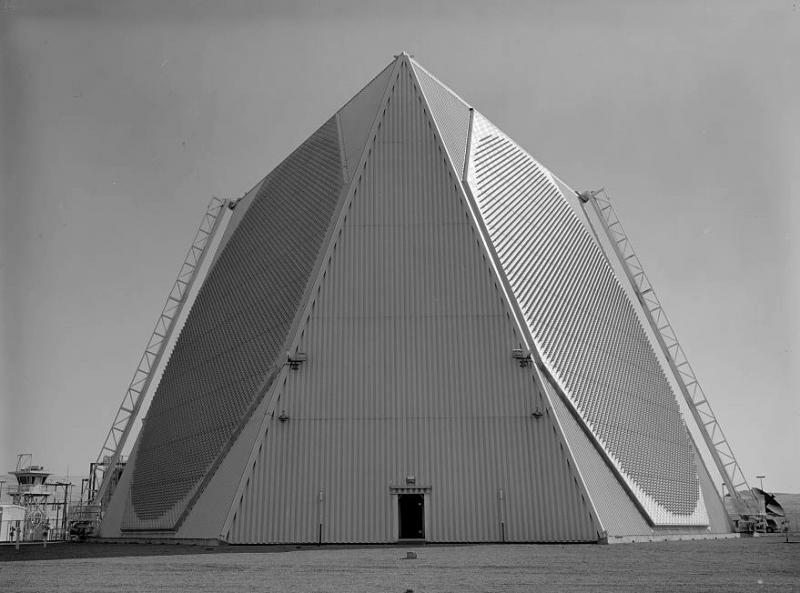 To provide surveillance across the horizon, the building housing the entire system and supporting the antenna arrays is construc- ted in the shape of a triangle. The two building faces supporting the arrays, each covering 120 degrees, 240 degrees of azimuth. The array faces are also tilted back 20 degrees to allow for an elevation deflection from three to 85 degrees above horizontal. 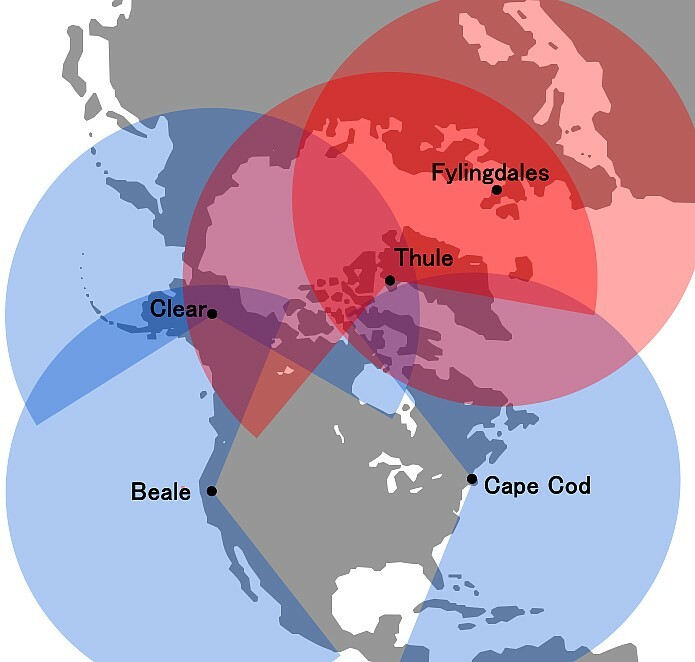 The radar system is capable of detecting and tracking multiple targets that would be indica- tive of a massive missile attack. 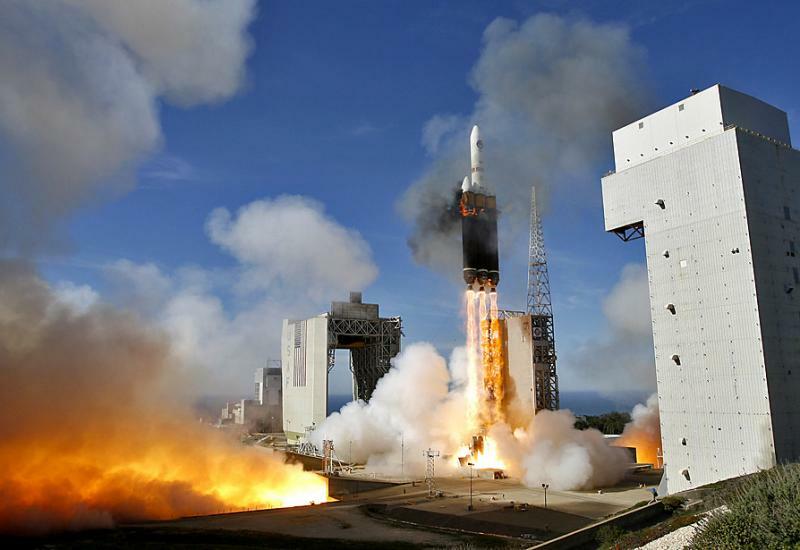 The system must rapidly discriminate between vehicle typ- es, calculate their launch and impact points, and perform scheduling, data processing and communications requirements. 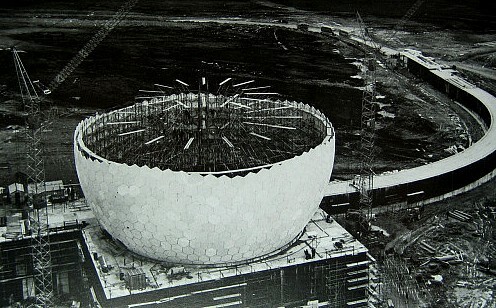 1962 Cold War, Fylingdales "golf ball" radar domes. 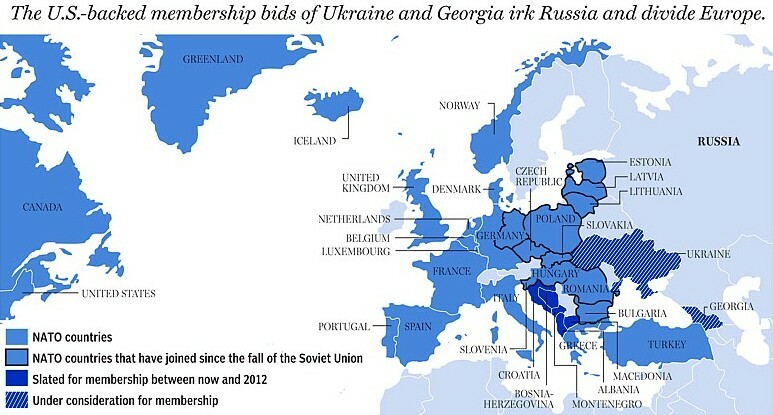 "This could alter the balance of power in Europe," Peskov told reporters at a press conferen- ce on Wednesday. He continued, "And without a doubt it would demand that Russia take necessary countermeasures to restore the strategic balance and parity. 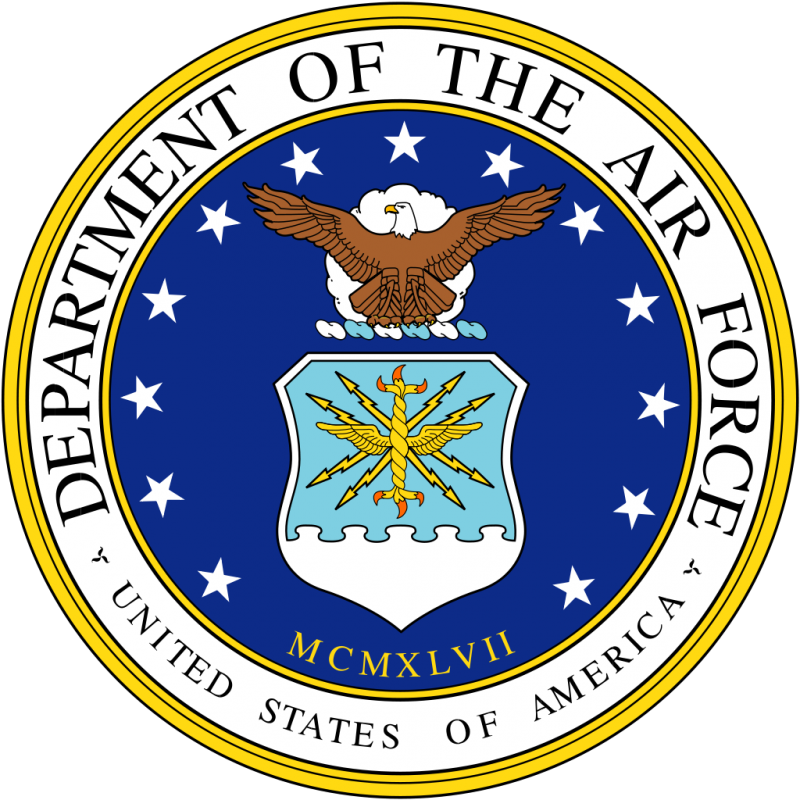 Ramstein Air Base is a United States Air Force (USAF) base in the German state of Rheinland Pfalz. 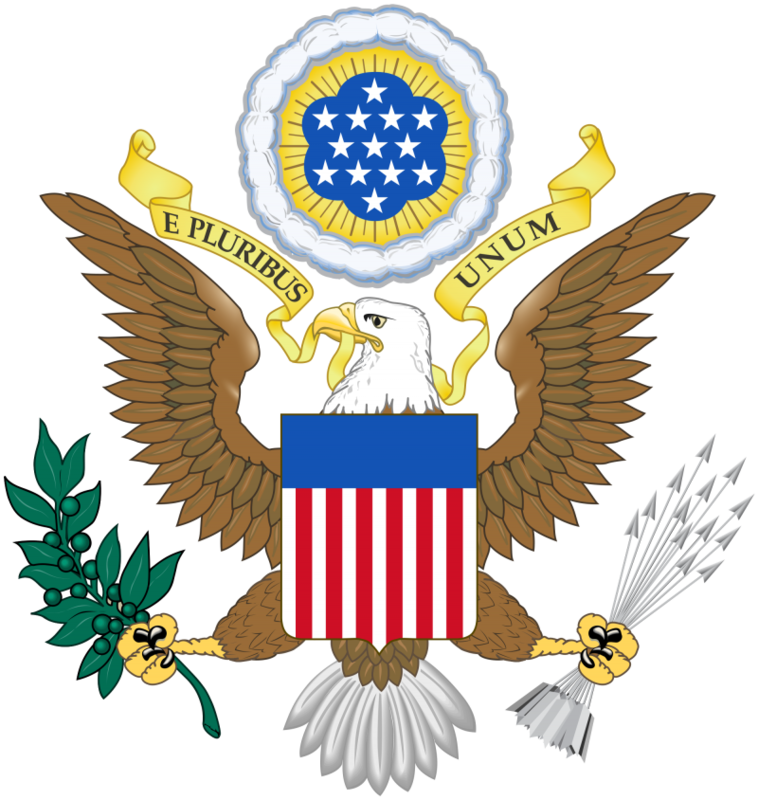 It serves as headquarters for the United States Air Forces in Europe (USAFE) and is al- so a North Atlantic Treaty Organization NATO installation. 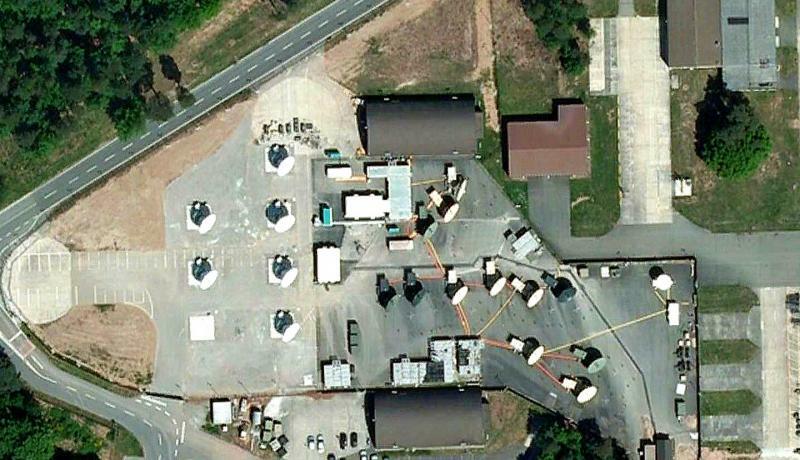 Ramstein is located near the town of Ramstein, in the rural district of Kaiserslautern, Germany. 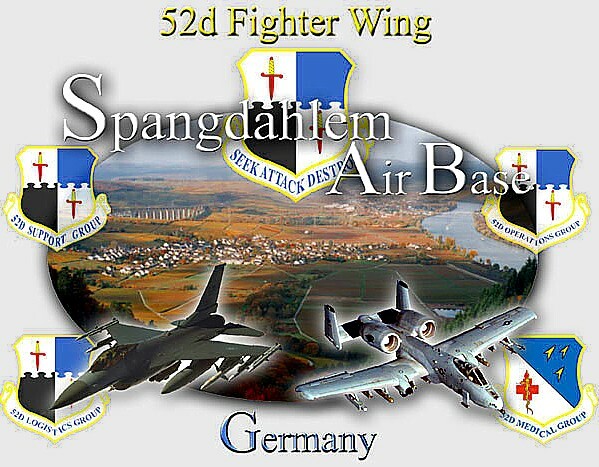 Spangdahlem is home of the 52d Fighter Wing which maintains, deploys and employs Lockhe- ed Martin Block 50 F-16CJ and Republic A/OA-10 aircraft and TPS-75 radar systems in support of NATO and the national defense directives. 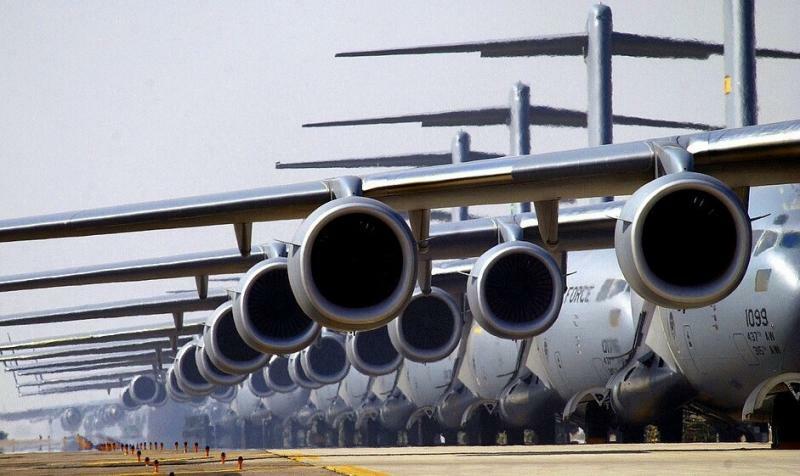 In addition Air Mobility Command supports cargo and passenger traffic as part of its airlift mission. 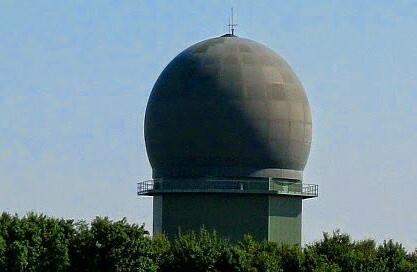 It was built for the RAF Germany in 1952 and opened in August 1954. The Jagdbombergesch wader 31 or Fighter-Bomber Wing 31 was the first fighterbomber wing with Republic F-84F Thunderstreak of the United States Air Force using by the German Air Force in 1958 at Nör- venich Air Base. 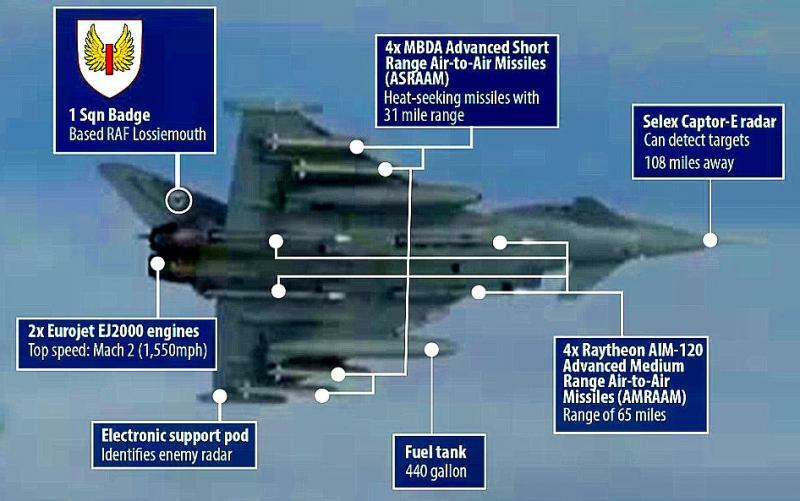 Since June 2010 the squadron flies the Eurofighter Typhoon. 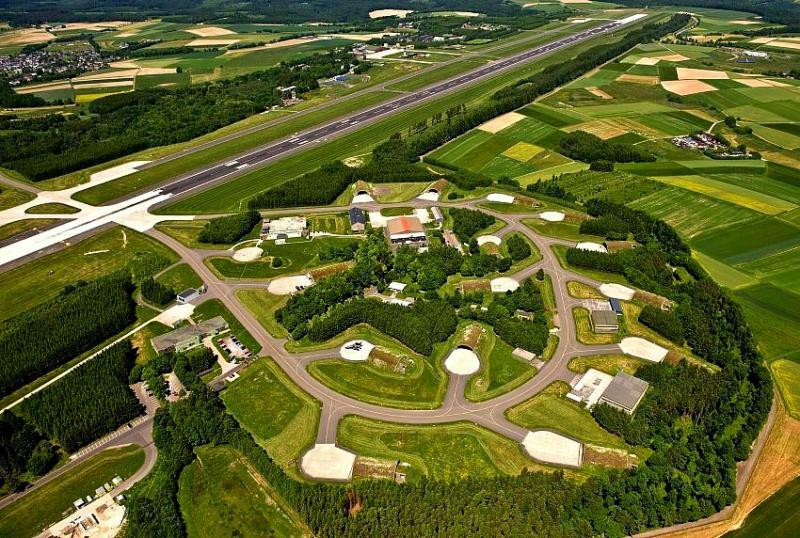 ﻿Büchel Air Base is a military air base of the German Luftwaffe near the city of Cochem and at about 45 miles from Spangdahlem Air Base . 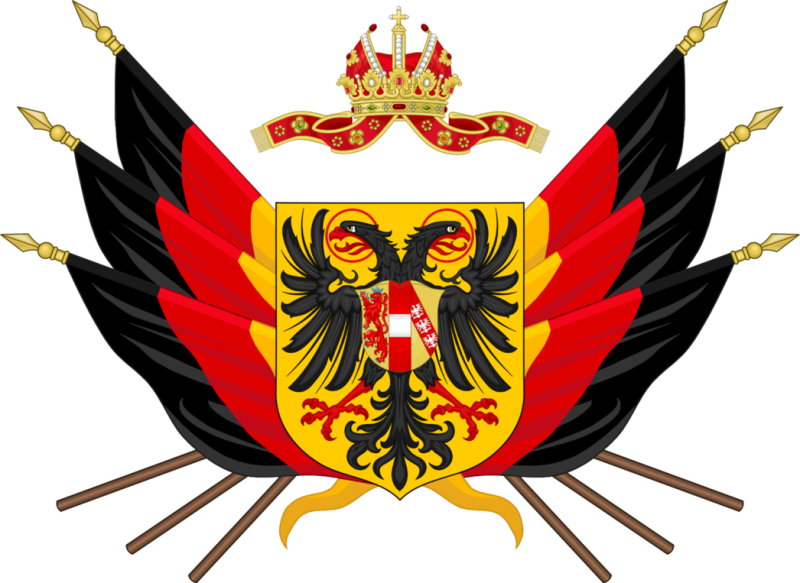 It is home to the Tactical Air Force Wing 33 of the German Air Force and the 702 Munition Support Squadron of the United States Air Force. Since 1985, the TaktLwG 33 operates German Panavi Tornado airplanes, which are capable of delivering the twenty B61-12 nuclear boms. 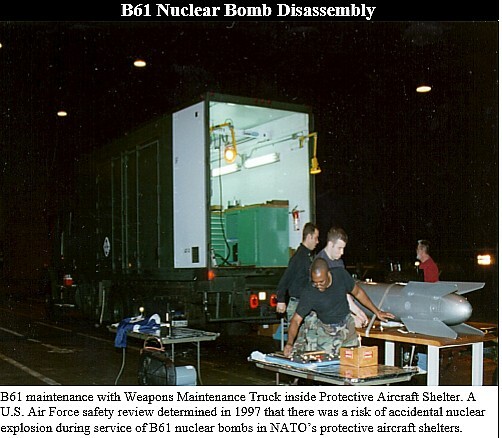 Under the NATO Nuclear Sharing Agreement, these twenty B61 bombs require a dual key system, with the simultaneous authorizations of Germany and the United States, before any action is taken. 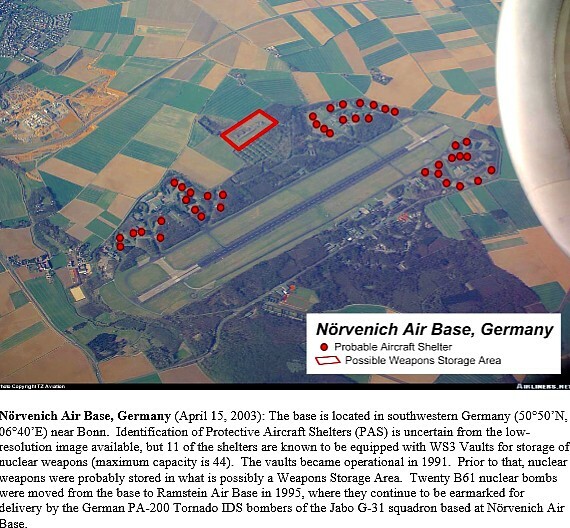 Since July 2007, the air base is the only location in Germany with nuclear weapons. 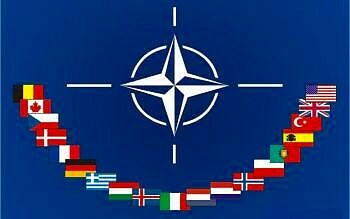 According to the press, Eastern European Member States of NATO have resisted the withdraw- al of the shared nuclear bombs from Europe, fearing it would show a weakening of the US commitment to defend Europe against Russia. 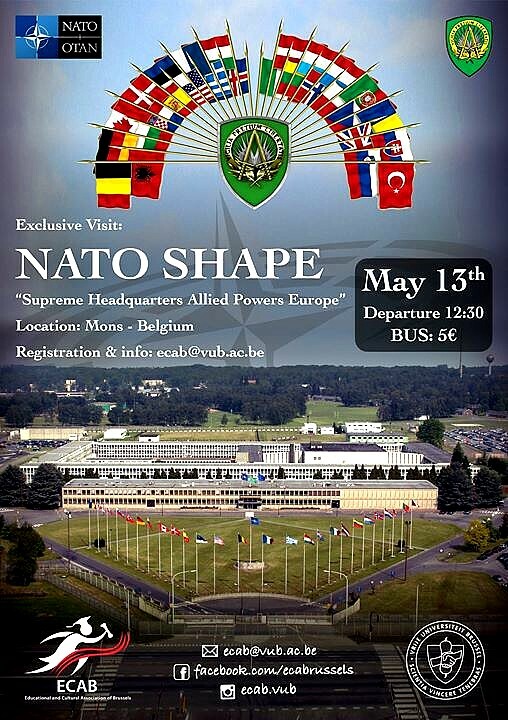 ﻿Supreme Headquarters Allied Powers Europe SHAPE in Mons, Belgium is the headquarters of the North Atlantic Treaty Organization's Allied Command Operations. 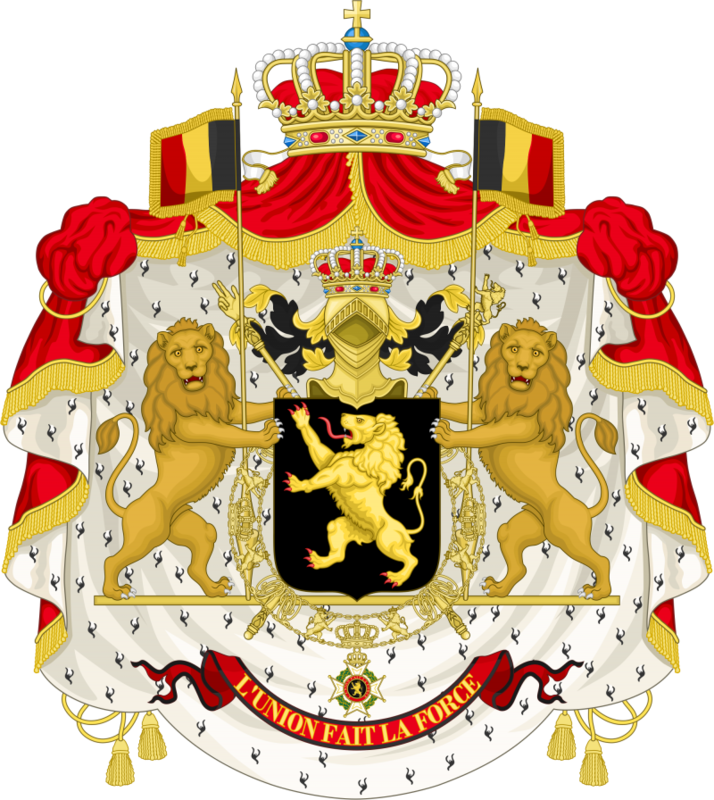 Since 1967 it has been located at Cas- teau, north of the Belgian city of Mons but it had previously been loc- ated from 1953 at Rocquecourt, next to Versailles, France. 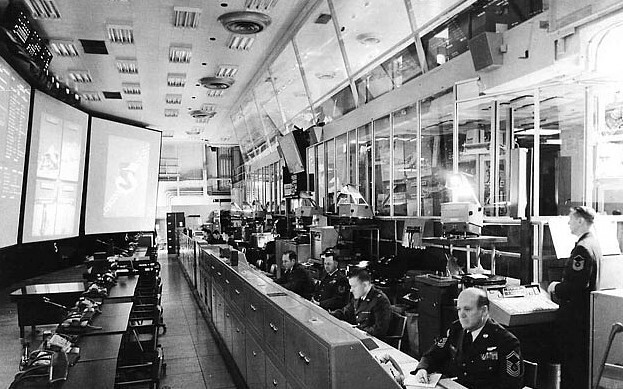 From 1951 to 2003, SHAPE was the headquarters of Allied Command Europe, ACE. 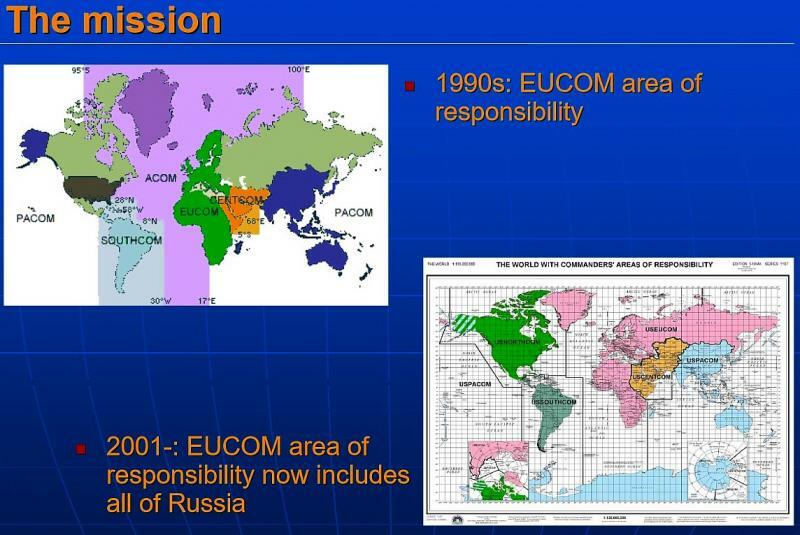 Since 2003 it has been the headquarters of Allied Command Operations (ACO), controlling all NATO operations worldwide. 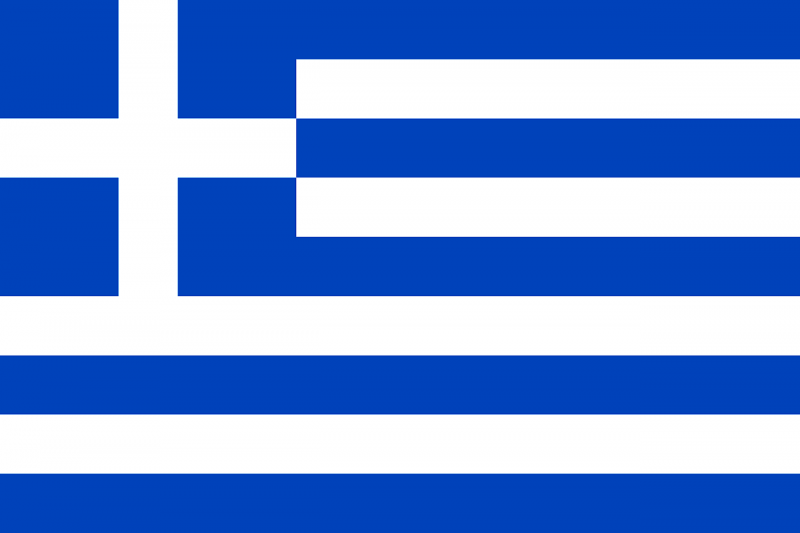 SHAPE retained its traditional name with reference to Europe for legal reasons although the geographical scope of its activities was extended in 2003. 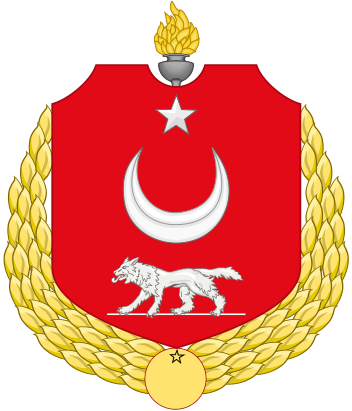 At that time, NATO's command in Lisbon, historically part of the Atlantic command, was reassigned to ACO. 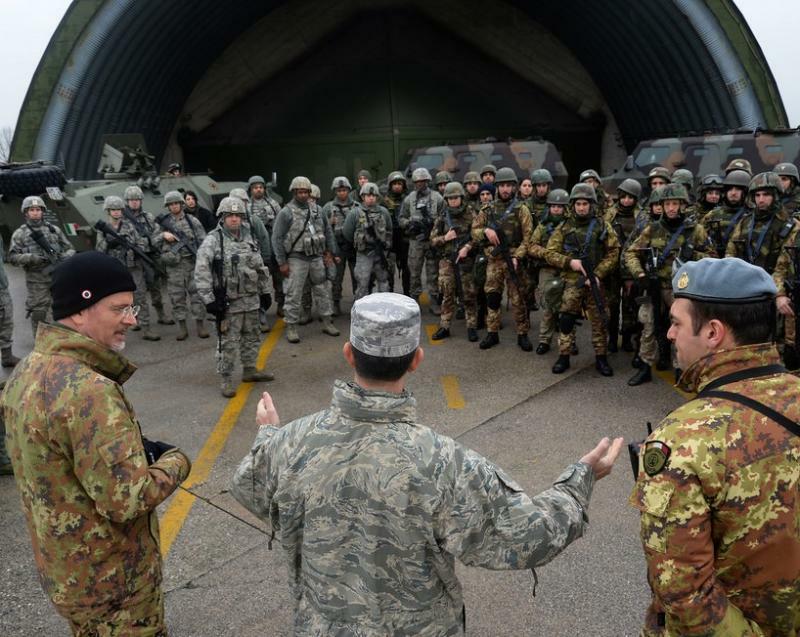 The commander of Allied Command Operations has also retained the title "Supreme Allied Commander Eur- ope" SACEUR, and continues to be a U.S. four-star general officer or flag officer, who also serves as Commander, U.S. European Command. 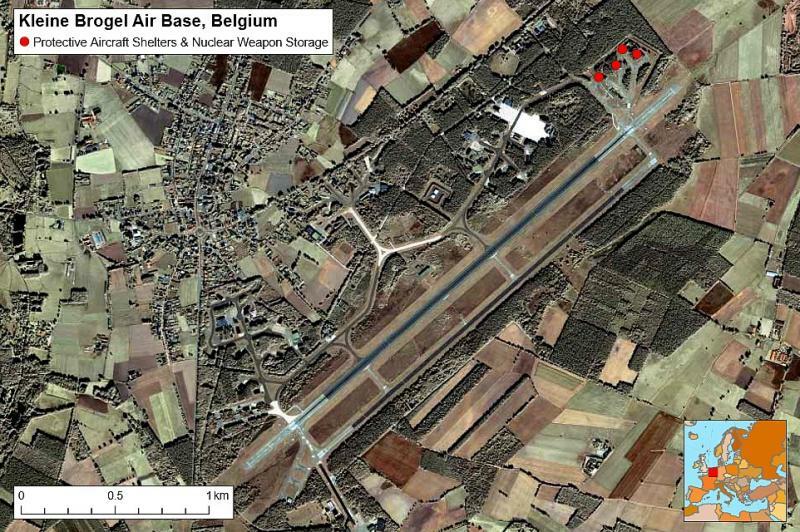 Belgium is also host of US nuclear weapons on the airforce base of Kleine Brogel. 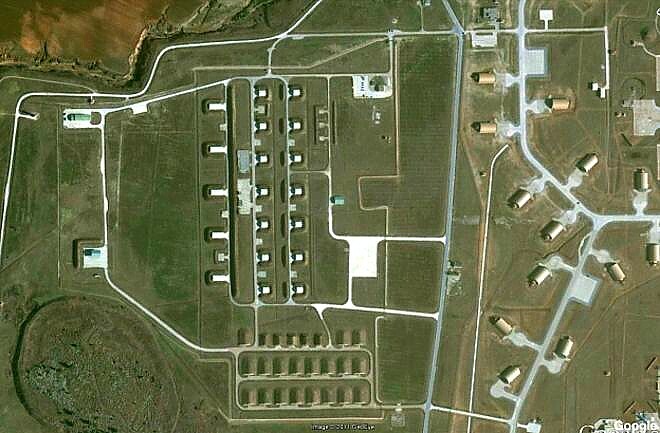 This base contains a US MUNSS or Munition Support Squadron as guards and maintenance group for the nuclear weapons. 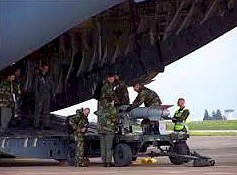 But the base has mostly Belgian military and the F-16 wing tasked with flying nuclear weapons is Belgian as well. 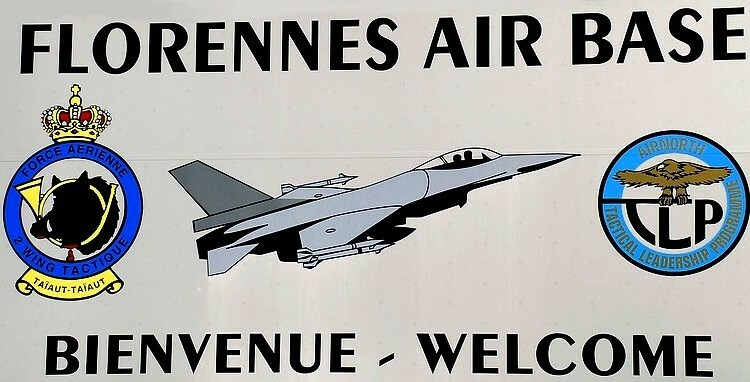 The other airforce base with F-16's is Florennes. In total the Belgian airforce has 72 operati- onal F16's of which 60 have NATO tasks. Through the Control and Reporting Centre in Glons and the Air Traffic Control Centre in Semmerzake the air operations are co-ordinated. 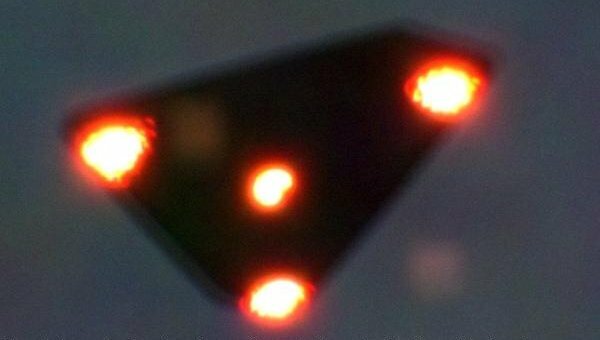 The UFO triangle had been moving slow and low over the rolling hills of Belgium near City of Glons, just southeast of Brussels. 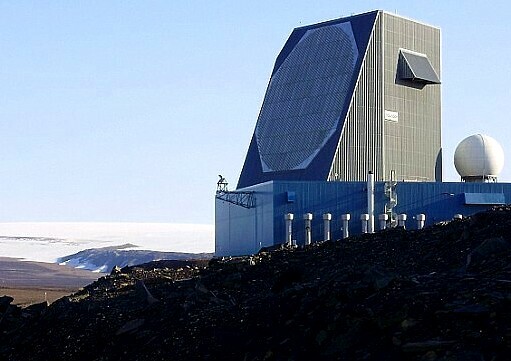 When a NATO manned radar station first reported﻿. Below, Triangel UFO photograped near Glons, Belgium. The Belgian UFO wave began in November 1989. The events of 29 November would be doc- umented by no less than thirty different groups of witnesses, and three separate groups of police officers. 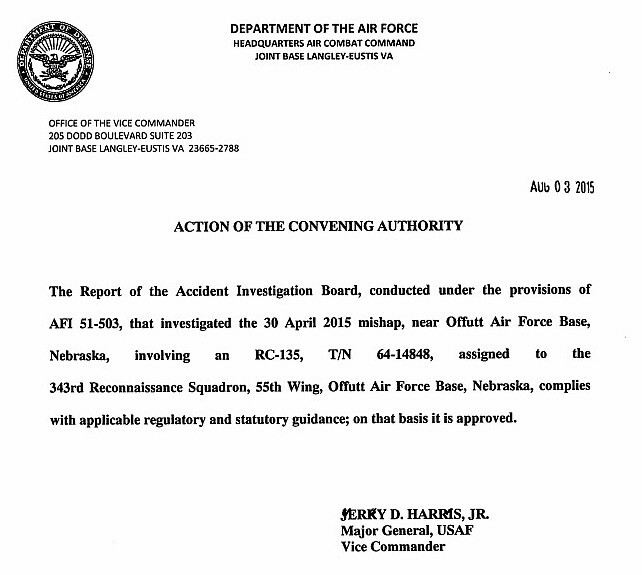 All of the reports related a large object flying at low altitude. The craft was of a flat, triangular shape, with lights underneath. 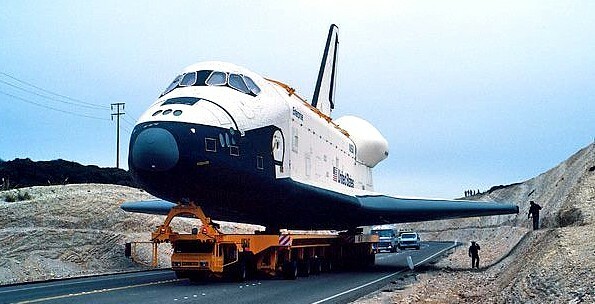 This giant craft did not make a sound as it slowly moved across the landscape of Belgium. 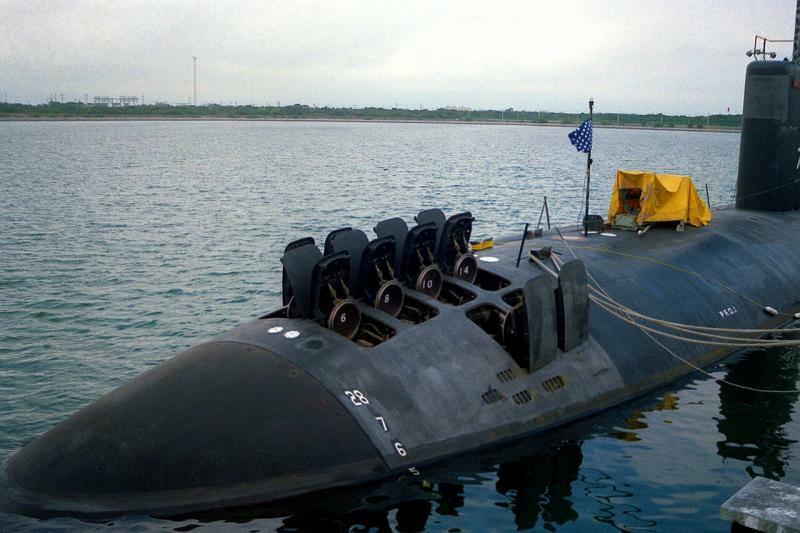 There was free sharing of information as the Belgian populace tracked this craft as it moved from the town of Liege to the border of the Netherlands and Germany. Below, radar image of one of the mnay UFO's over Belgium and and one og many F-16sleft sent up to trace the unidentified flying objects. The Belgian UFO wave peaked with the events of the night of 30–31 March 1990. On that night, unknown objects were tracked on radar, chased by two Belgian Air Force F16's, phot- ographed, and were sighted by an estimated 13,500 people on the ground – 2,600 of whom filed written statements describing in detail what they had seen. 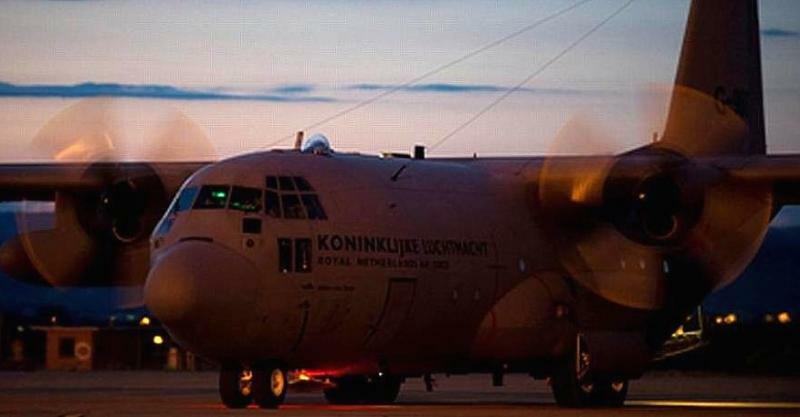 Following the incident, the Belgian air force released a report detailing the events of that night. At around 23:00 on 30 March, the supervisor for the Control Reporting Center at Glons- received reports that three unusual lights were seen moving towards Thorembais-Gem- bloux, which lies to the southeast of Brussels. The lights were reported to be brighter than stars, changing color between red, green and yellow, and appeared to be fixed at the vert- ices of an equilateral triangle. At this point, Glons CRC requested the Wavre Gendarmie send a patrol to confirm the sighting. Approximately 10 minutes later, a second set of lights was sighted moving towards the first triangle. By around 23:30, the Wavre gendarmerie had confirmed the initial sightings and Glons CRC had been able to observe the phenomenon on radar. During this time, the sec- ond set of lights, after some erratic manoeuvres, had also formed themselves into a smaller triangle. 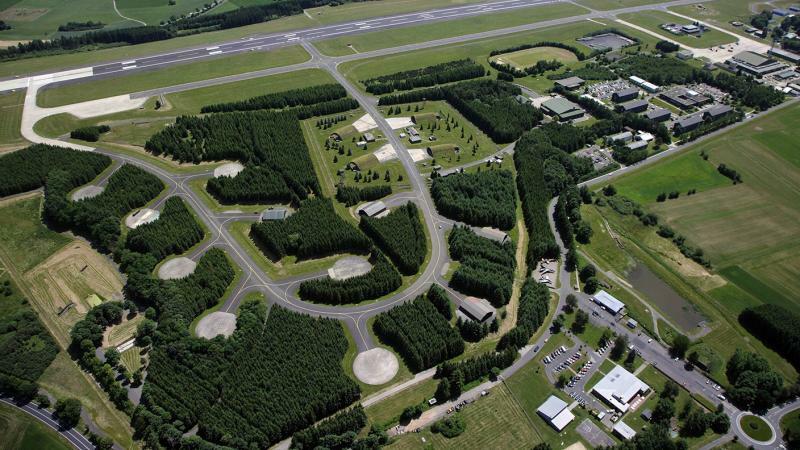 After tracking the targets and after receiving a second radar confirmation from the Traffic Center Control at Semmerzake, Glons CRC gave the order to scramble two F-16 fight- ers from Beauvechain Air Base shortly before midnight. Throughout this time, the pheno- menon was still clearly visible from the ground, with witnesses describing the whole form- ation as maintaining their relative positions while moving slowly across the sky. Witnesses also reported two dimmer lights towards the municipality of Eghezee displaying similar er- ratic movements to the second set of lights. 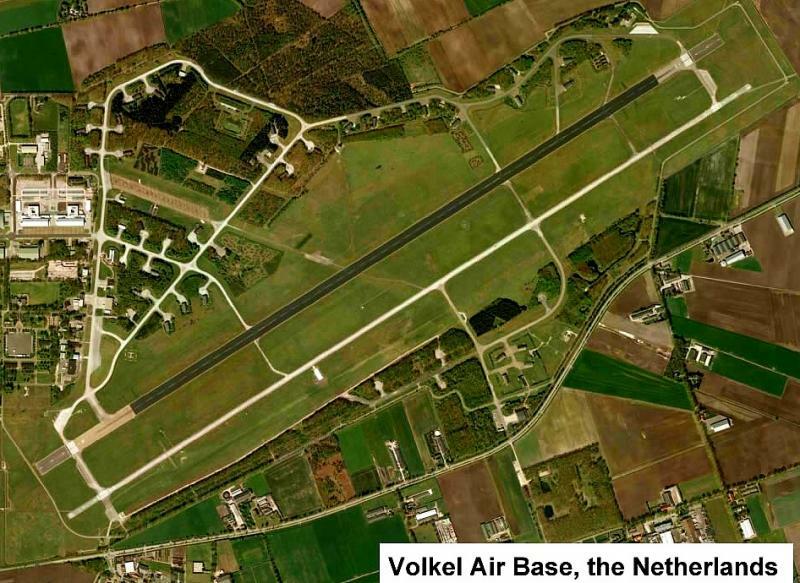 Volkel Air Base is a military airbase used by the Royal Netherlands Air Force and is located near the town of Uden, Noord-Brabant, in the Netherlands. 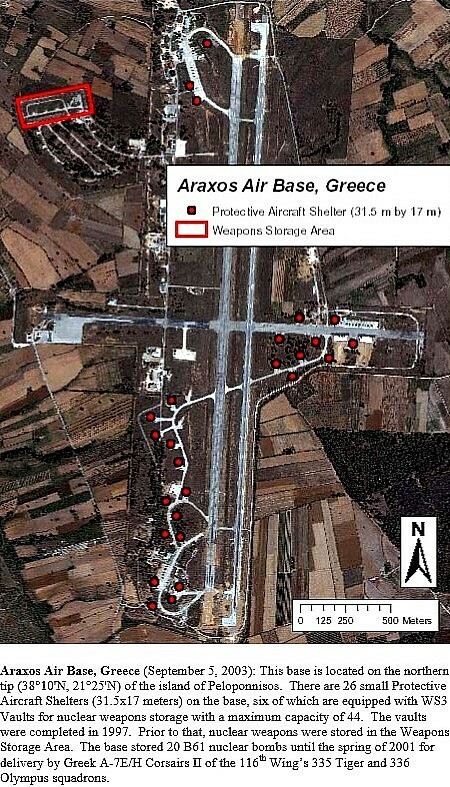 It is home to three F-16 Fighting Falcon squadrons, 311, 312 and 313. 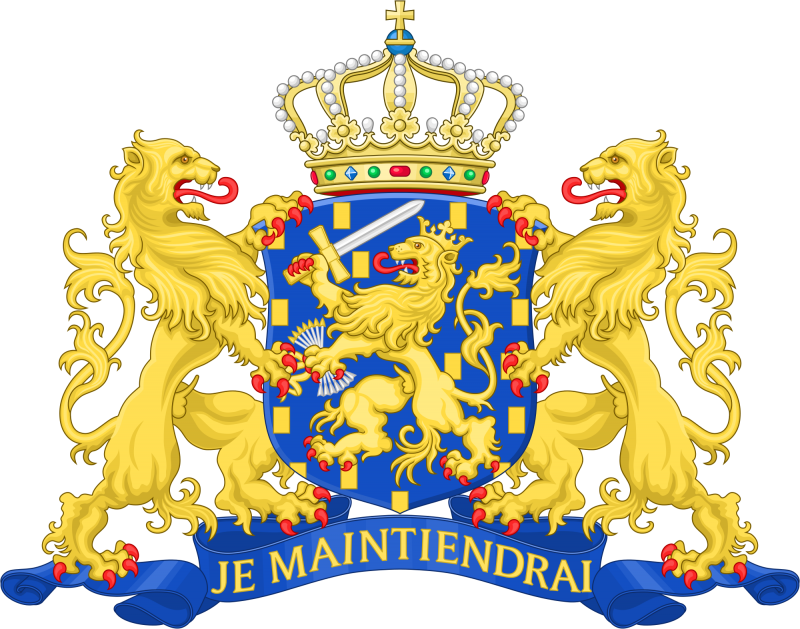 It also houses a maintenance, logistical, a base Squad- ron for the RNLAF, and also the 703rd Munitions Support Squadron, part of the 52d Fighter Wing from the United States Air Force. 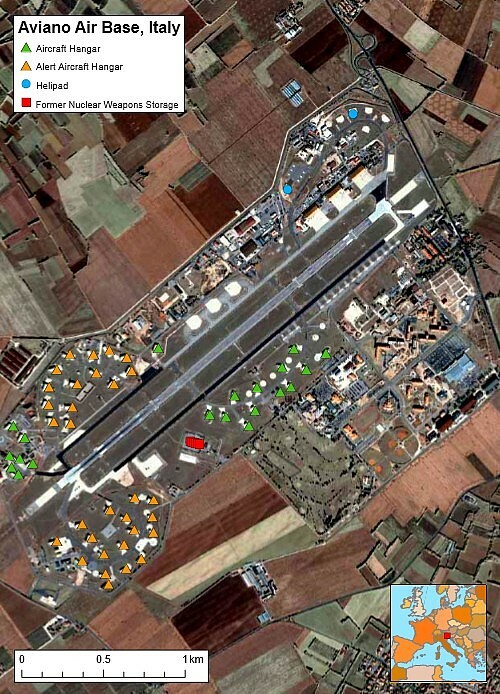 Aviano Air Base is a NATO base in northeastern Italy, in the Friuli-Venezia Giulia region. It is located in the Aviano municipality, at the foot of the Carnic Pre-Alps,or Southern Carnic Alps about 15 kilometers from Pordenone. 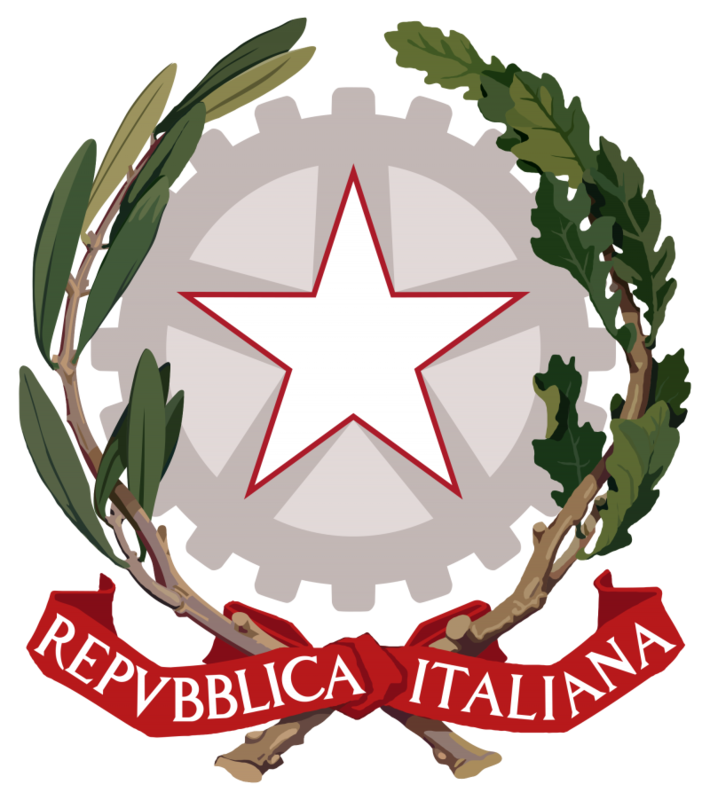 The Italian Air Force has ownership and administra- tive control of the base and hosts the U.S. Air Force's 31st Fighter Wing. 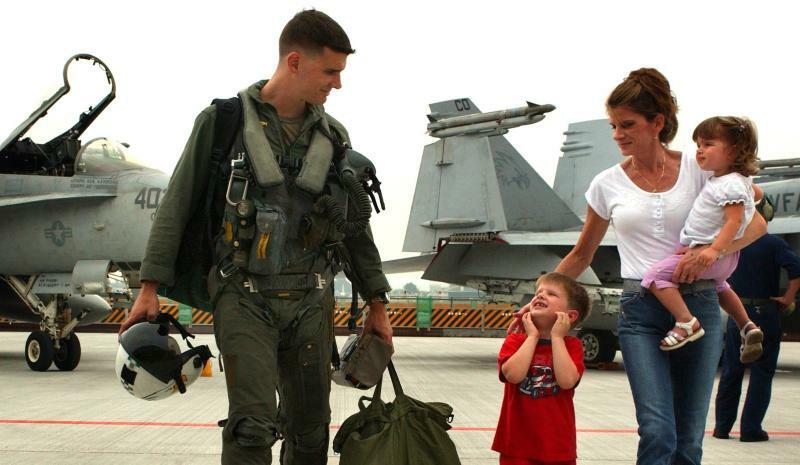 The 31st FW is the only U.S. fighter wing south of the Alps. 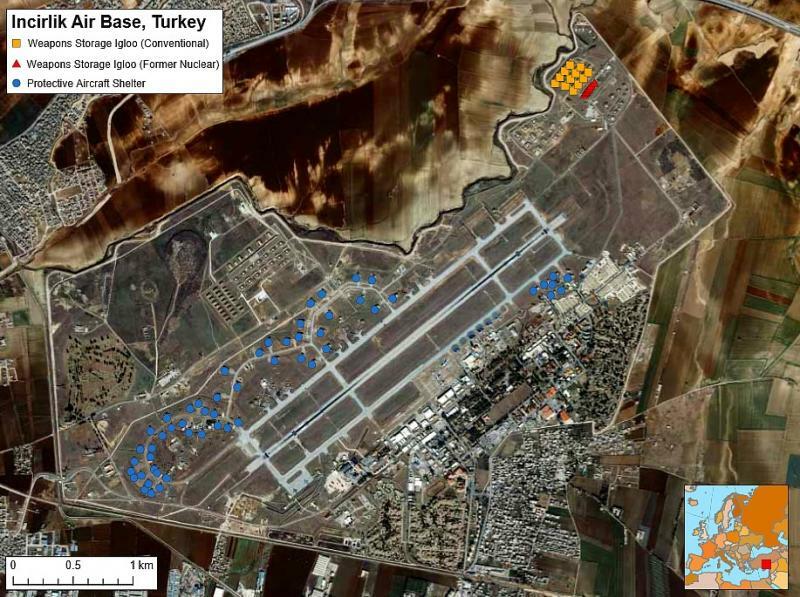 This strategic location makes the wing critical to operations in NATO's southern region. 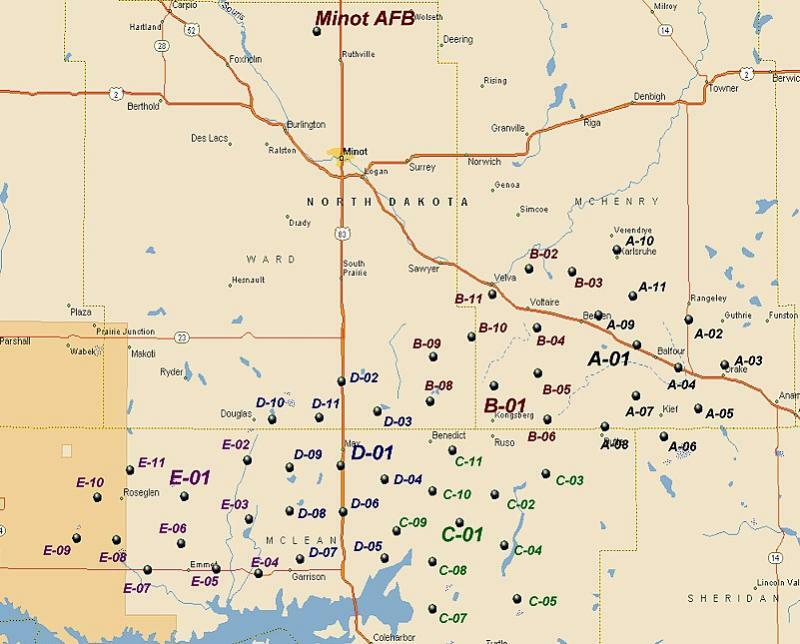 The 31st FW maintains two F-16 fighter squadrons, the 555th Fighter Squadron and the 510th Fighter Squadron, allowing the wing to conduct offense and defensive combat air operati- ons. 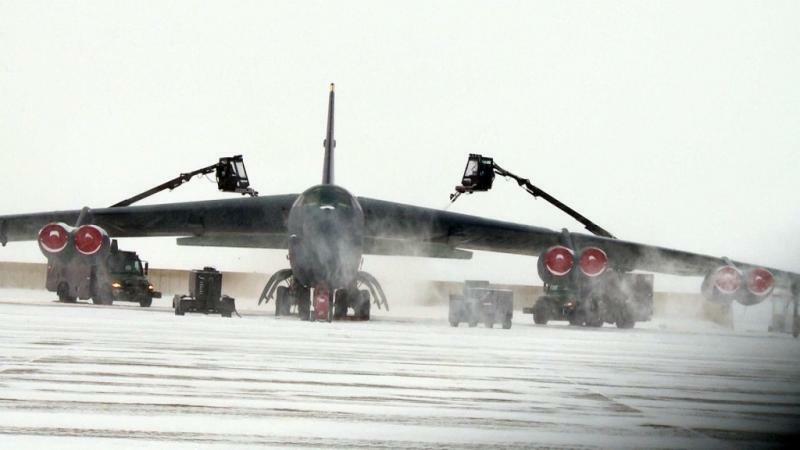 In peacetime, the 31st FW prepares for its combat role by maintaining aircraft and per- sonnel in a high state of readiness. 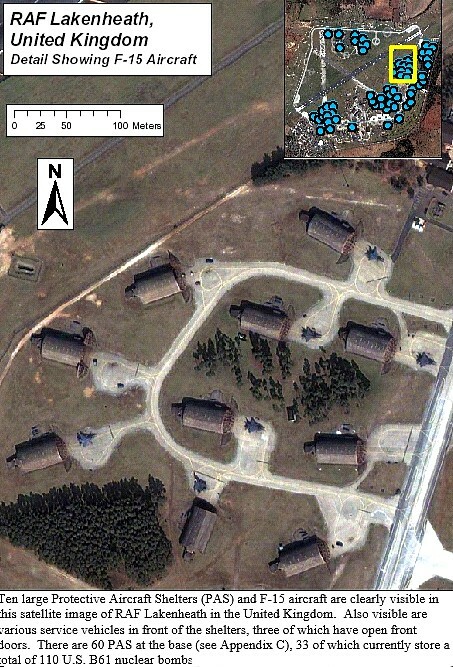 The base is one of six NATO sites in Europe which hold tactical nuclear weapons. 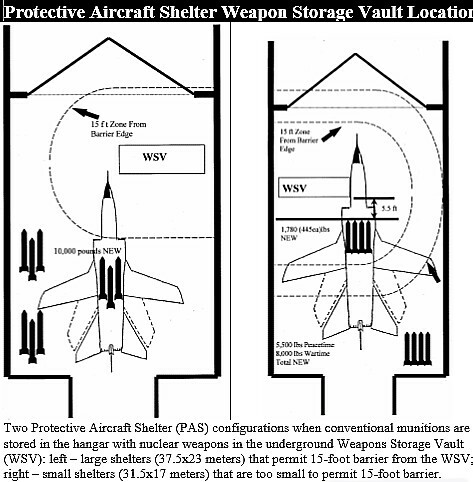 Until 2001, U.S.B61 nuclear bombs intended for delivery by Hellenic Air Force A7-H aircraft under NATO nuclear weapons sharing arrangements were stored in vaults inside the base's hardened aircraft shelters using the WS3 weapons Storage and Security System. 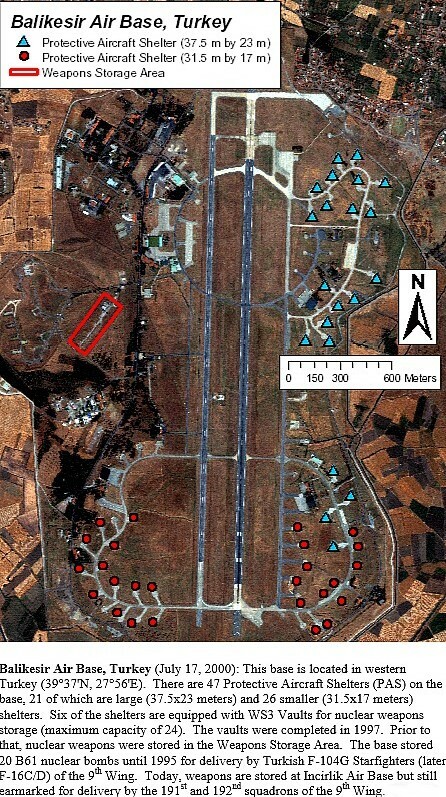 The runway length is 3352 m running in a south to north direction. 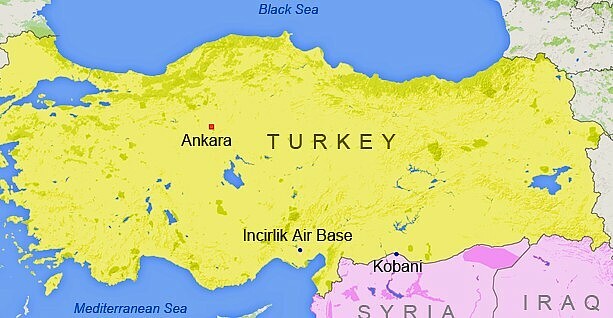 The military installations are acces- sed from Lakkopetra to the north. 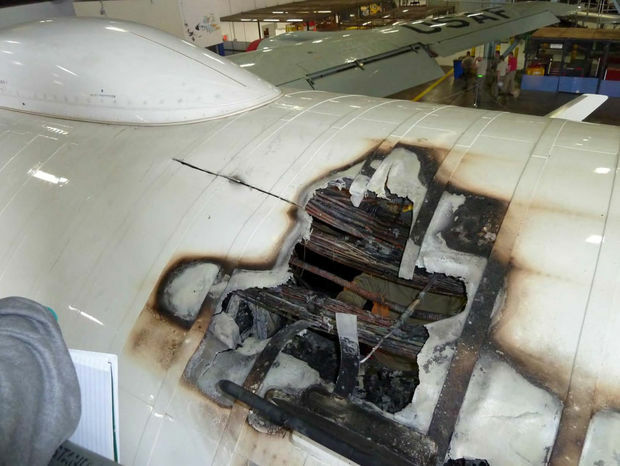 Following 2001, the RQ-1 Predator became the primary unmanned aircraft used for offens- ive operations by the USAF and the CIA in Afghanistan and the Pakistani tribal areas ; it has also been deployed elsewhere. 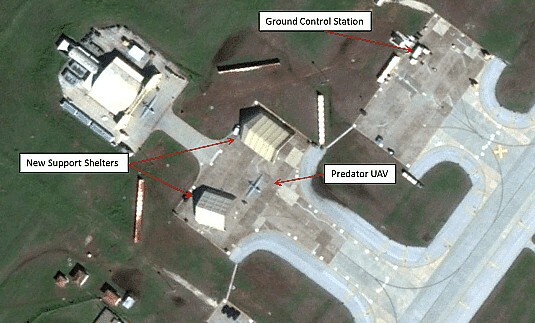 ﻿Because offensive uses of the Predator are declassified, U.S. military officials have reported an appreciation for the intelligence and reconnaissance-gath ering abilities of UAVs but declined to publicly discuss their offensive use. 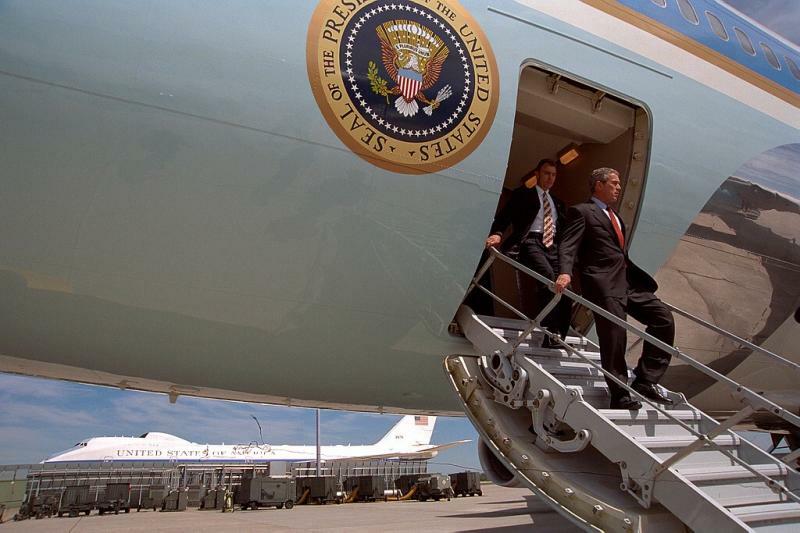 Russia to aim Nuclear Weapons at NATO and US as response to European "Defencive Missile Shield"
Offutt Air Force Base is a US Air Force installation near Omaha, and lies adjacent to Bellevue in Sarpy County Nebraska. 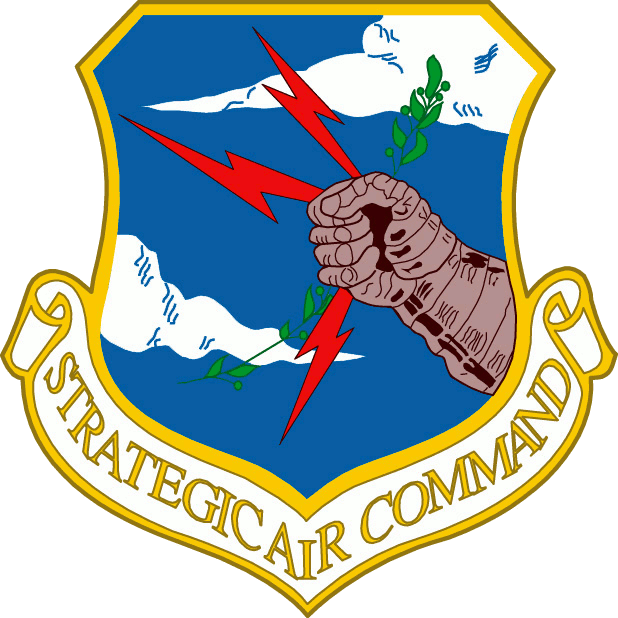 It is the Headquarters of US Strategic Command US STRATCOM the Air Force Weather Agency and the 55th Wing of the Air Combat Command, the latter serving as the host unit. 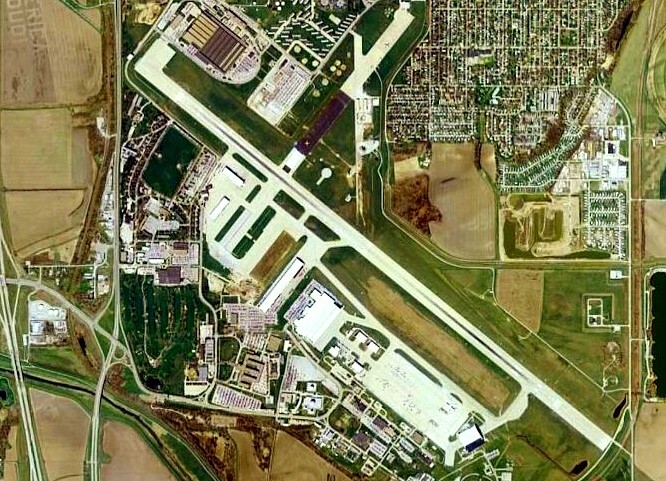 ﻿Aviation use at Offutt began in September 1918 during World War 1 as an Arme Air Service balloon field. 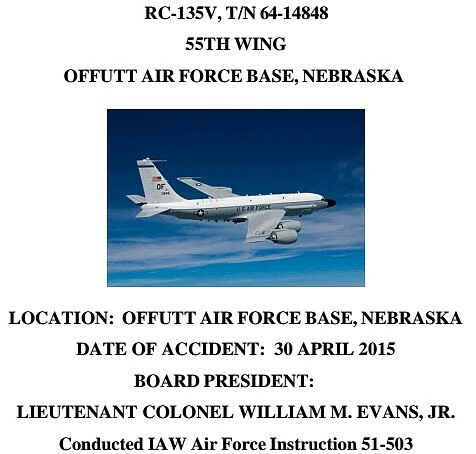 It was renamed in honor of World War 1 pilot and Omaha native 1st Lt. Jarvis Offutt in 1924. 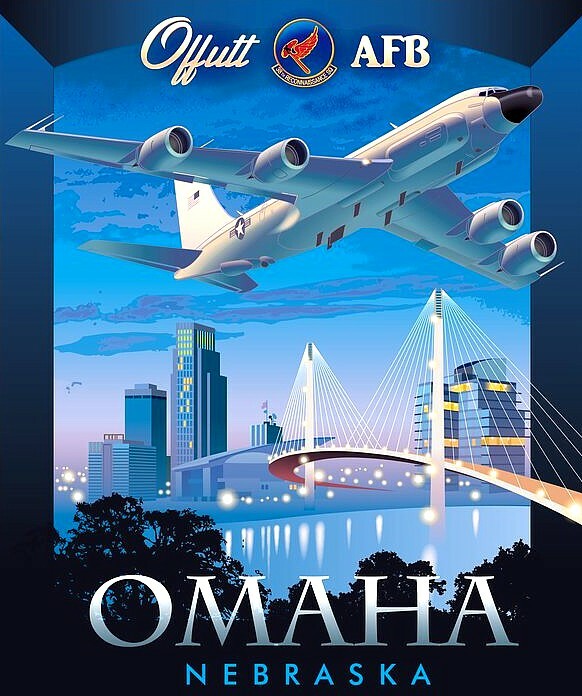 Offutt AFB's legacy includes the construction of the first two bombers to drop atomic bombs and over 40 years as the headquarters for the former Strategic Air Com- mand and home for its associated ground and aerial command centers for the U.S. in case of nuclear war during the Cold War. 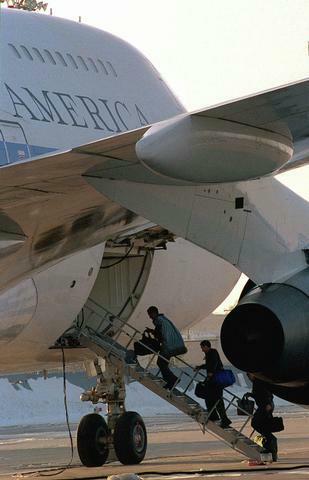 Below: Members of the National Airborne Operations Center climb into E-4B airborne com- mand post, assigned to the 55th Wing at Offutt AFB during the joint military exercise Global Guardian '98. 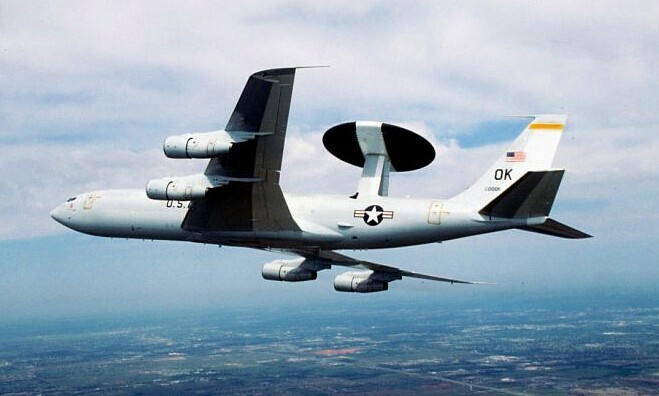 The 55 Wing mission is to provide dominant intelligence, surveillance, reconnaissance elec- tronic attack; command and control; and precision awareness to national leadership and warfighters across the spectrum of conflict any time, any place. One of the wing's units, the 55th Operations Group, operates 46 aircraft, including 13 models of seven different types. 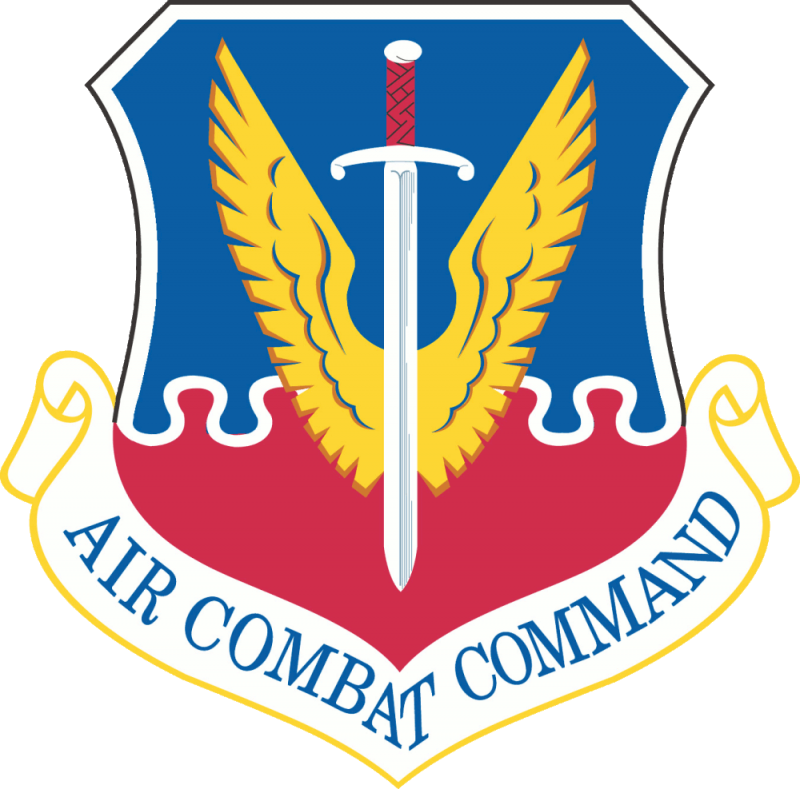 The 55th Operations Group, Air Combat Command's largest group, has operational control over 12 squadrons and two detatchments worldwide. The group consists of approximately 3,200 personnel. 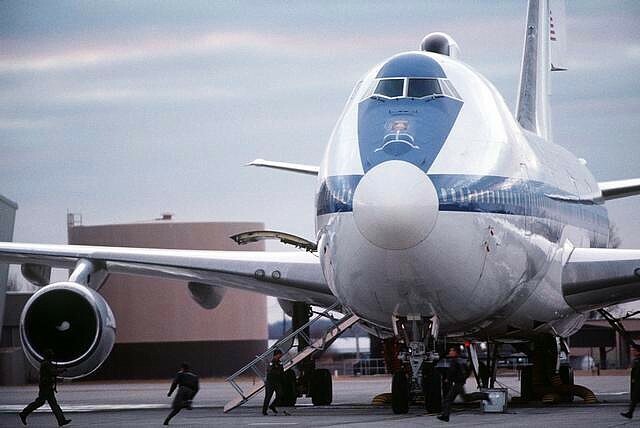 It employs 46 aircraft, including 13 models of seven different types. 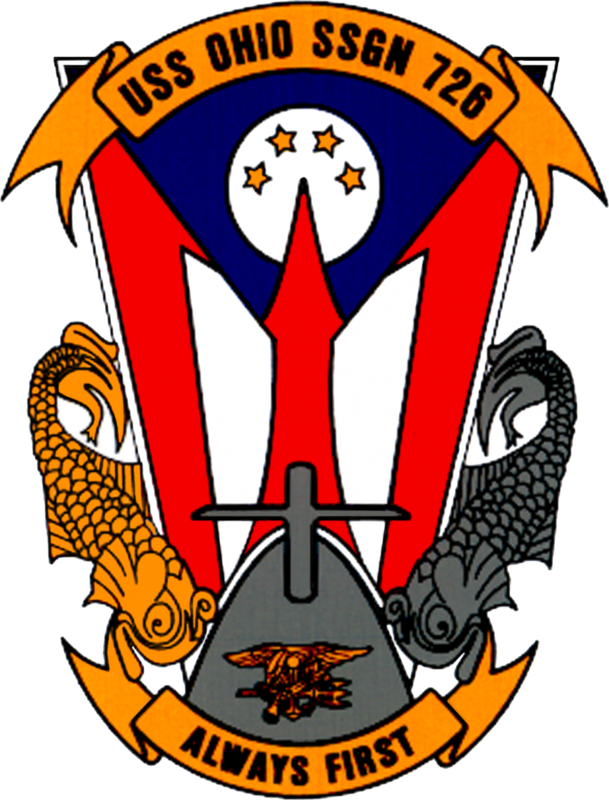 The 55th Operations Group uses tail code OF for it's aircraft. 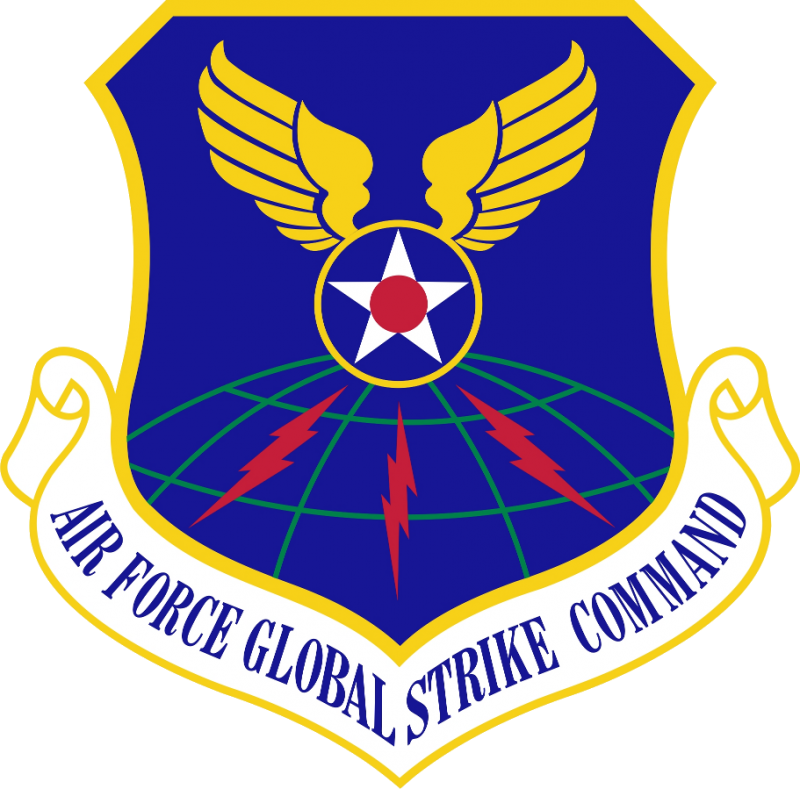 The 55th Electronic Combat Group, stationed at Davis-Monthan AFB, is an operations group and geographically separated unit of the 55th Wing. It consists of 5 squadrons, 3 flying squ- adrons, 1 support squadron and 1 maintenance squadron. All flying squa- drons utilize various models of the EC-130 aircraft. 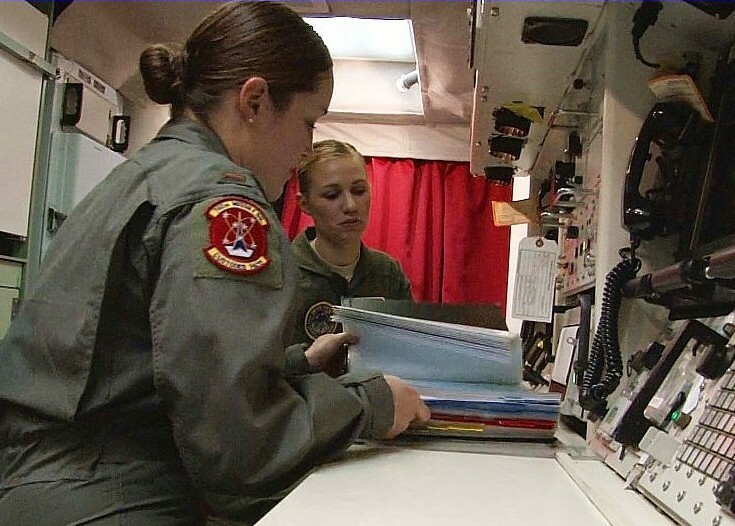 The 55th Maintenance Operations Squadron provides centralized direction of all main- tenance staff functions providing support to world-wide aircraft reconnaissance missi- ons. 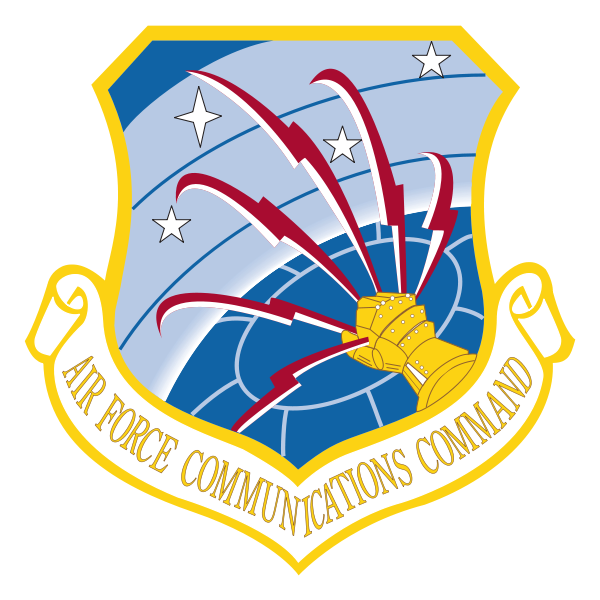 The 55th Communications Group provides worldwide command, control, comm unica- tions and computer systems, information management and combat support to war- fighting and national leadership. 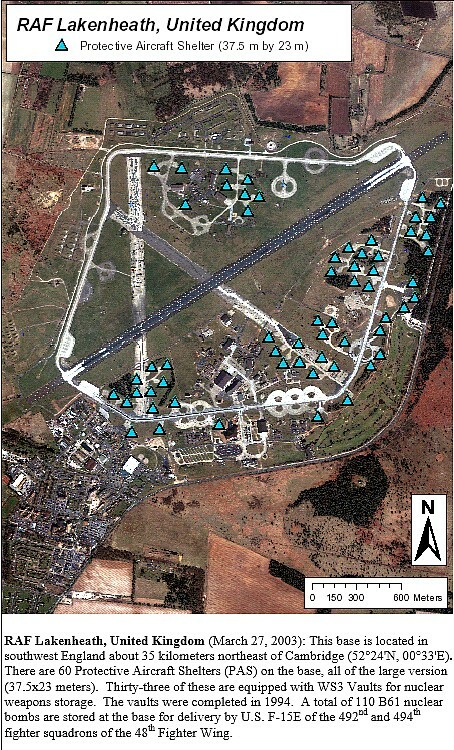 It also provides communications technology and sup- port to the 55th Wing and 44 tenant units. 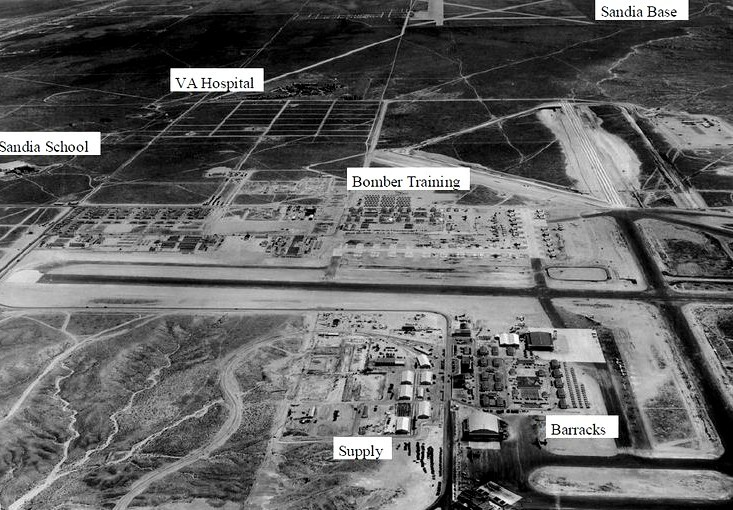 Kirtland Air Force Base serves as one of two main Air Force nuclear-weapons general depots in the United States. 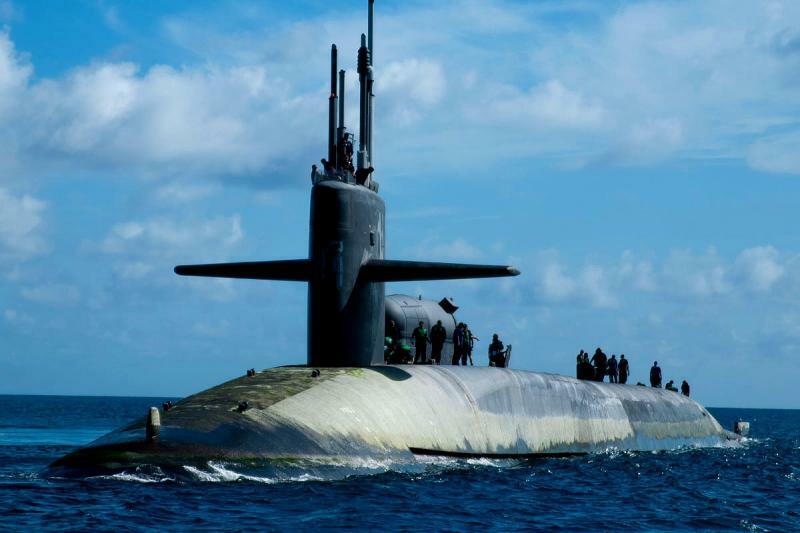 Because of its proximity to the Pantex Plant in Amarillo, Texas, where nuclear warheads are taken apart, Kirtland serves as a transshipment point to and from op- erational bases and storage sites. 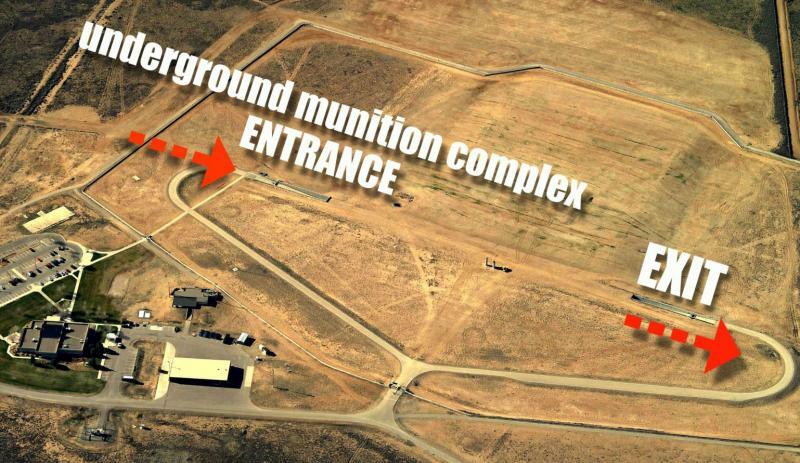 Nuclear weapons are stored in the recently built Kirtland Underground Munitions Storage Complex. 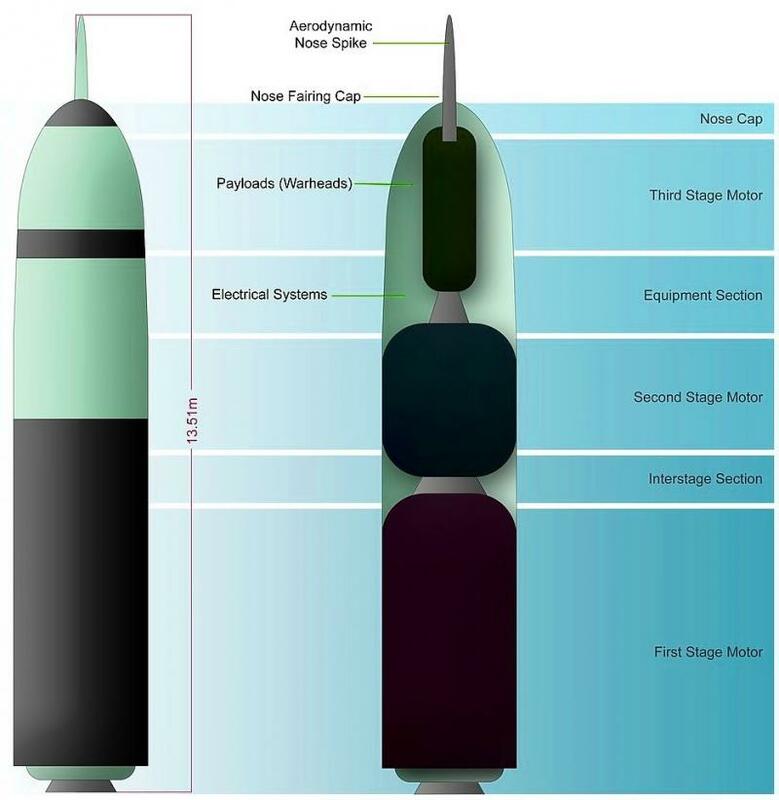 The types of bombs and warheads include B61-4, B61-7, B61-11, B83-0, W84-0, W87-0, and W62-0. 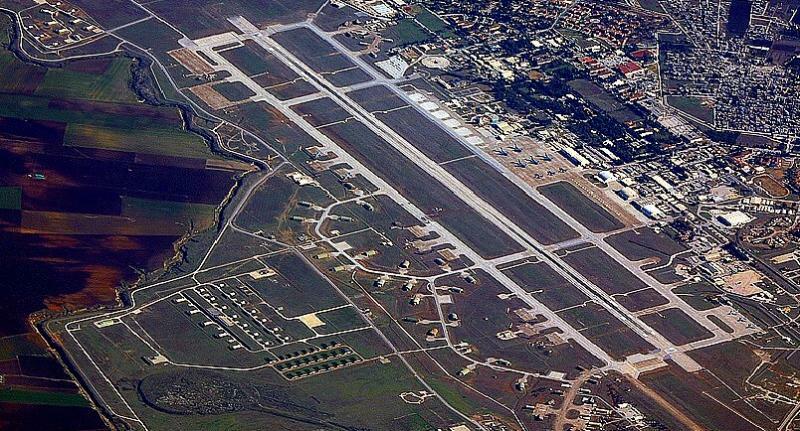 Nellis Air Force Base is a United States Air Force installation in southern Nevada with milita- ry schools and more squadrons than any other USAF base. 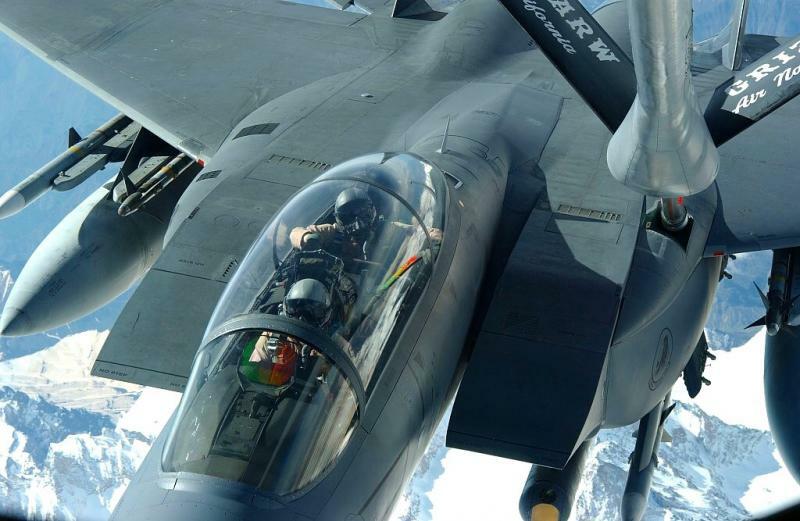 Nellis hosts air combat exercises such as Exercise Red Flag and close air support excercises such as Green Flag-West flown in Military Operations Area airspace associated with nearby Nevada Testa and Training Range. 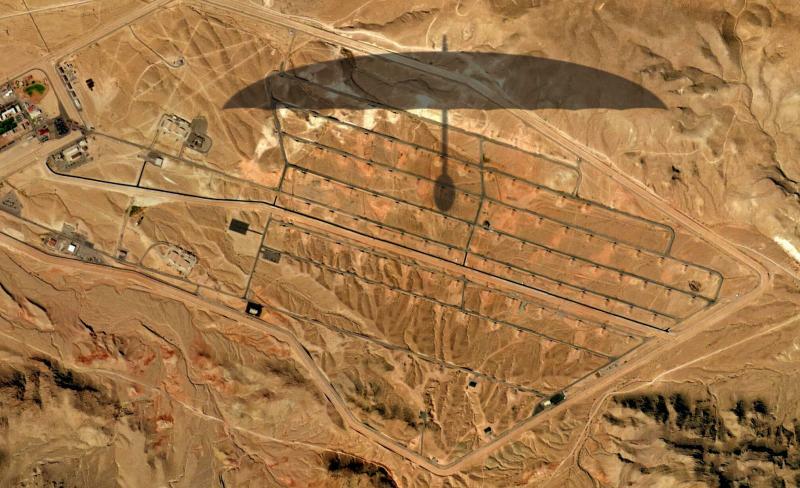 The base aslo has the Combined Air and Space Operations Center-Nellis. 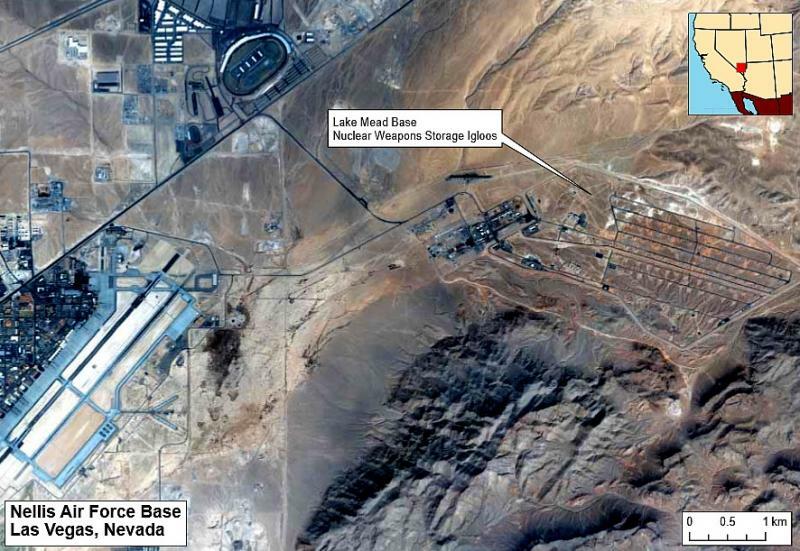 Nellis Air Force Base, north of Las Vegas, serves as one of two main Air Force nuclear weap- ons general depots in the United States, the other is at Kirtland Air Force Base in New Mexi- co. Nuclear weapons are stored at the Nellis Area 2 formerly Lake Mead Base at a remote section of the Nellis complex. 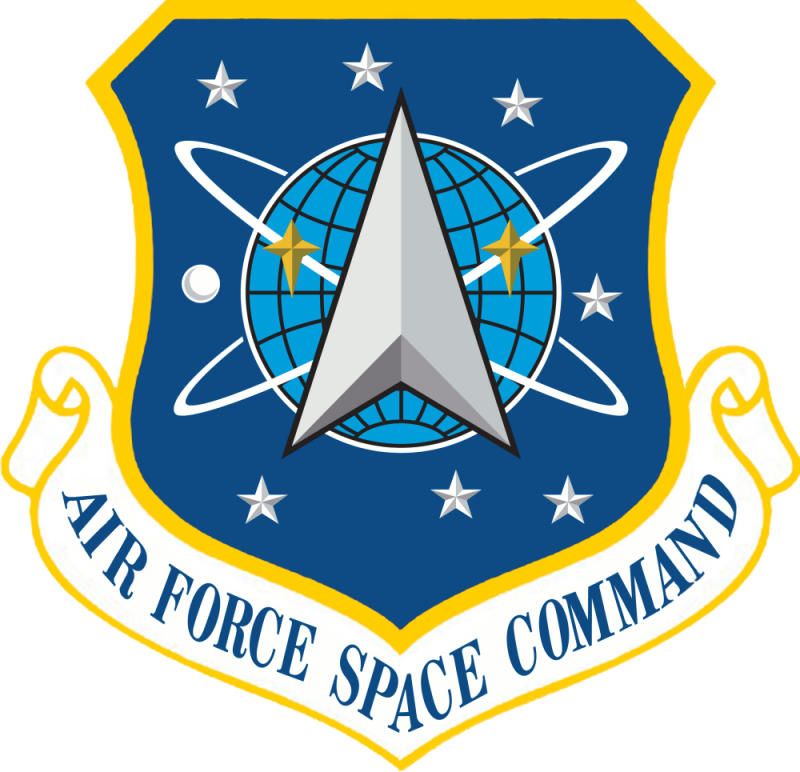 They are overseen by the 896th Munitions Squadron, a unit of the Air Force Materiel Command, though the nuclear facility is operated jointly for the Air Force Materiel Command and the Air Combat Command. 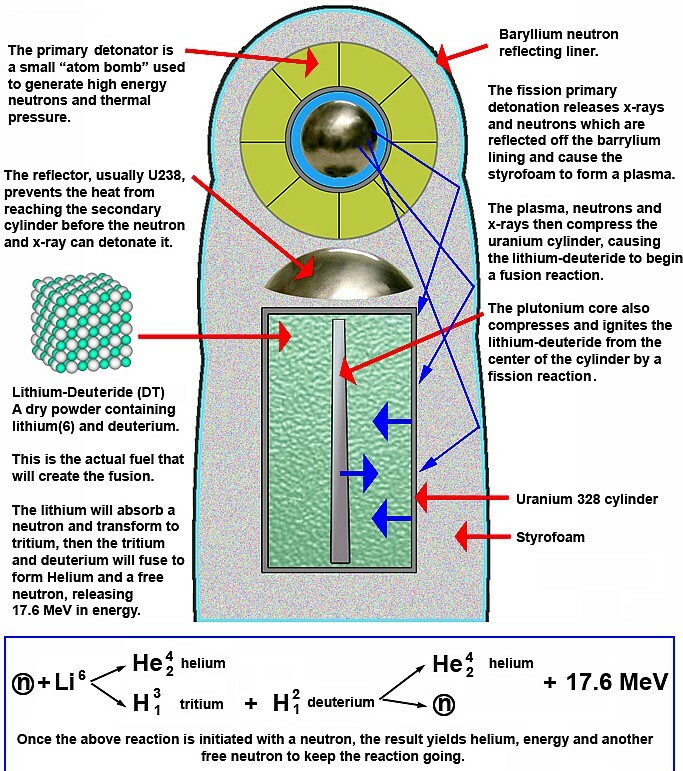 In June 2004, the Bush administration announced that﻿ it would reduce the nuclear stock- pile from the current level of 10,000 warheads to approximately 6,000 by 2012. 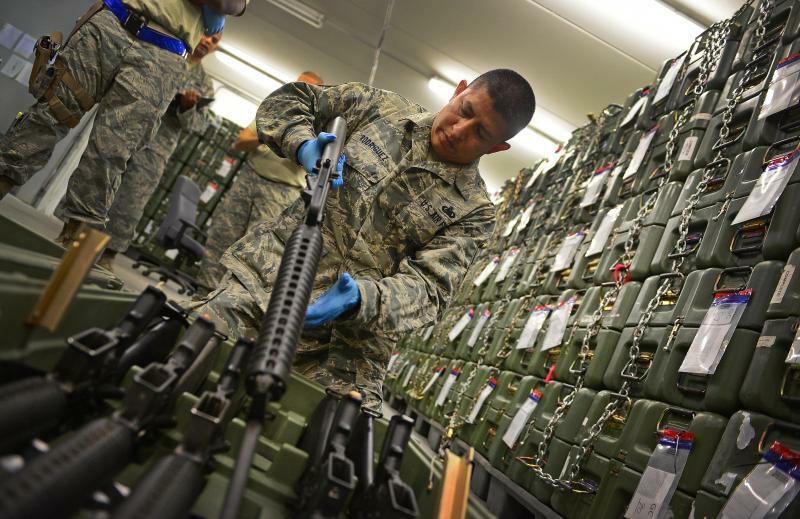 While these reductions are a positive step, an arsenal of 6,000 weapons is still many times larger than what is sufficient to fulfill the limited role of deterrence. Thousands of these weapons will remain on high alert, while the rest will still be stored at bases, some of which are near ma- jor urban centers. 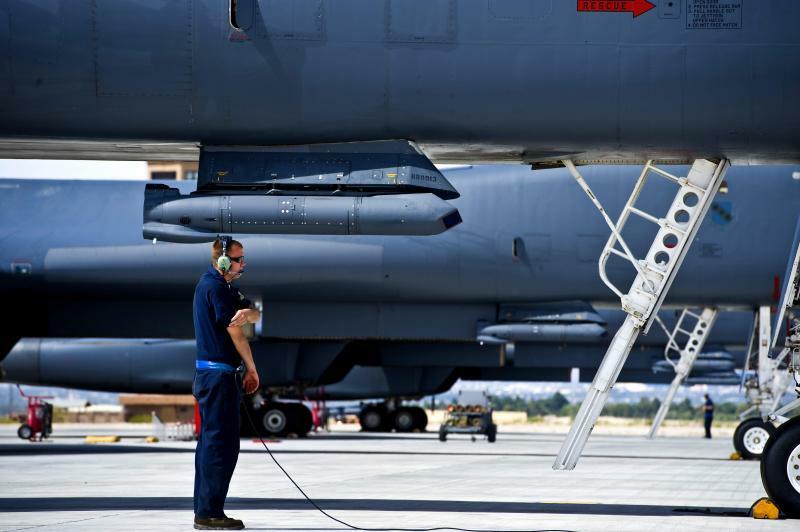 Well over 1000 nuclear warheads of several types are stored at Nellis, including the B61-4, B61-7, and B83-1 bombs. 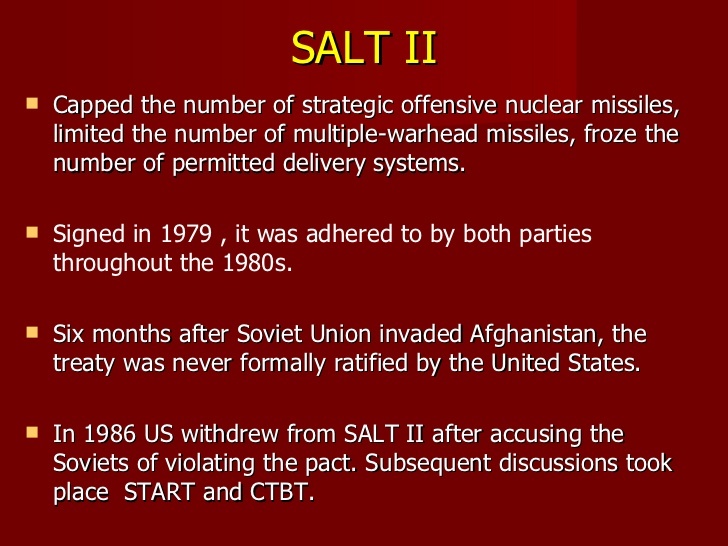 There are also W80-1 warheads from air-launched cruise missiles. 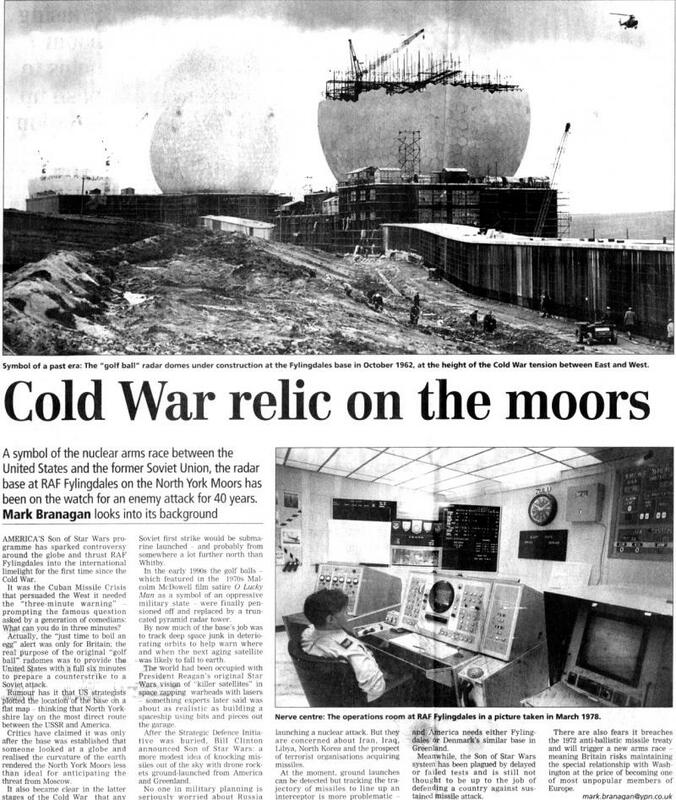 ﻿Construction of the silos at Fort Greely began in July 2002, following the demise of the Anti Ballistic Missile Treaty. 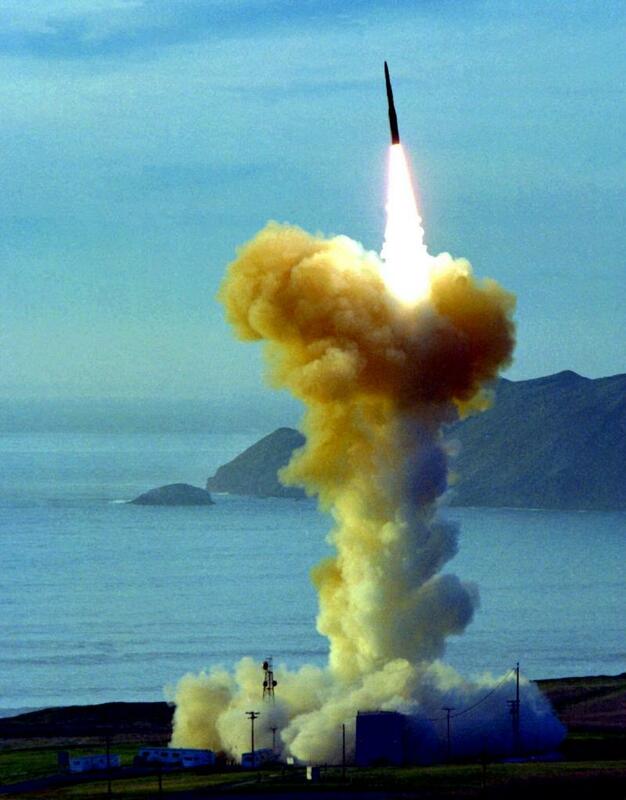 The silos will house interceptor missiles for the U.S. ground-based, midcourse national missile defense system designed to shoot down ballistic missiles that North Korea might deploy sometime in the future. 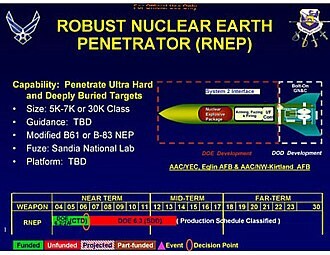 Under current plans, 20 interceptors will be in place at Vandenberg Air Force Base in California and at Fort Greely by the end of 2005. 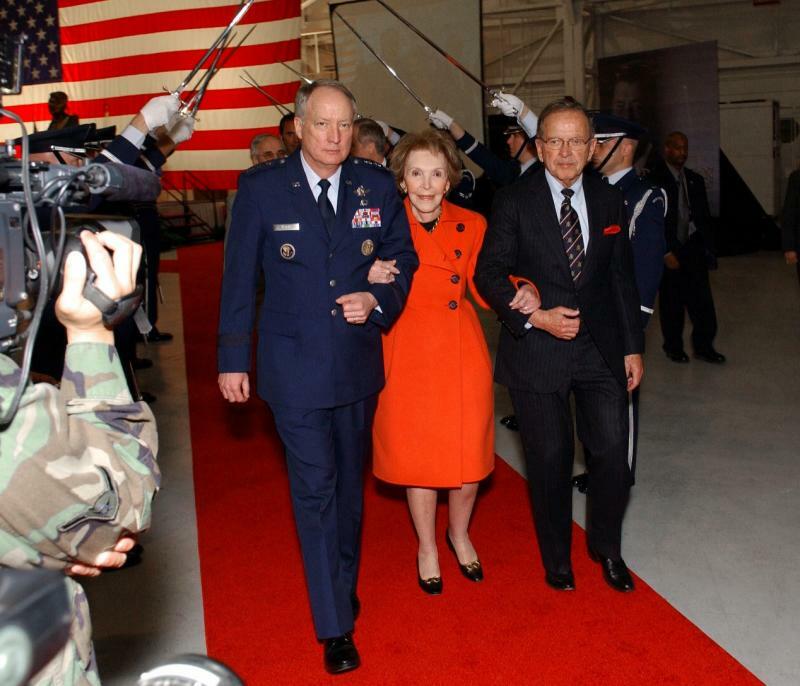 Lt. Gen. Frank G. Klotz addresses the more than 500 military and civilians attending the Ronald W. Reagan Missile Defense Site dedication ceremony at Vandenberg Air Force Base, Calif., on Monday, April 10, 2006. 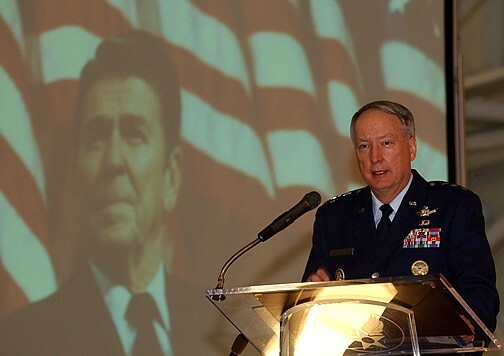 General Klotz is vice commander of Air Force Space Command. 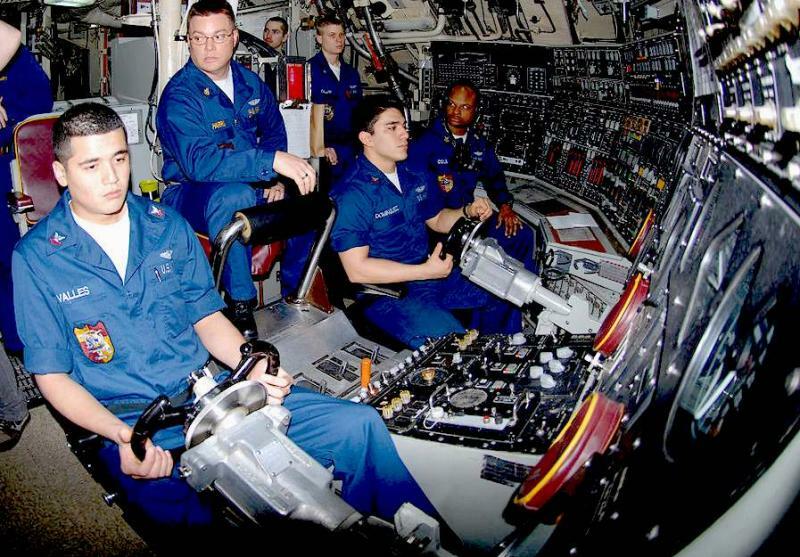 Wing personnel also support the Service's LGM-30G Minuteman III Intercontinental Ballistic Missile. Force Development Evaluation program. 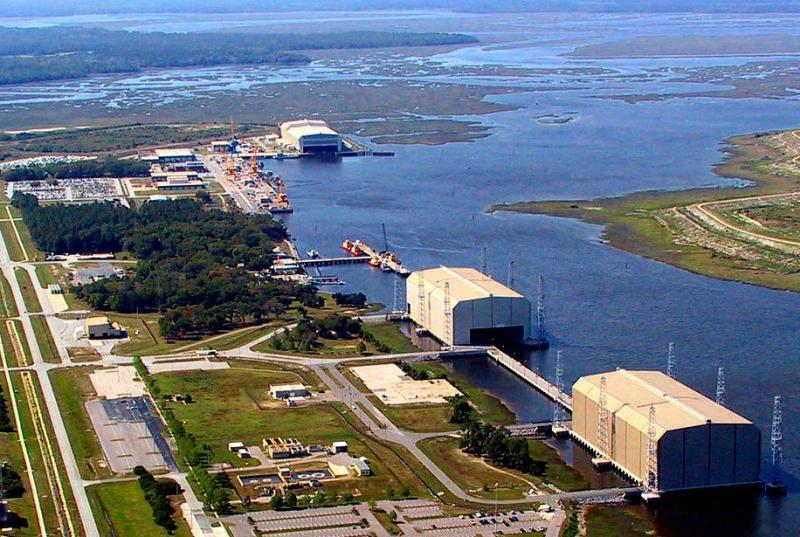 In addition to its military mission, the base also leases launch pad facilities to Space X as well as 100 acres leased to the California Spa- ceport 1995. 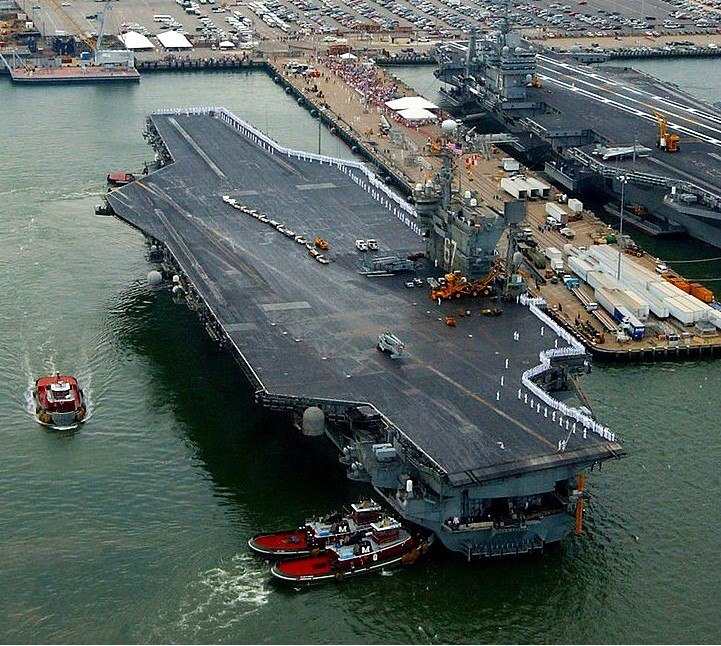 ﻿Naval Station Norfolk is a United States Navy base in Norfolk Virginia. 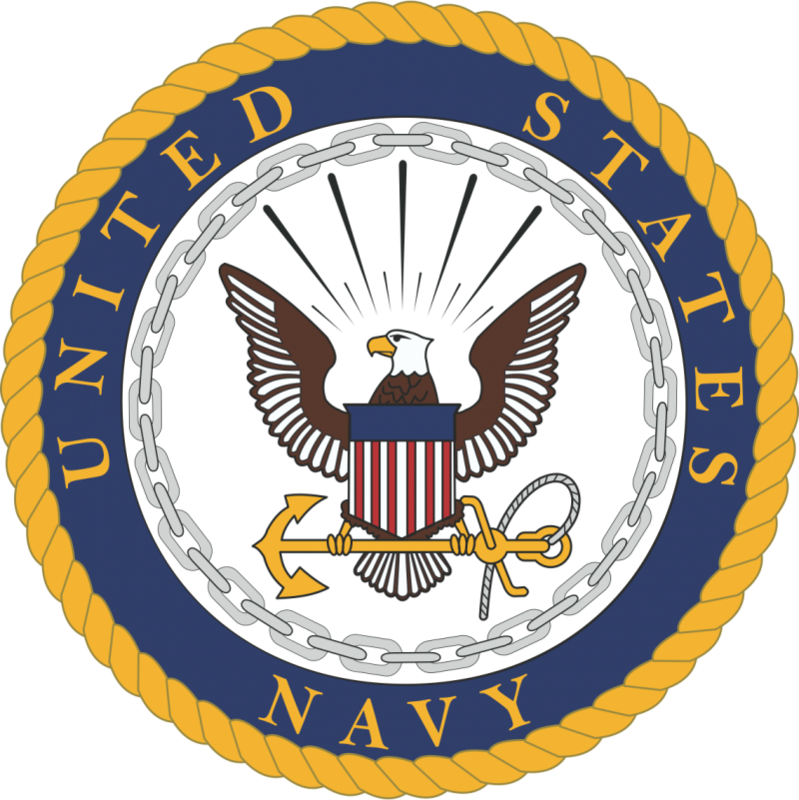 It supports naval forces in the United States Fleet Force Command those operating in the Atlantic Ocean, Mediterranean Sea and Indian Ocean. 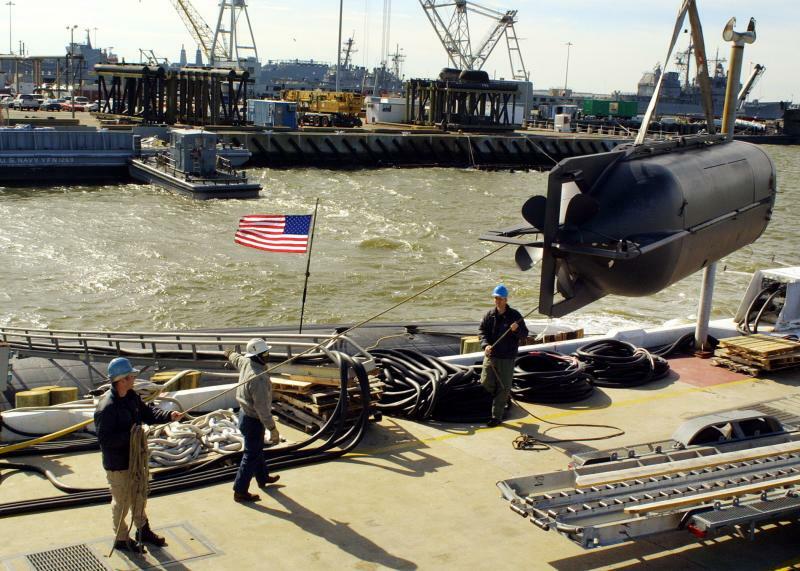 Naval Station Norfolk, also known as the Norfolk Naval Base, occupies about 6 km of waterfront space and 11 km of pier and wharf space of the Hampton Roads peninsula known as Swells Point. 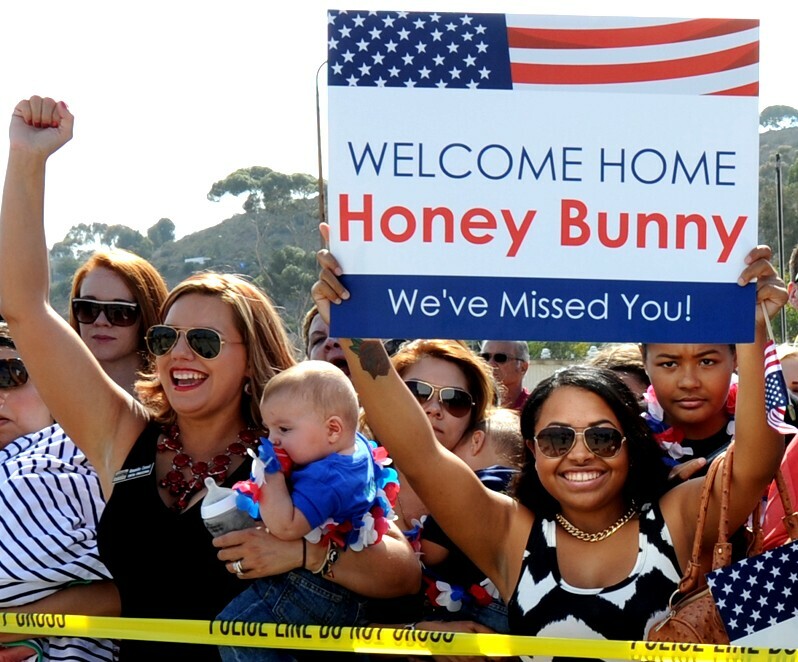 May 3rd 2016, family members of a Sailor assigned to the amphibious transport dock ship USS Arlington (LPD 24) wait pier side for the ships homecoming. 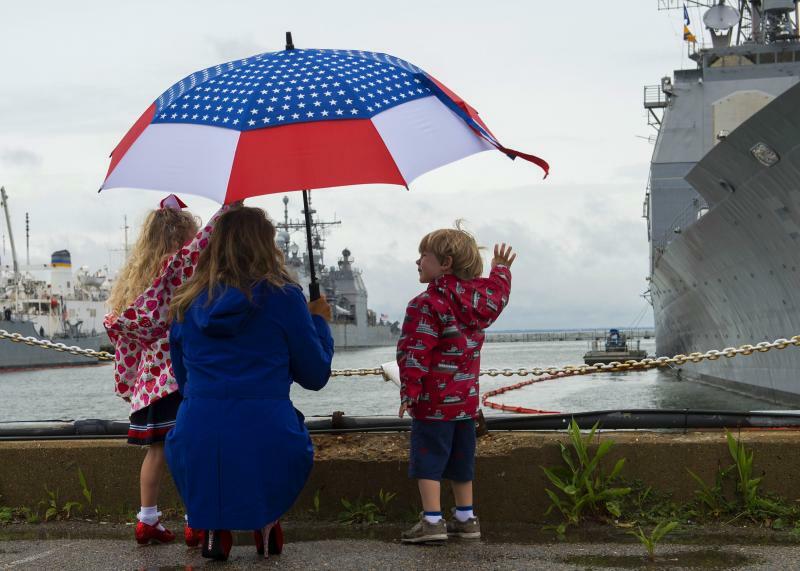 USS Arlington arrives at Naval Sta- tion Norfolk as part of the Kearsarge Amphibious Ready Group (KSG ARG) homecoming in sup- port of maritime security operations and theater security cooperation efforts in the U.S. 5th and 6th Fleet areas of responsibility. ﻿Norways new "Rolls Royce" Electronic Intelligence (ELINT) ship, Marjata IV in Norfolk, being outfitted with the latest in electronics. 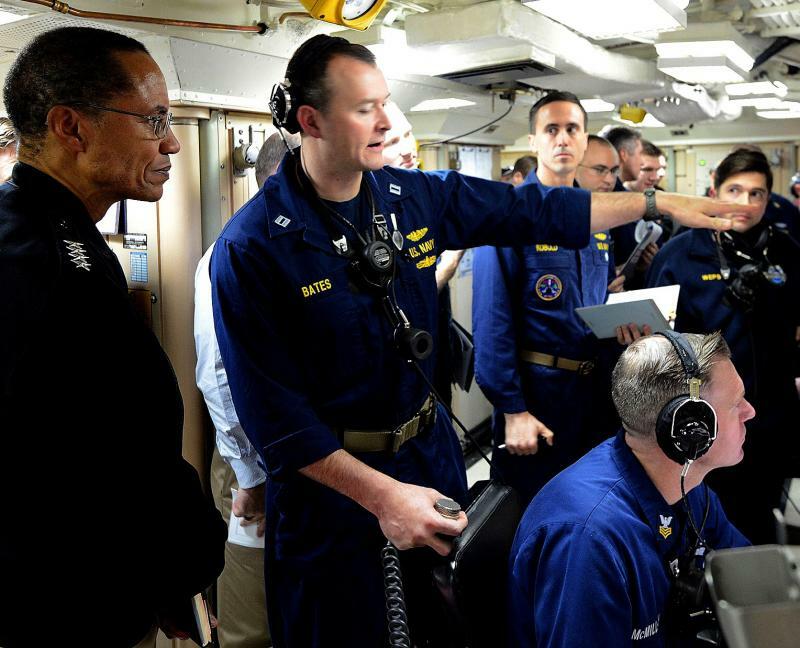 Below, Sonar Technician 1st Class Robert Moe describes the top side characteristics of the Los Angeles-class attack submarine USS Newport News (SNN 750) to a group of first-year officer cadets from the Royal Norwegian Academy. The cadets arrived at Naval Station Norfolk onboard the tall ship HNoMS Statsraad Lehmkhul, the world's largest three-masted barque. Norfolk November 16, 2011. 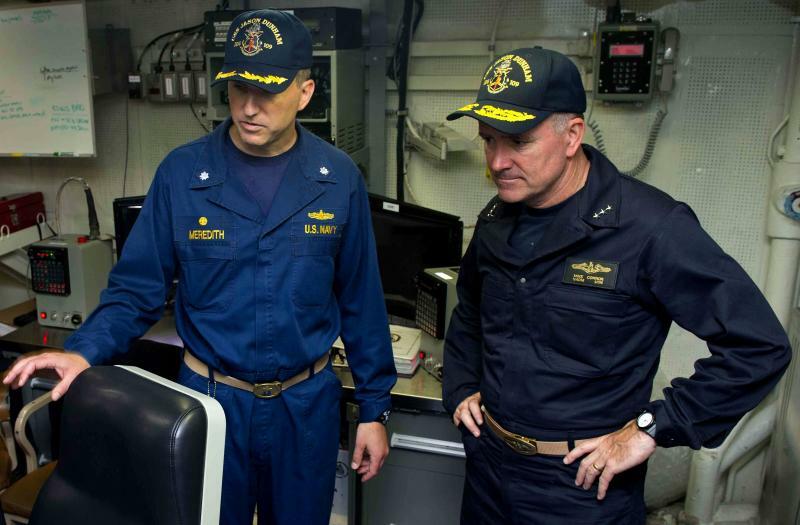 Commander, Submarine Force Atlantic (COMSUBLANT) is the Submarine Force U.S. Atlantic Fleet type commander under the United States Fleet Forces Command. 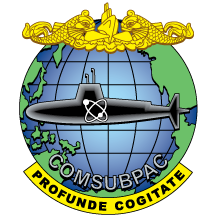 The principal res- ponsibility of the Admiral commanding is to operate, maintain, train, and equip submarines. 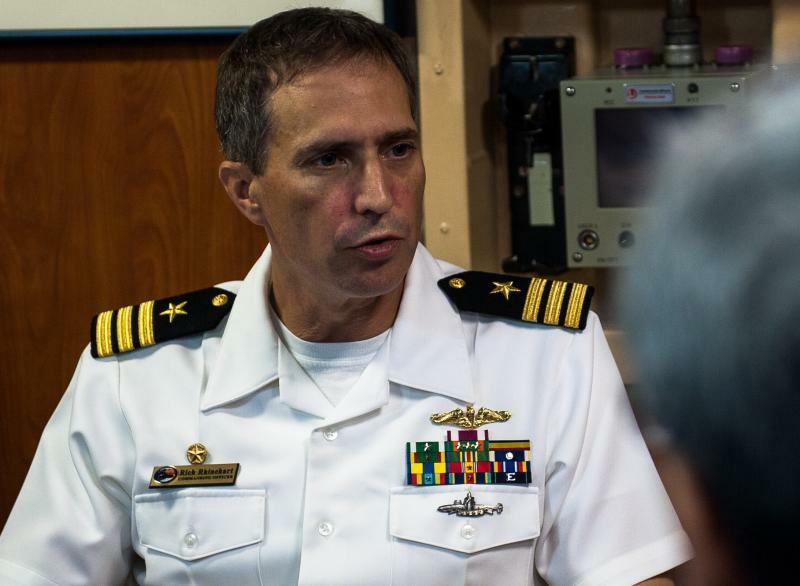 COMSUBLANT also has additional duties as commander of NATO's Allied Submarine Com- mand and also Commander, Naval Submarine Forces. 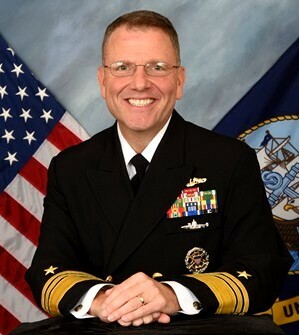 Vice Admiral Donnelly assumed his current duties in February 2007. 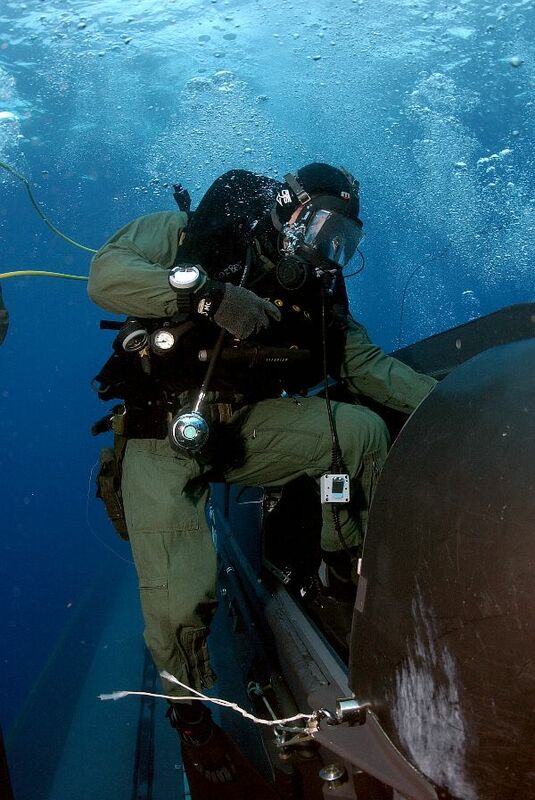 As commander, Subma- rine Forces he leads the Undersea Enterprise and is responsible for establishing force wide strategies on core submarine issues such as force structure, budgetary requirements, and manpower. 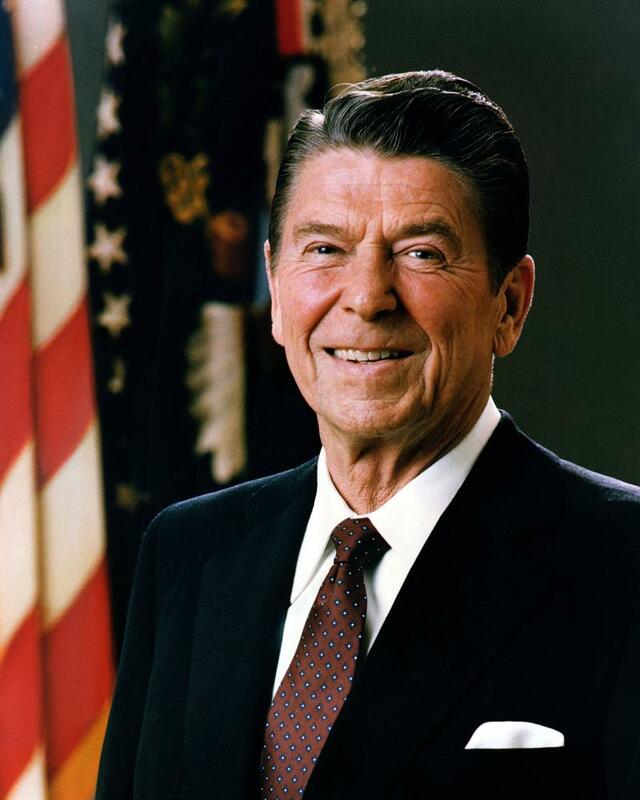 His awards and decorations include the Distinguish Service Medal, Defense Superior Service Medal, Legion of Merit (four awards), Meritorious Service Medal (two awards), Navy and Marine Corps Commendation Medal (six awards), Navy and Marine Corps Achievement Medal and various unit and campaign awards﻿. 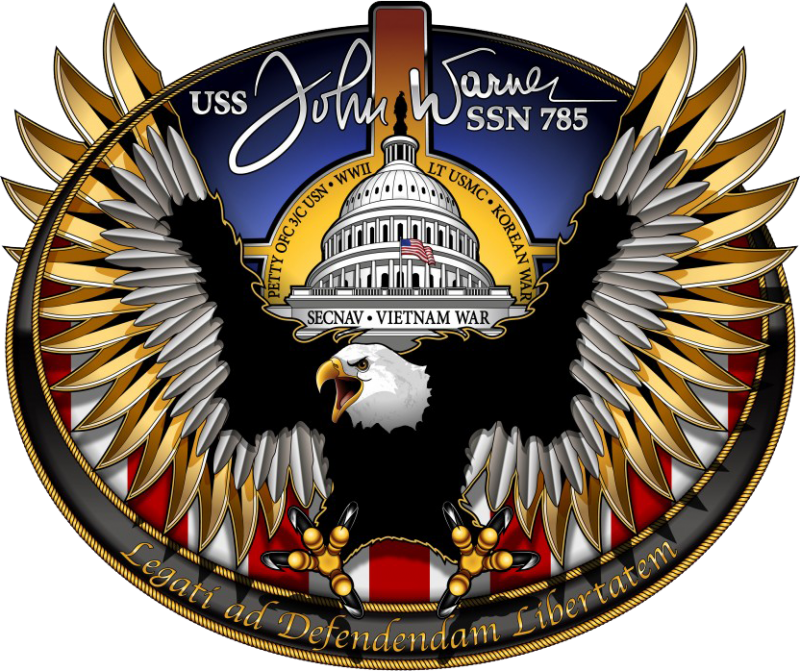 The Virginia class, also known as the SSN-774 class, is a new class of nuclear pow- ered fast attack submarine in service for the United States Navy. 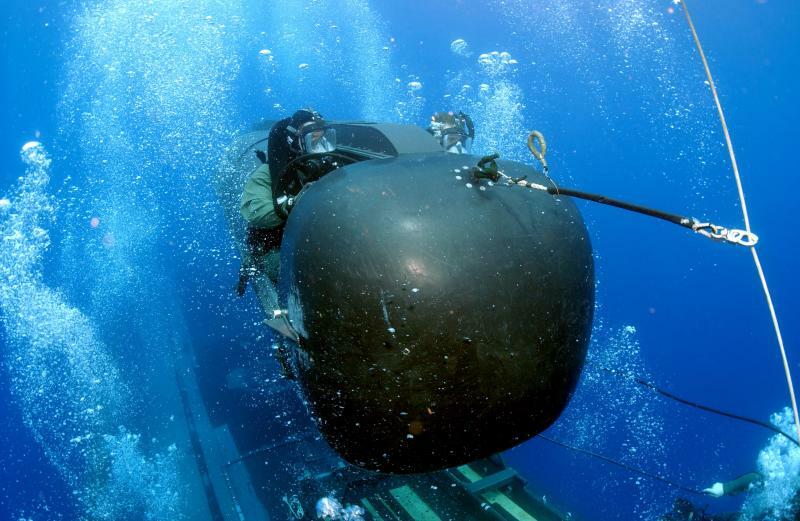 The submarines are designed for a broad spectrum of open-ocean and littoral missions. 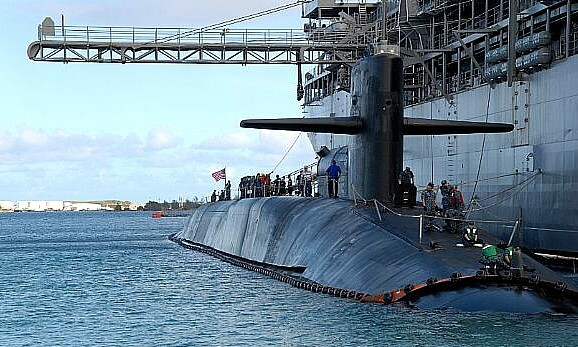 They are replace- ing the older Los Angeles class submarines, many which have already been decom- missioned. 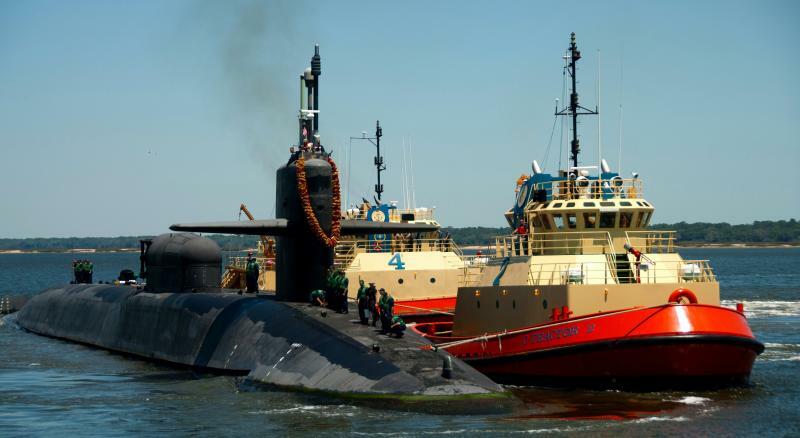 Virginia class submarines will be aquired through 2043 and are expected to remain in service past 2060. 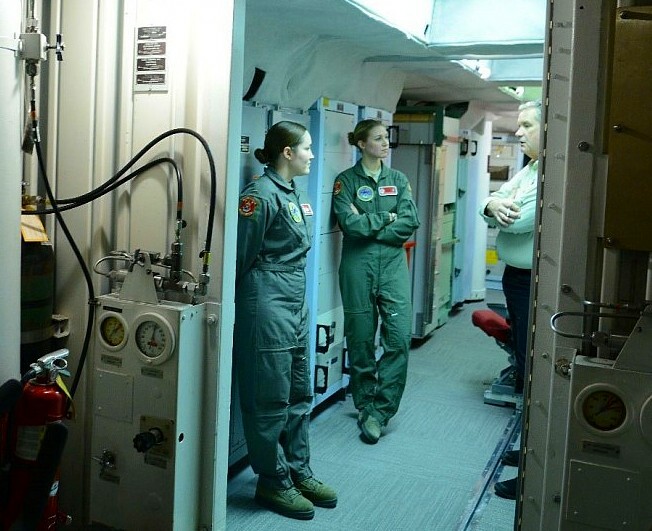 Machinist Mate 2nd Class Jordan Dobbs, from Orlando, inspects a torpedo silo aboard the Virginia class fast attack submarine USS North Carolina﻿. 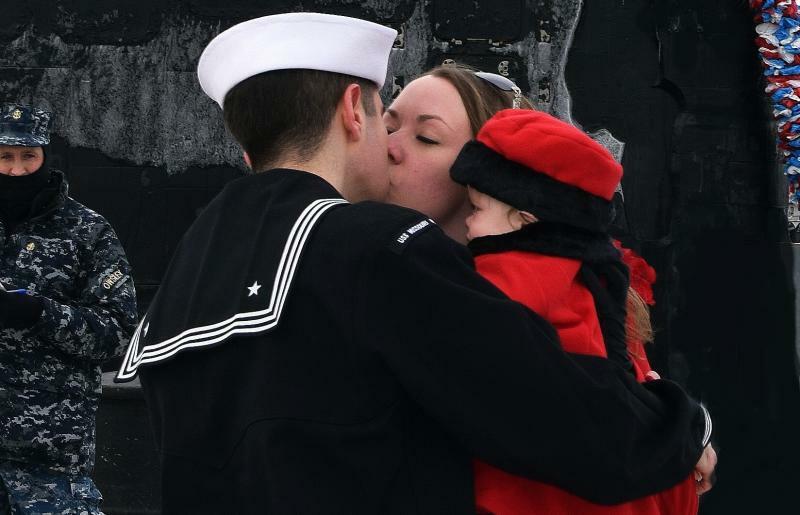 Katy Slavin gives her husband Petty Officer 1st Class Michael Slavin Jr. the ceremo- nial first kiss during the Virginia-class, nuclear-powered fast attack submarine USS Missouris﻿. 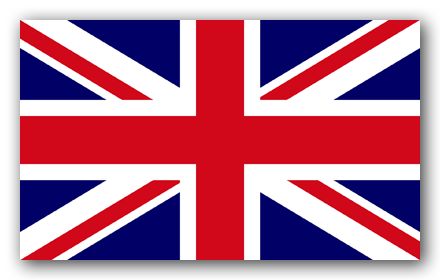 UK represents the territory internationally. 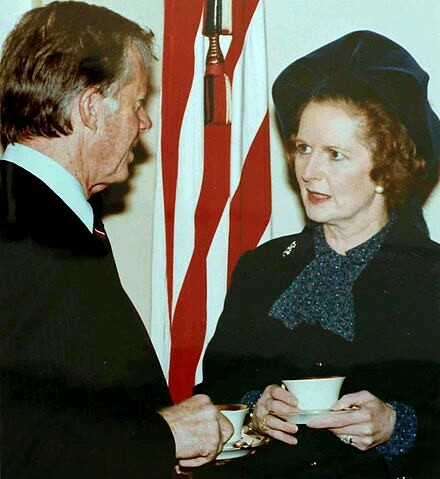 A local government as normally envisioned does not exist.Rather, the administration is represented in the territory by the officer command- ing British Forces on Diego Garcia, the "Brit rep". 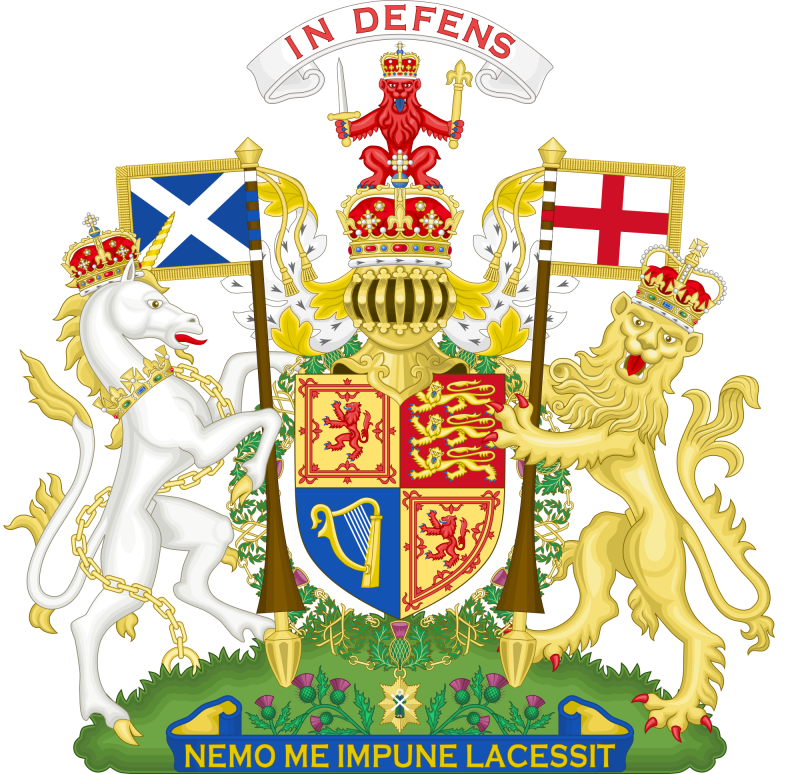 Laws and regulations are promulgated by the commissioner and enforced in the BIOT by the Brit representative. 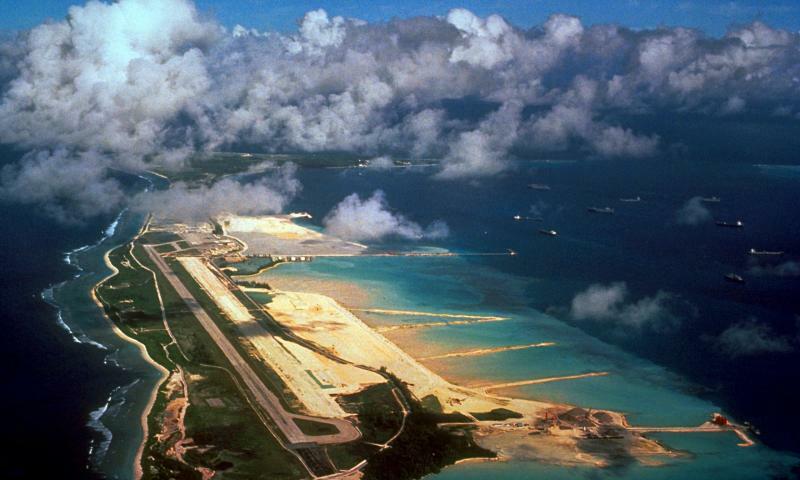 Of major concern to the BIOT administration is the relationship with the United States mili- tary forces resident on Diego Garcia. 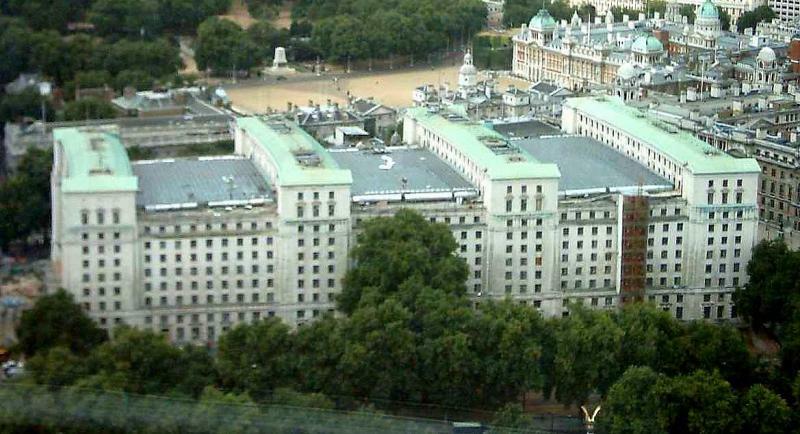 An annual meeting called "The Pol-Mil Talks",for "polit- ical-military", of all concerned is held at the Foreign and Commonwealth Office in London to resolve pertinent issues. These resolutions are formalised by an "Exchange of Notes", or, since 2001, an "Exchange of Letters". 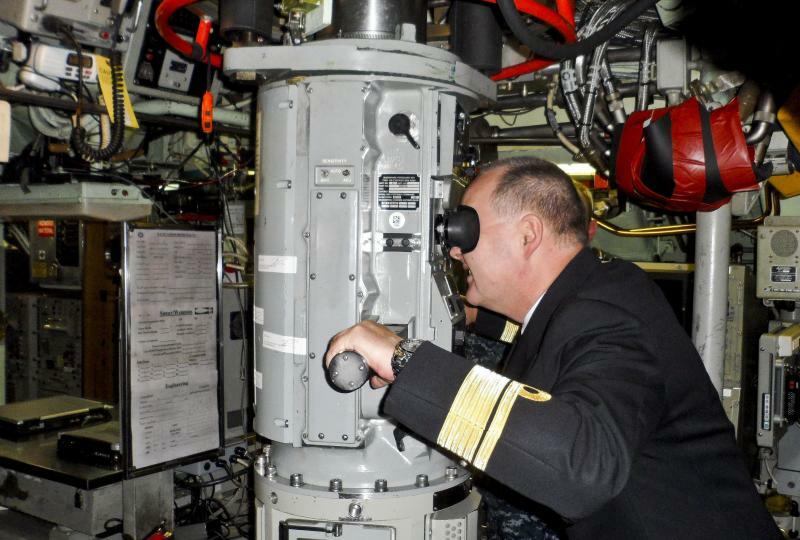 The very fast and quiet U.S. Los Angeles Class Attack Submarine with Toma- hawk Conventional or Nuclear ﻿Cruice Missiles ﻿Rear Admiral Bernt Grimstvedt, Chief of the Norwegian Navy, looks through the periscope of the Los Angeles class, very fast and quiet, USS Miami, attack submarine. 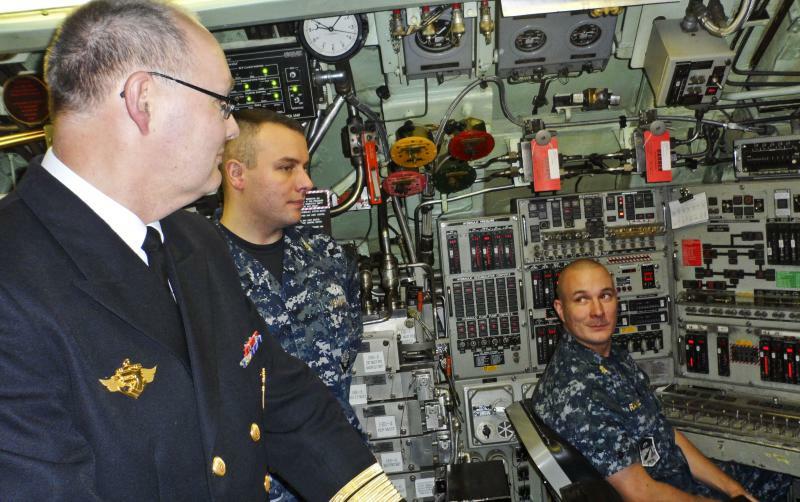 ﻿Rear Adm. Bernt Grimstvedt chief of the Royal Norwegian navy, speaks with Sailors assigned to the Los Angeles-class submarine USS Miami while during tour. A portside bow view of the fore section oftied USS Santa Fe up at the pier. 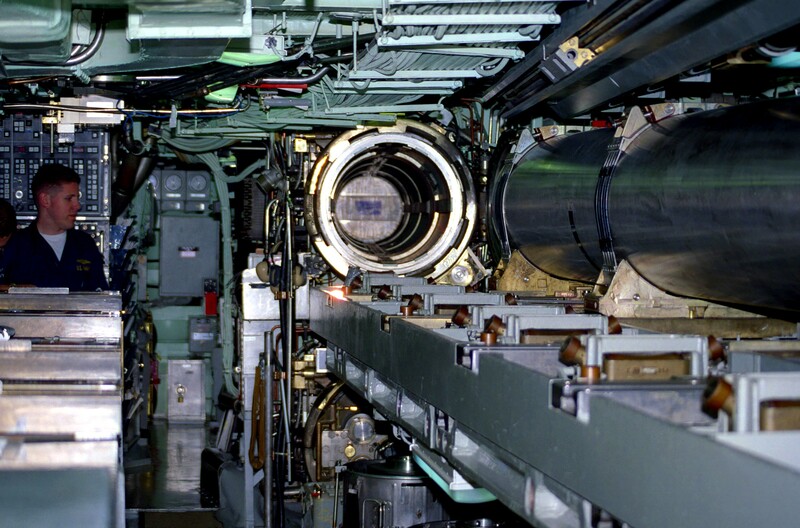 The doors of the Mark 36 Vertical Launch System for the Tomahawk missiles are in the "open" position. 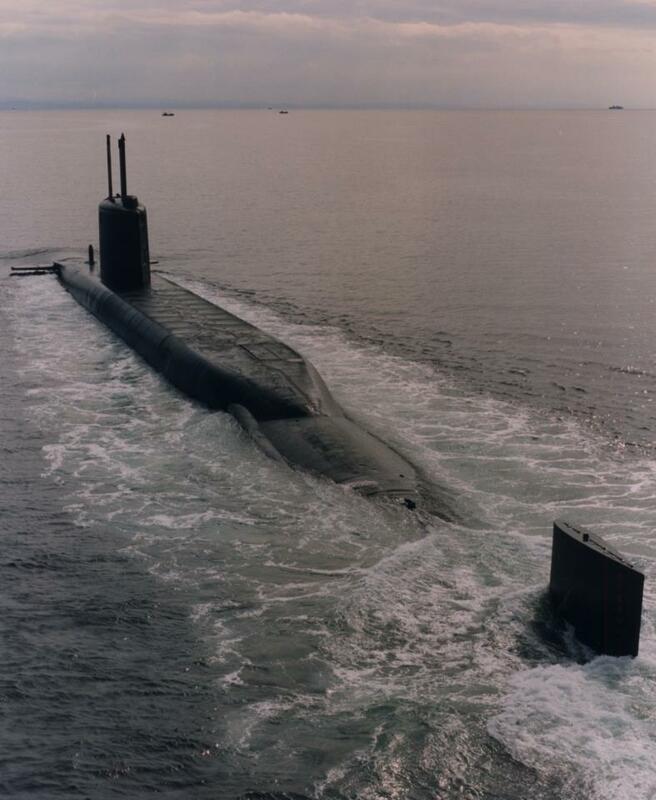 In 1973, the Navy announced the selection of the Bangor base as the home port for the first squadron of Ohio-class Trident Fleet Ballistic Misile submarines. 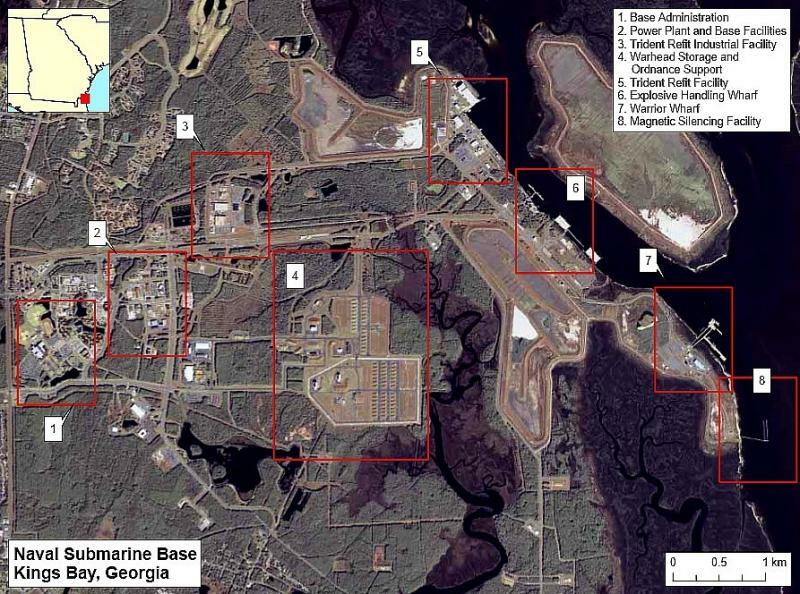 On February 1, 1977 the Trident Submarine Base was officially activated. 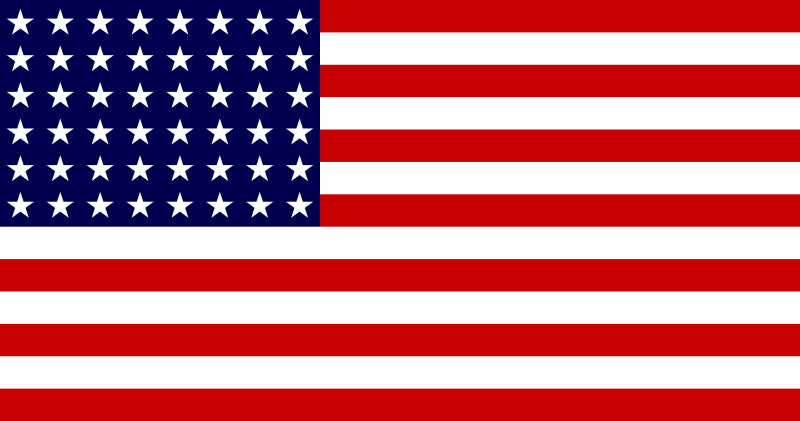 ﻿﻿﻿U.S. 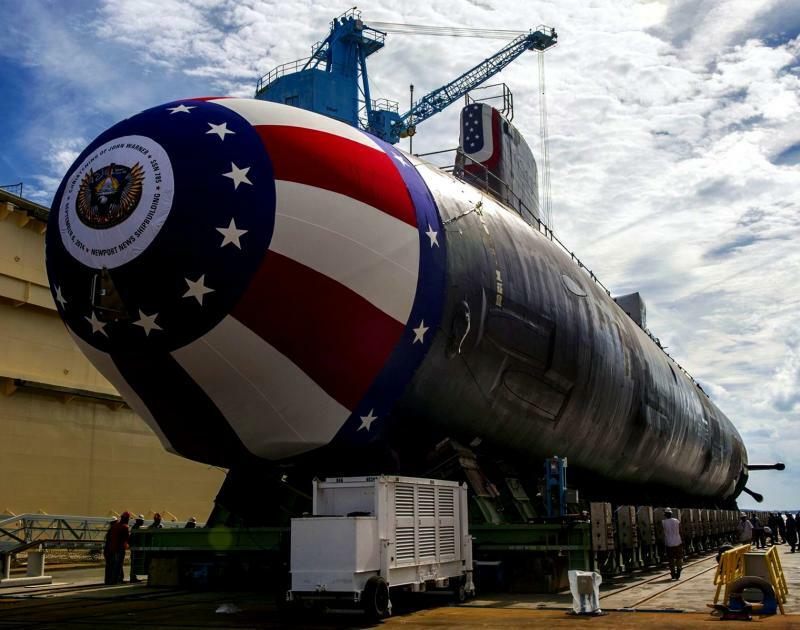 Navy Machinists Mate Helm, Ohio class Trident II D5 nuclear deterrent submarine. 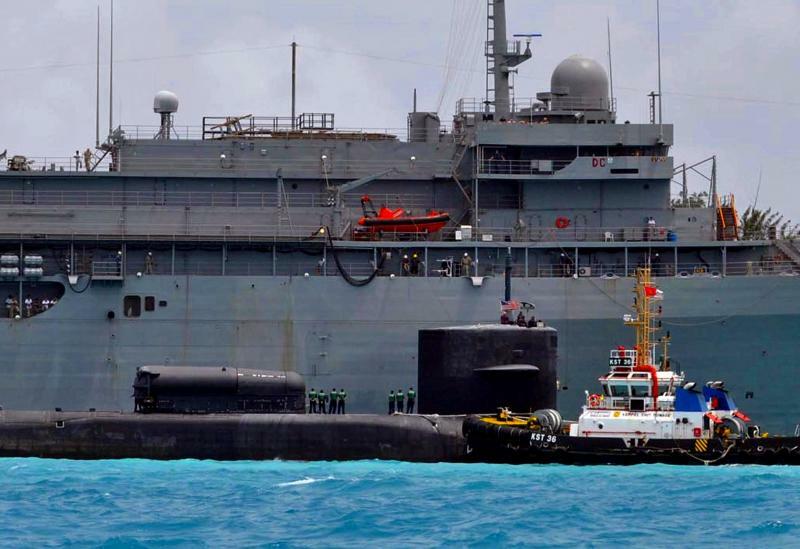 ﻿At any given time, a half dozen or more U.S. ballistic missile submarines patrol Atlantic and Pacific waters. 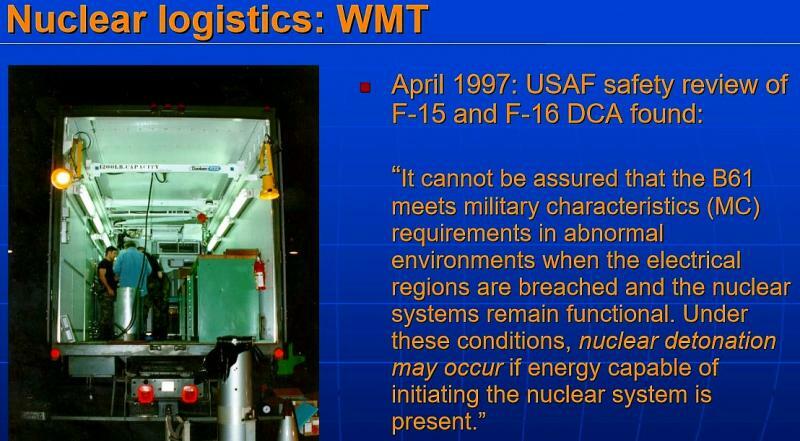 The U.S. nuclear war plan requires that their warheads cover designated targets at all times, regardless of the altered relationship with Russia. 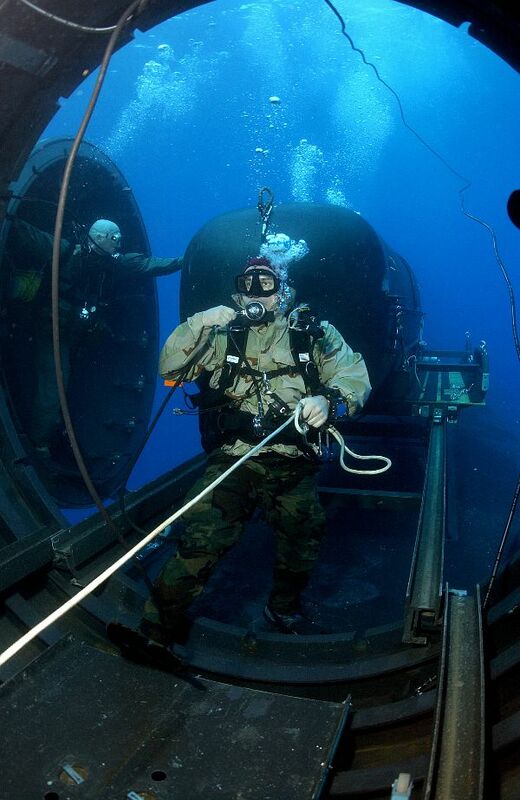 Thus, the submarines are main- tained at high levels of alert approaching the tempo of the Cold War. ﻿ This operational level is excessive and could be relaxed with no loss of security. 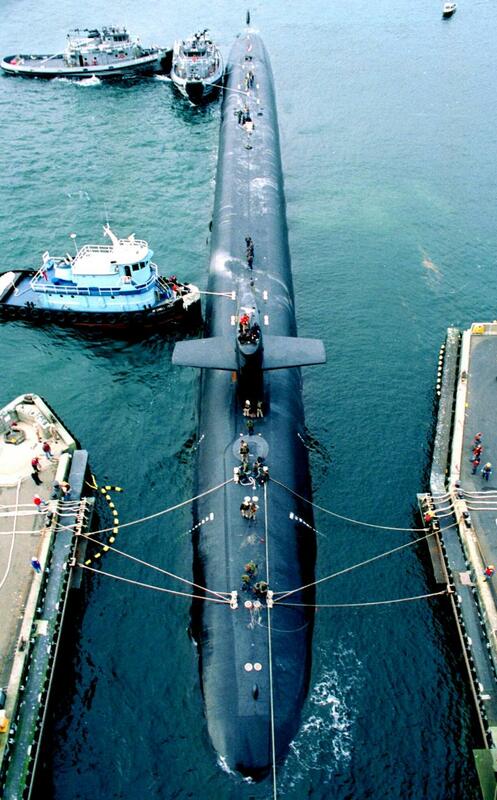 ﻿﻿The Pacific patrols are based at Naval Submarine Base Bangor located near Seattle on the Hood Canal. 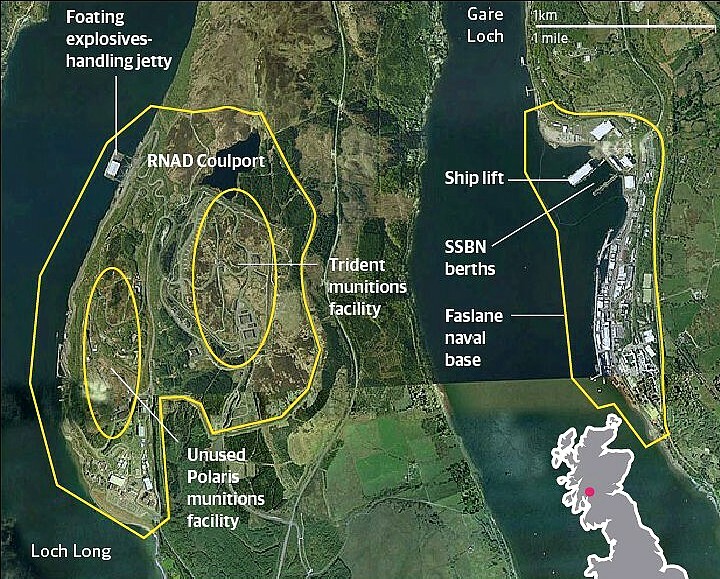 Nuclear warheads supplying the Pacific-based Trident submarines are stored at the Strategic Weapons Facility Pacific in Silverdale, part of the Bangor complex. 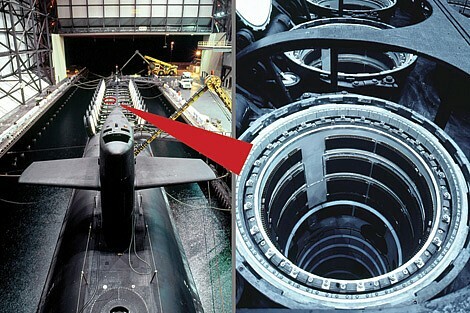 The base stores nuclear warheads for the three or four submarines that are in port or overhaul at any given time. 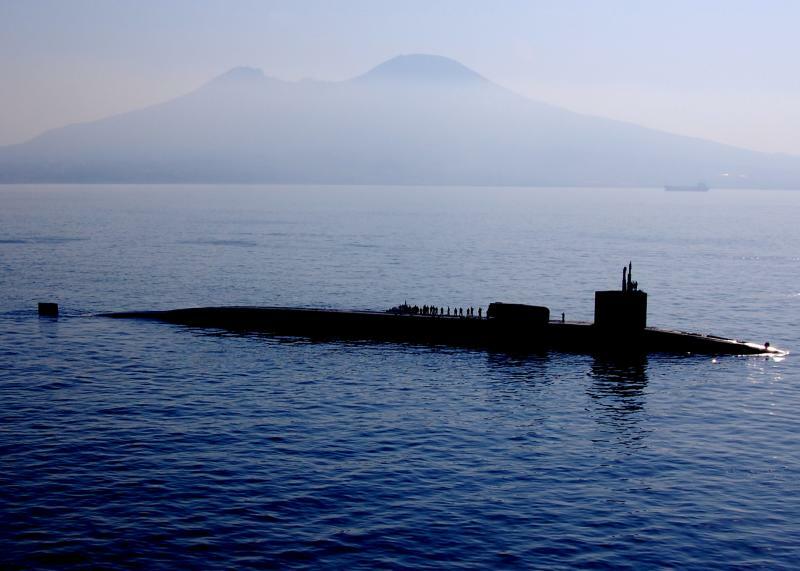 There are probably around 1,500 warheads assigned to the base, though a portion is always at sea on submarines on patrol. 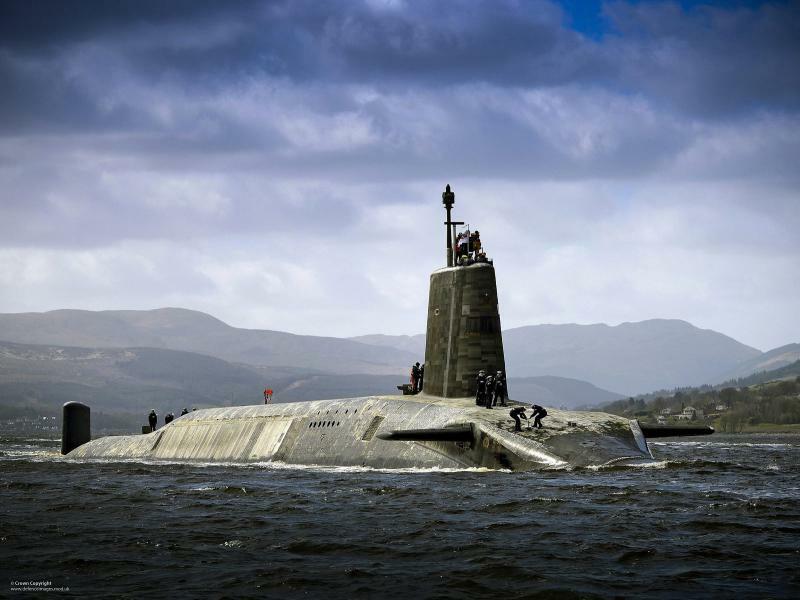 Until recently, only W76 warheads were stored at Bangor, but beginning in 2002, the number of W88 warheads has increased as Trident II missiles are back-fitted onto older submarines. 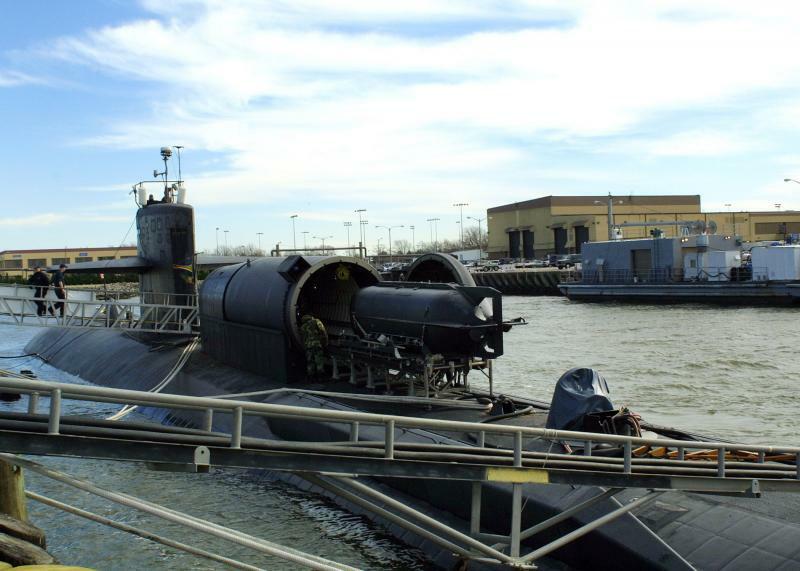 There are also W80-0 warheads for sea-launched cruise missiles that could be redeployed on attack submarines﻿﻿﻿. 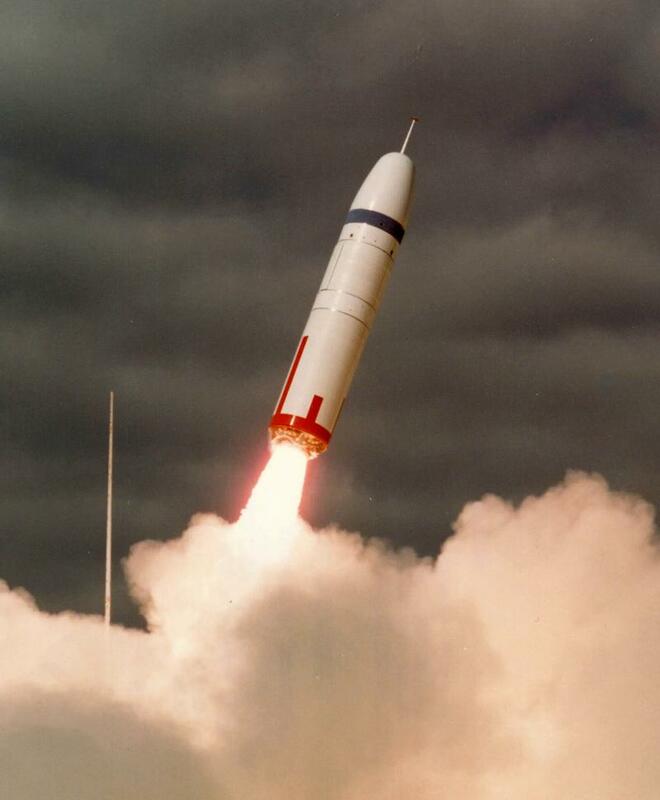 The United States Air Force and National Nuclear Security Administration completed the first development flight test of a non-nuclear B61-12 gravity bomb at Tonopah Test Range in Nevada on July 1, 2015. 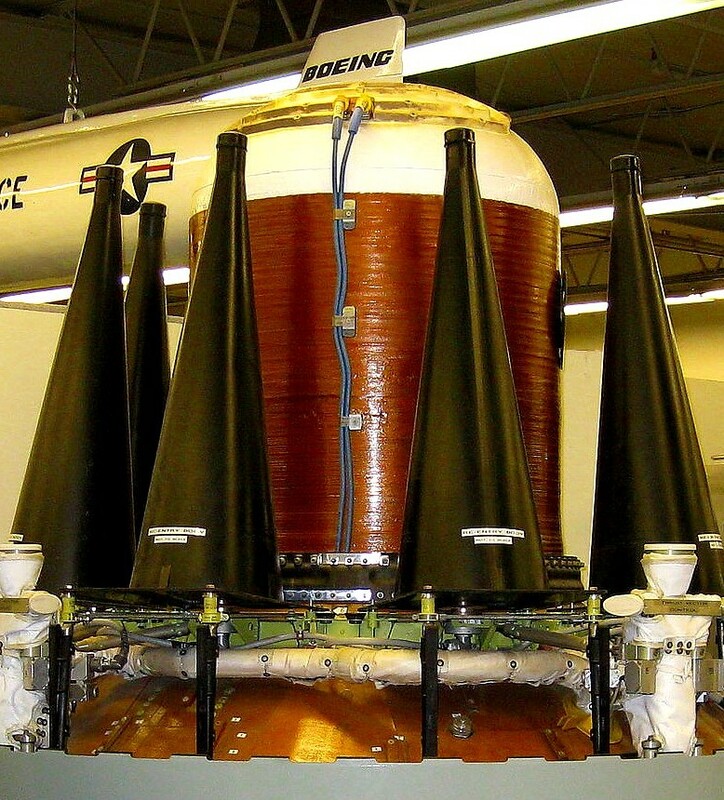 This test marks a major milestone for the B61-12 Life Extension Program, demonstrating end-to-end system performance under representative delivery conditions said NNSA Depu- ty Administrator for Defense Programs Dr. Don Cook. Achieving the first complete B61-12 flight test provides clear evidence of the nation's continued commitment to maintain the B61 and provides assurance to our allies. 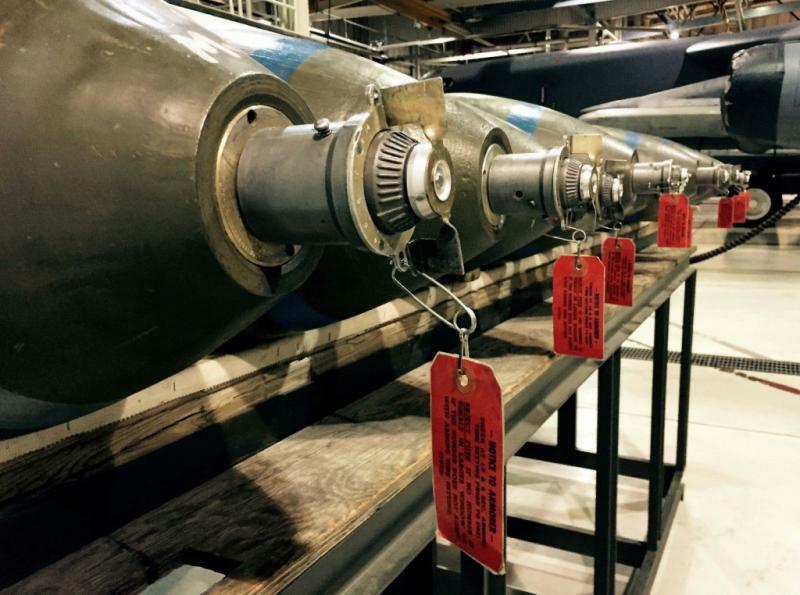 As of 1999, the U.S. was said to have 12,000 nuclear weapons of all types stockpiled. 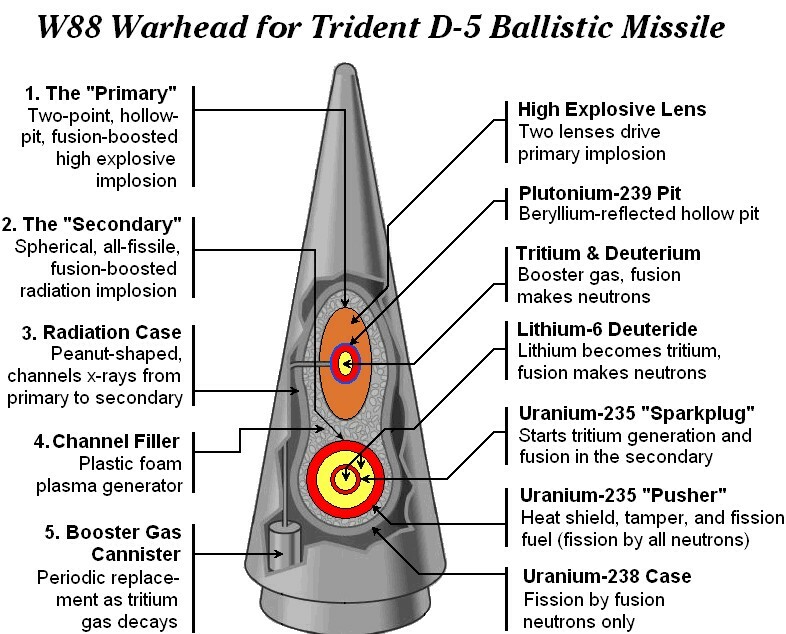 In its Strategic Arms Reduction Treaty (START) declaration for 2003, the U.S. listed 5968 deployed warheads as defined by START rules. 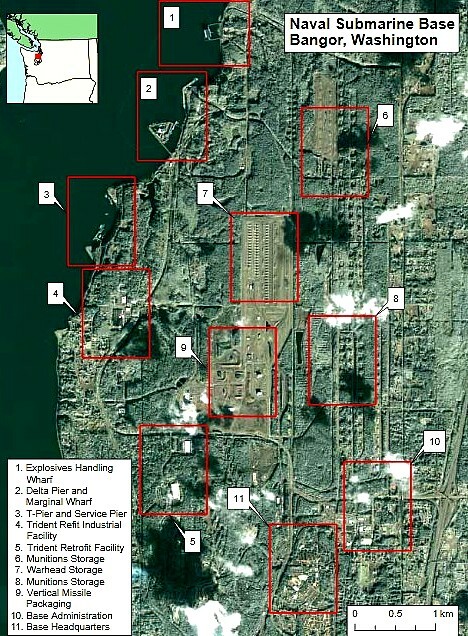 For 2007, the Bulletin of the Atomic Scientists listed the U.S. with about 5,400 total nuclear warheads: around 3,575 strategic and 500 nonstrategic war- heads; and about 1,260 additional warheads held in the inactive stockpile. 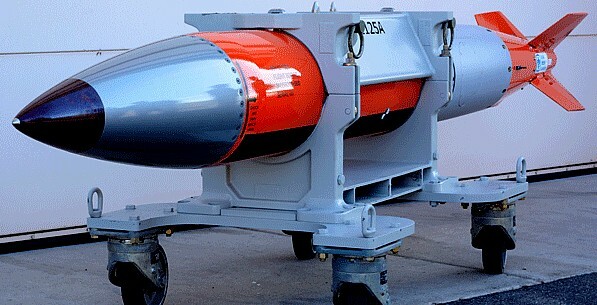 Other warheads are in some step of the disassembly process. The exact number as of Sept. 30, 2009, was 5,113 warheads, according to a U.S. fact sheet released May 3, 2010. 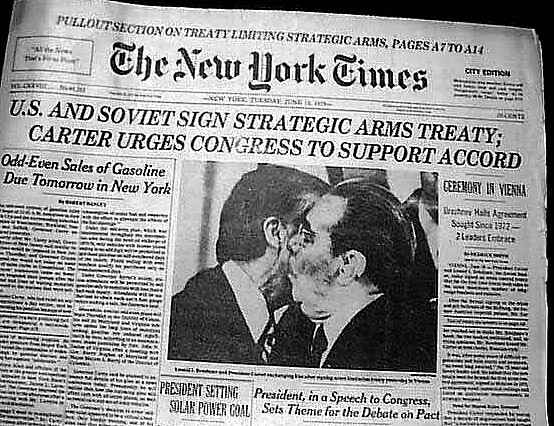 In 2002, the United States and Russia agreed in the SORT treaty to reduce their deployed stockpiles to not more than 2,200 warheads each. 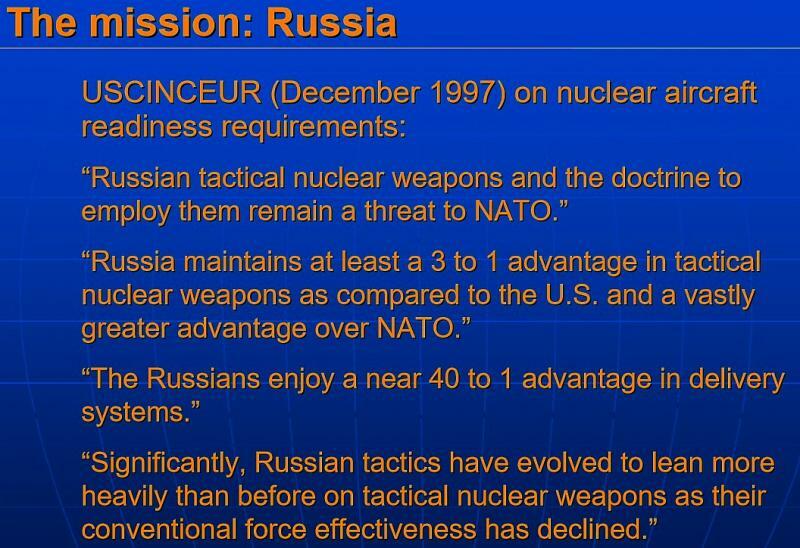 In 2003, the U.S. rejected Russian propo- sals to further reduce both nation's nuclear stockpiles to 1,500 each. 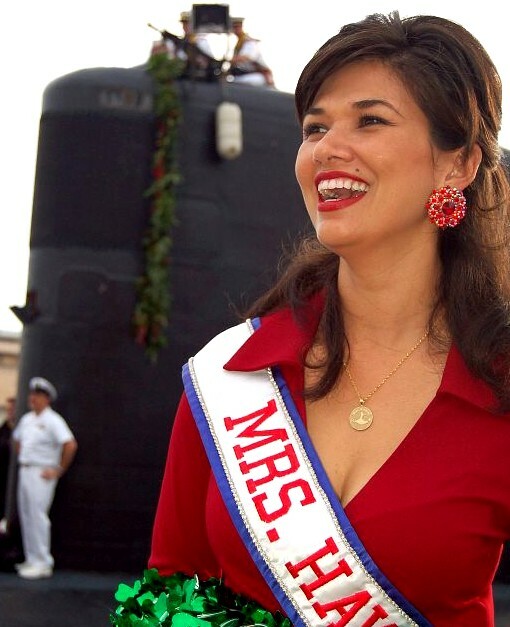 In 2007, for the first time in 15 years, the United States built new warheads. 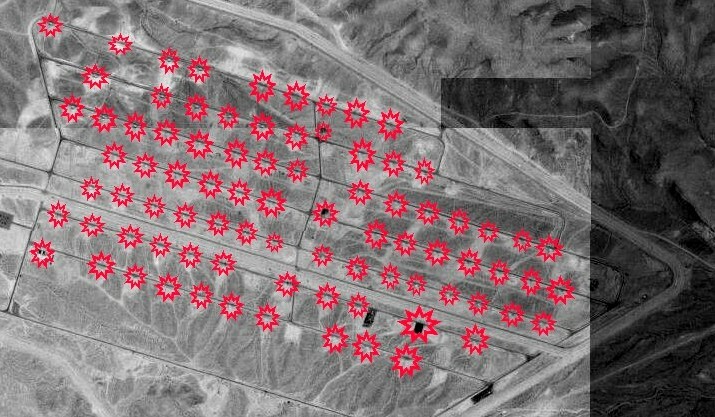 In 2014, Bulletin of the Atomic Scientists released a report, stating that there are a total of 2,530 warheads kept in reserve, and 2,120 actively deployed. 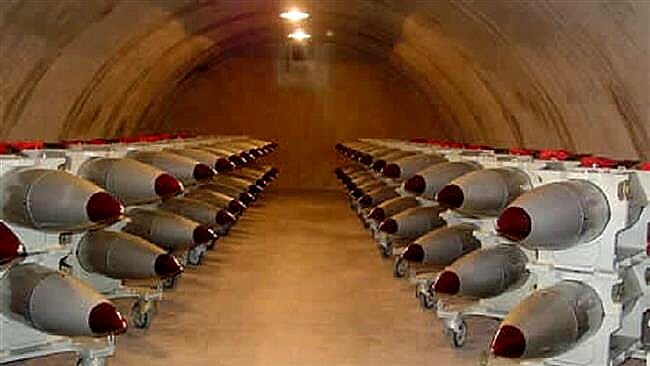 Of the warheads actively dep- loyed, the number of strategic warheads rests at 1,920, subtracting 200 bombs that are de- ployed, but are not considered "strategic". The amount of warheads being actively disabled rests at about 2,700 warheads, which brings the total United States inventory to about 7,400 warheads.